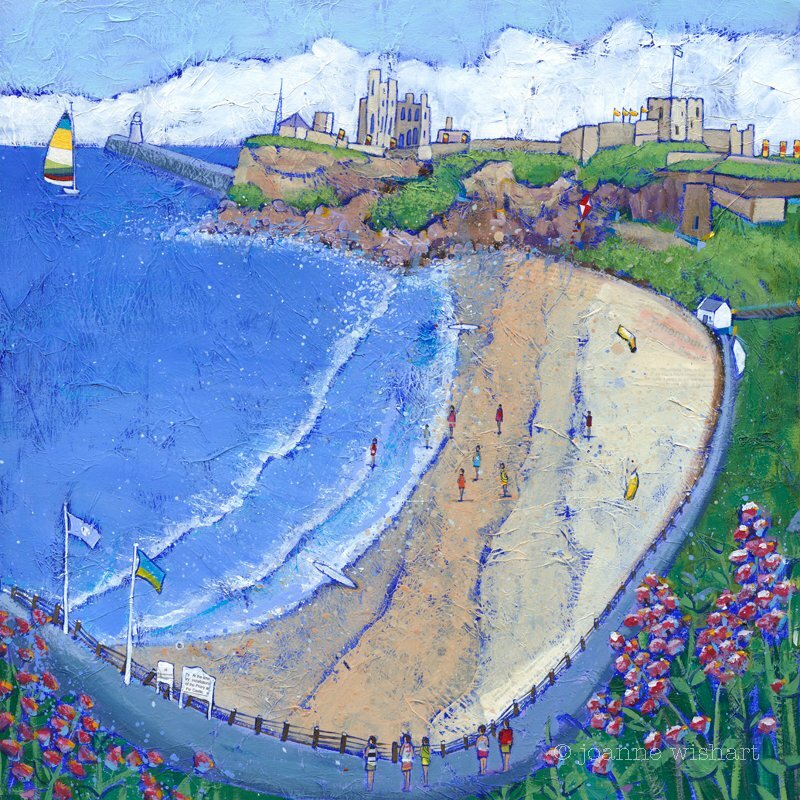 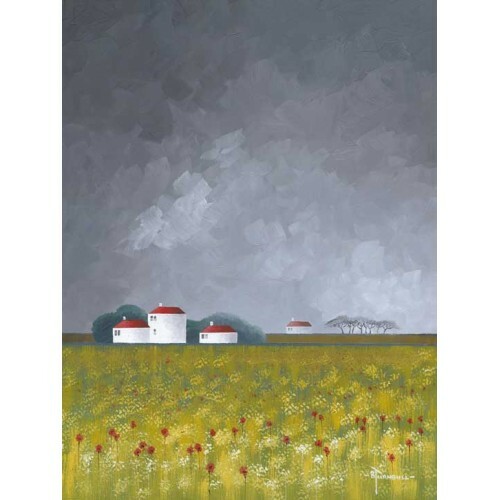 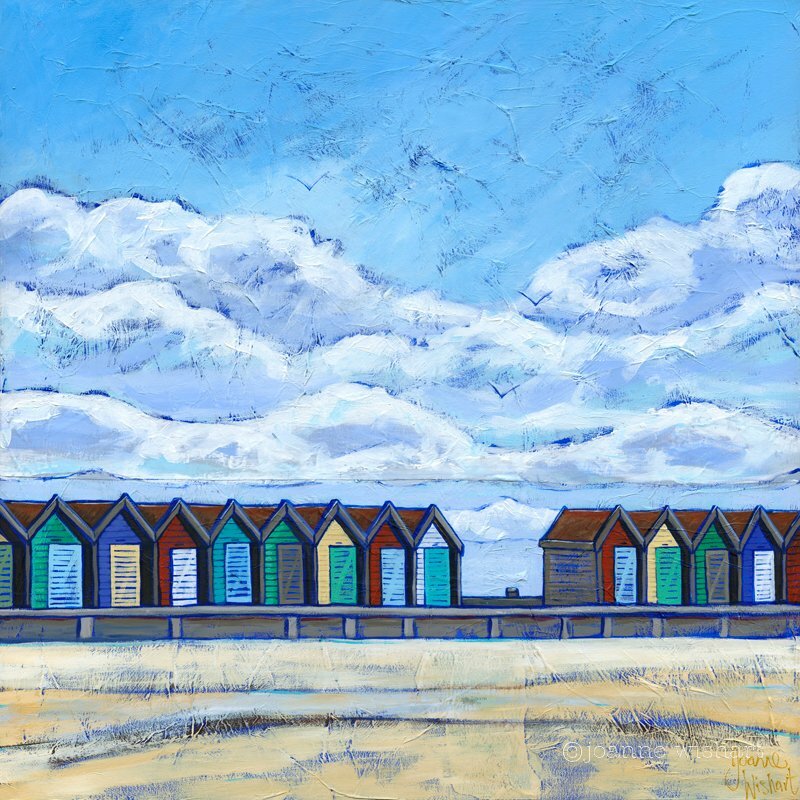 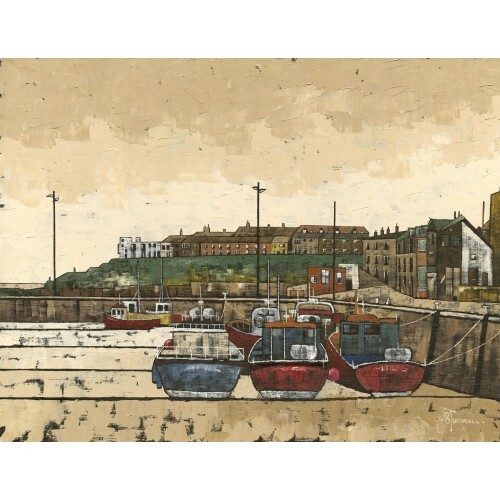 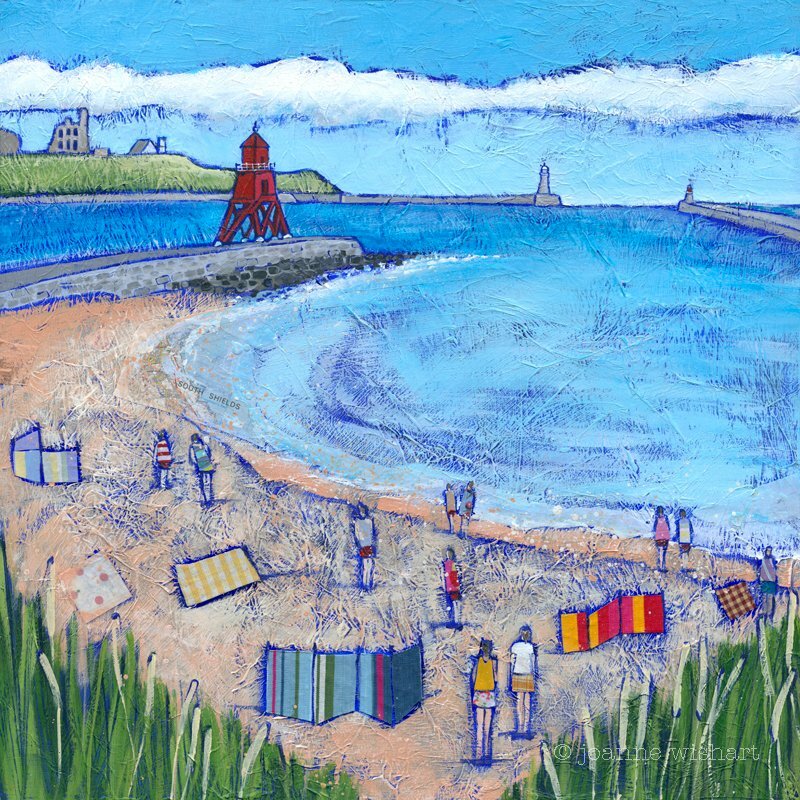 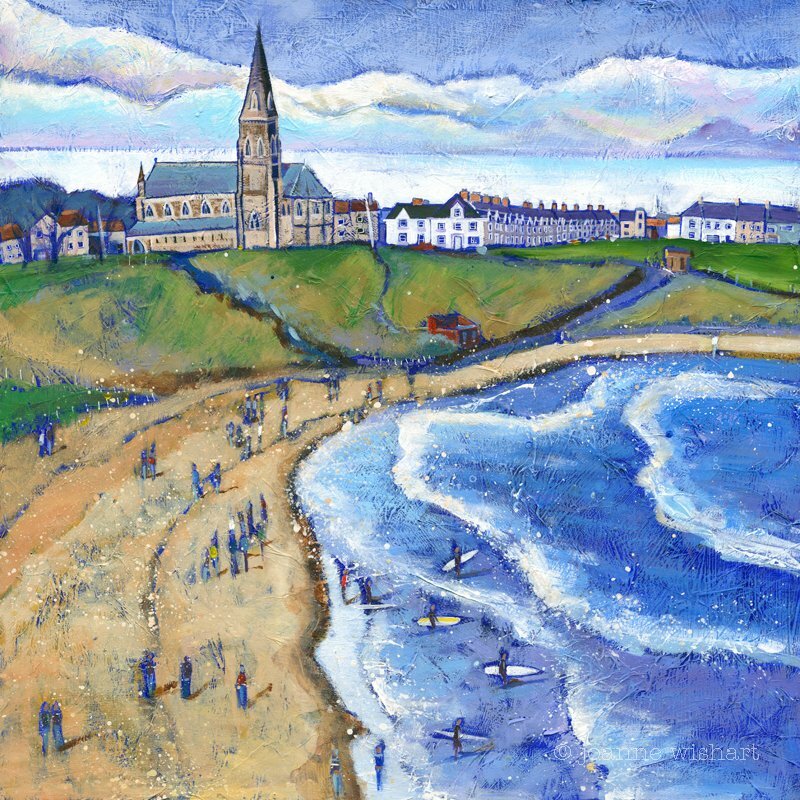 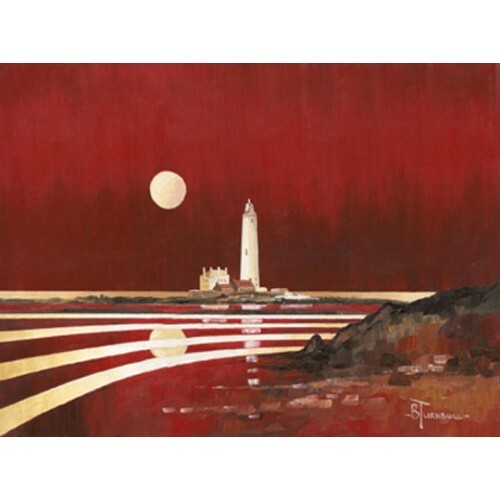 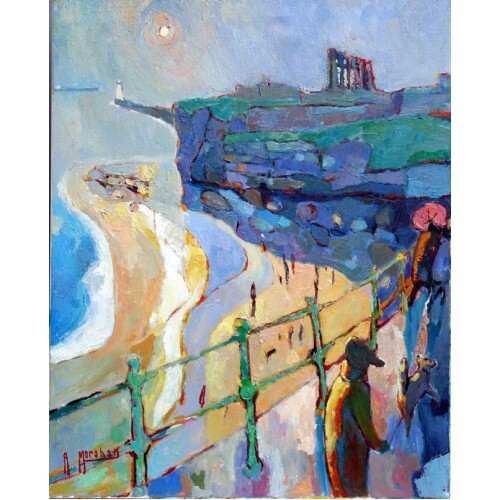 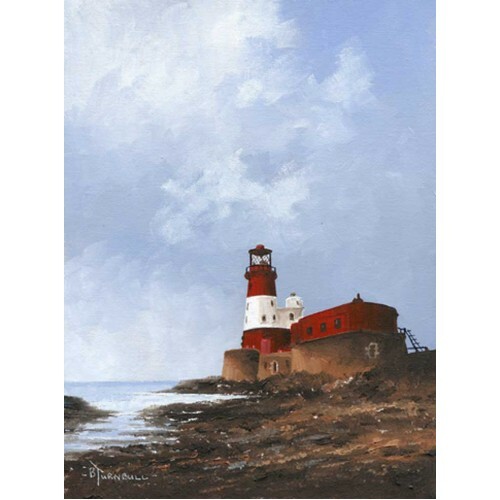 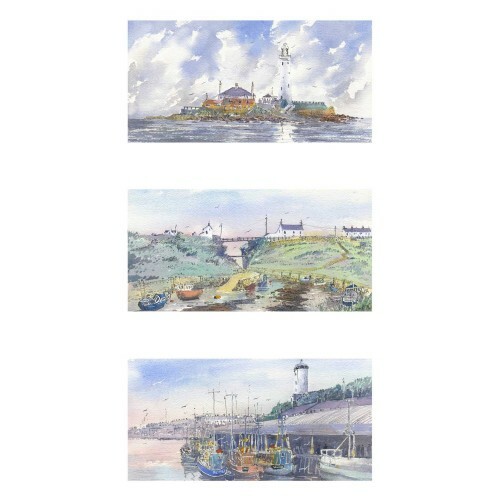 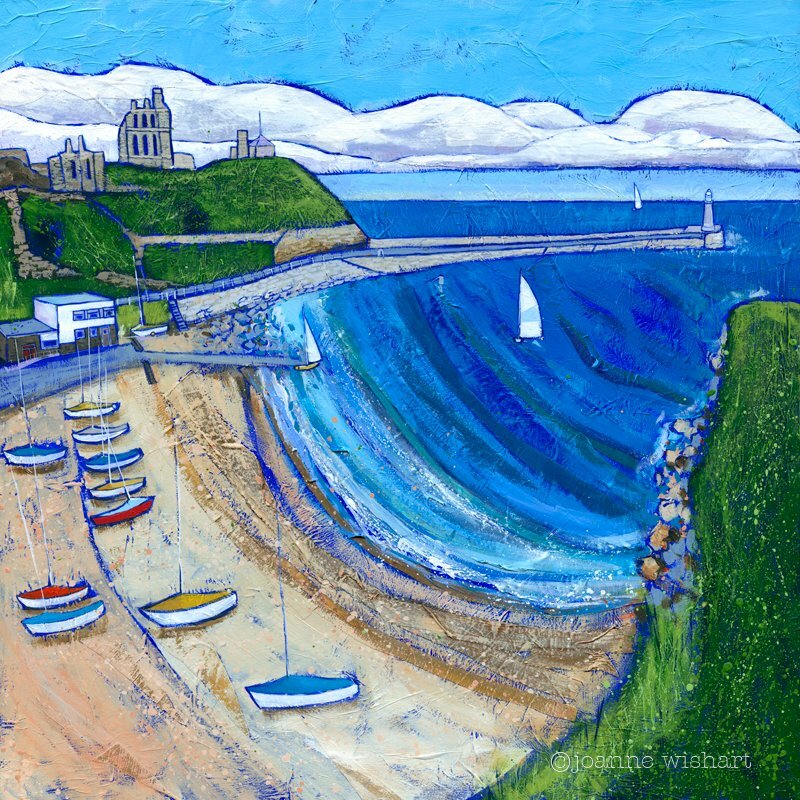 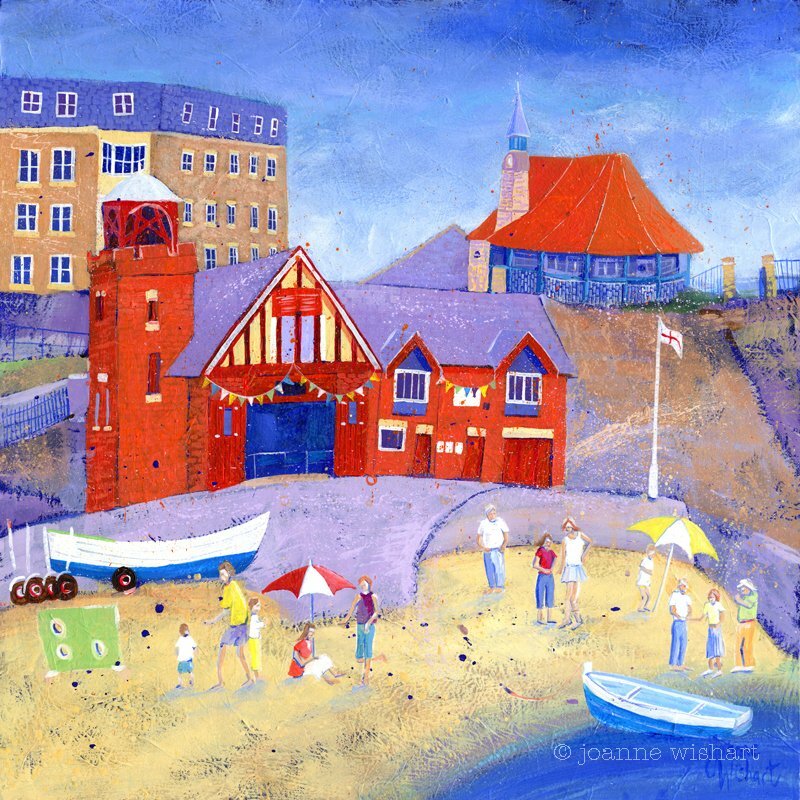 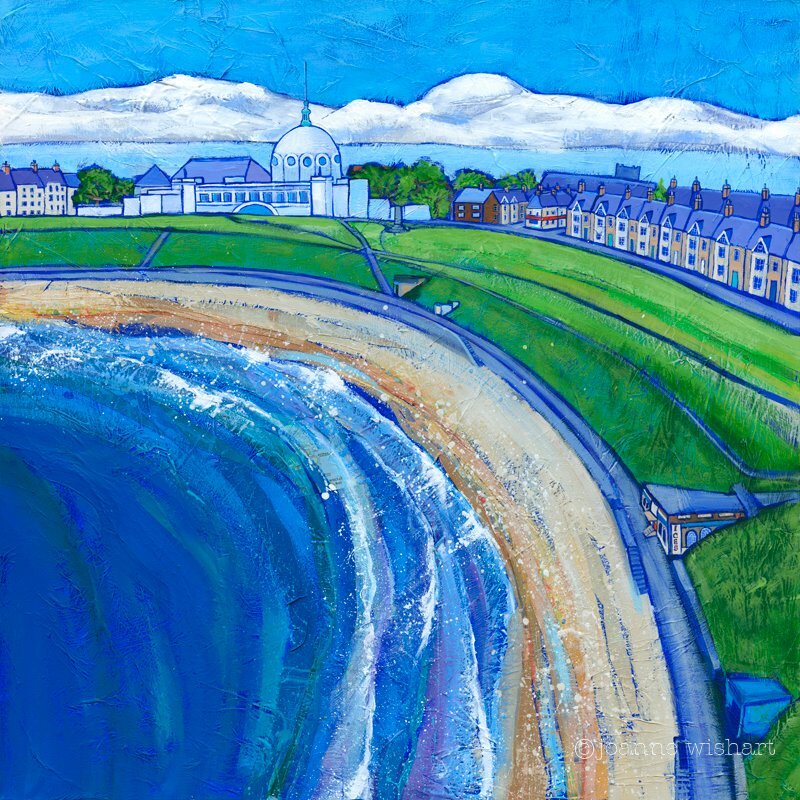 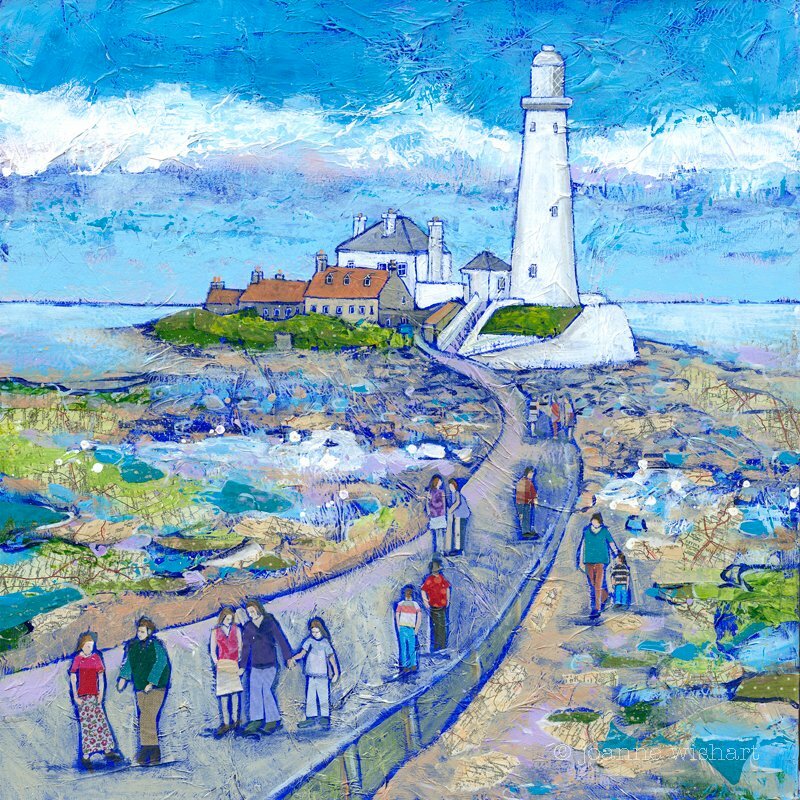 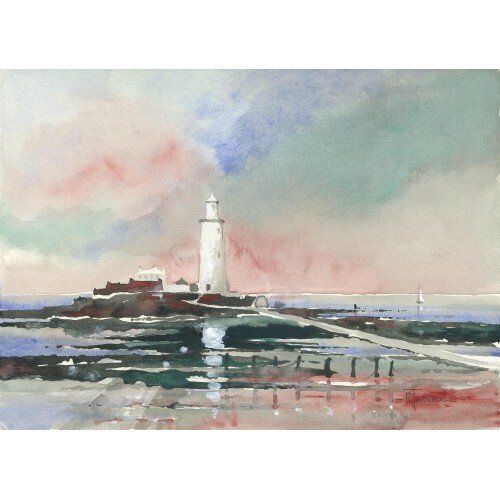 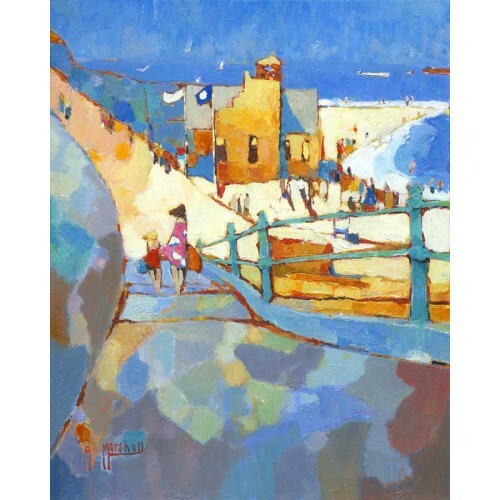 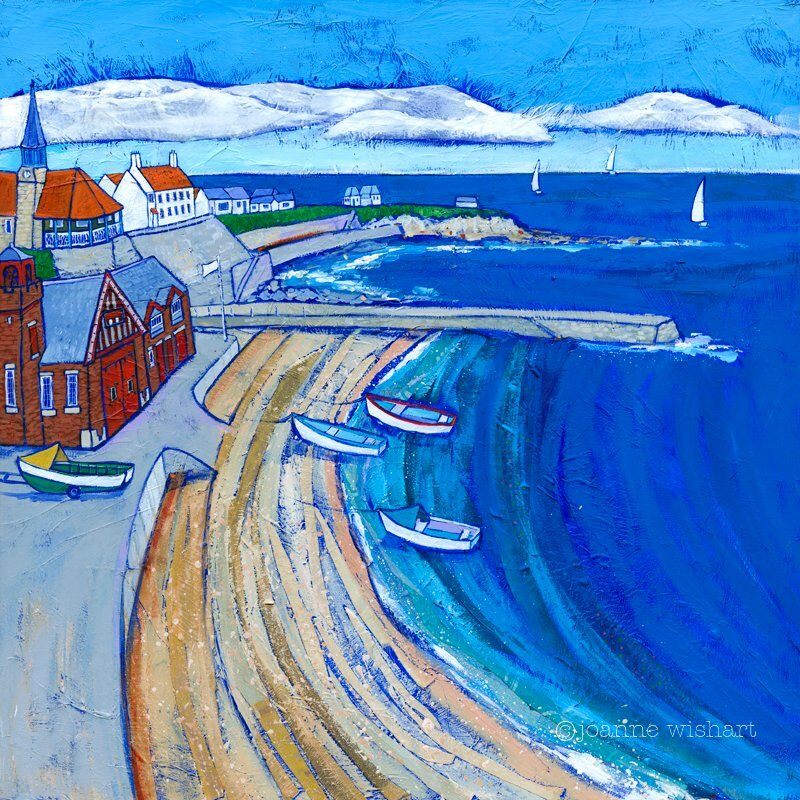 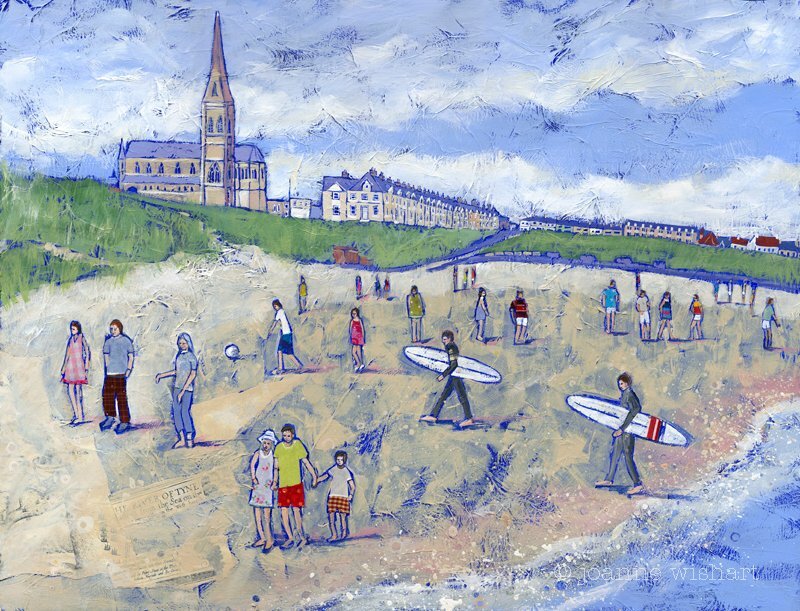 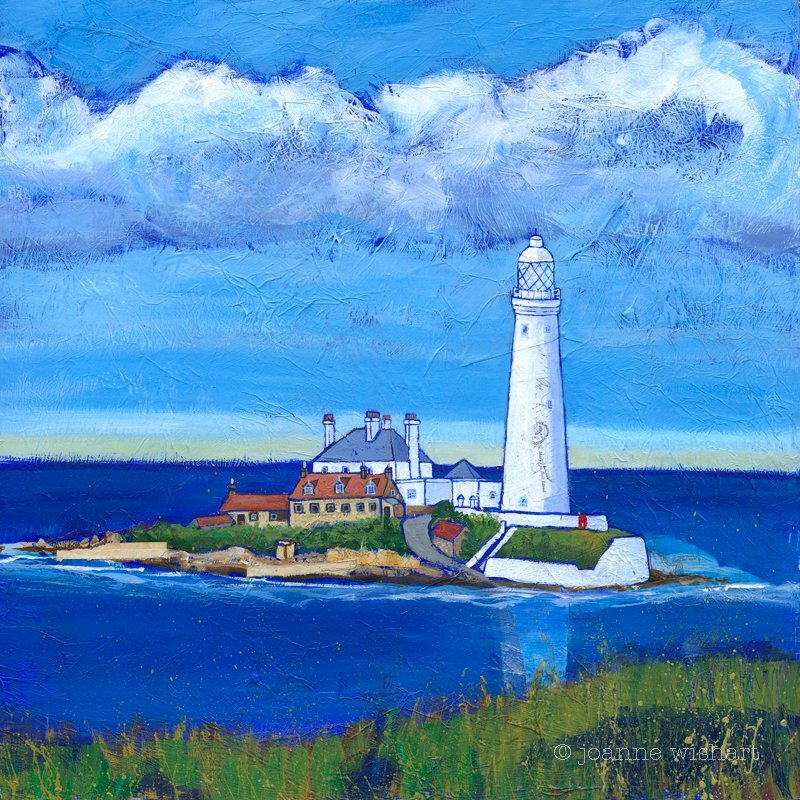 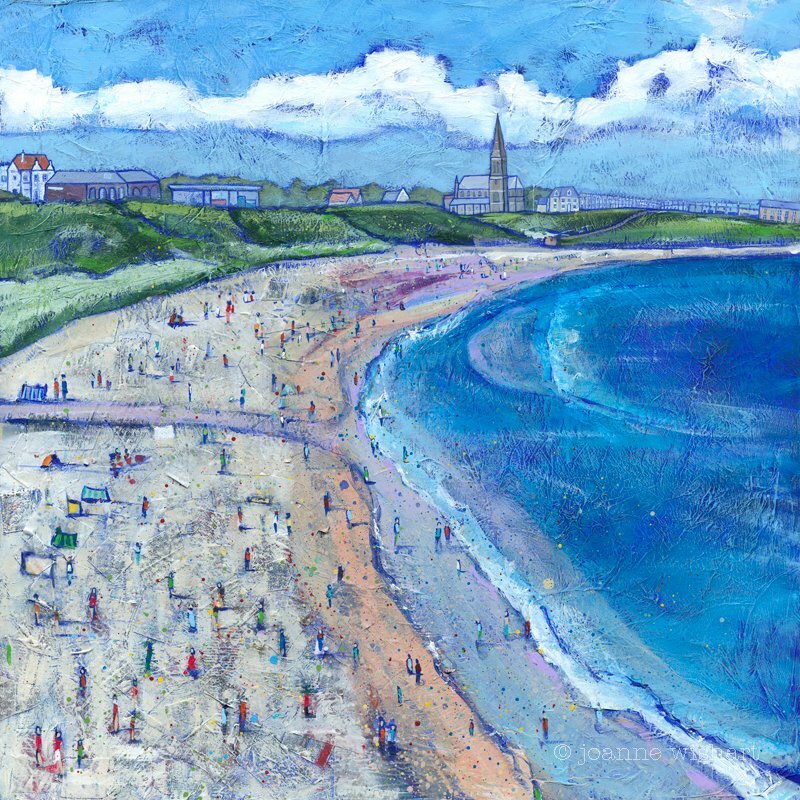 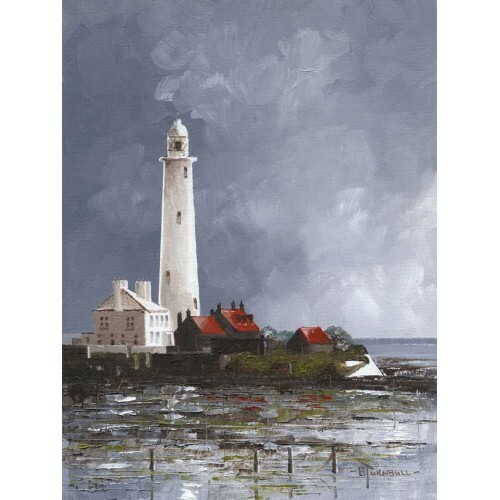 A limited edition giclee print of the seaside town of Whitley Bay, featuring the Dome. 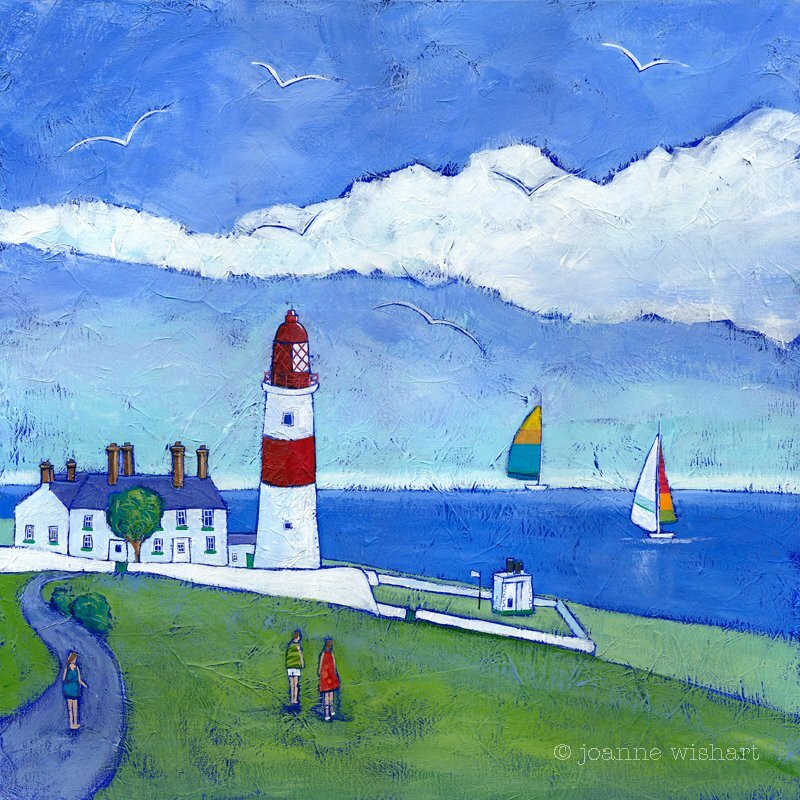 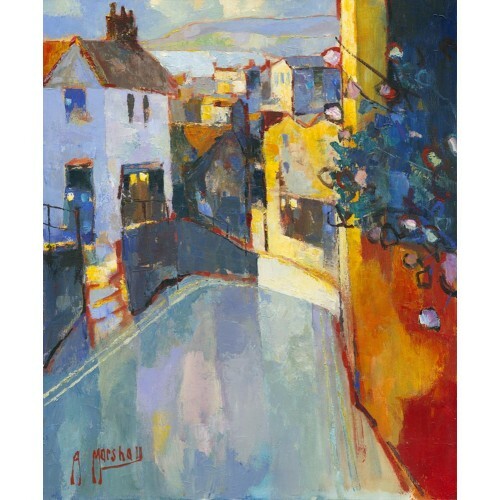 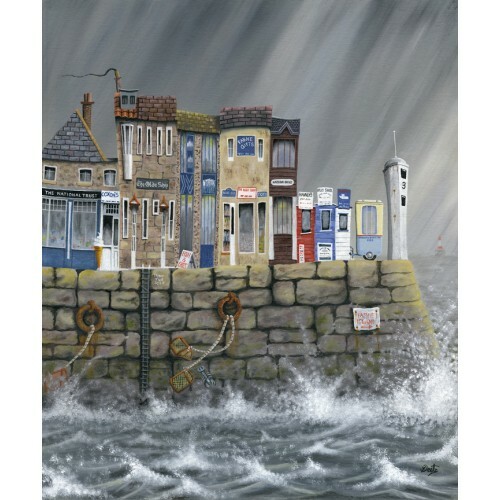 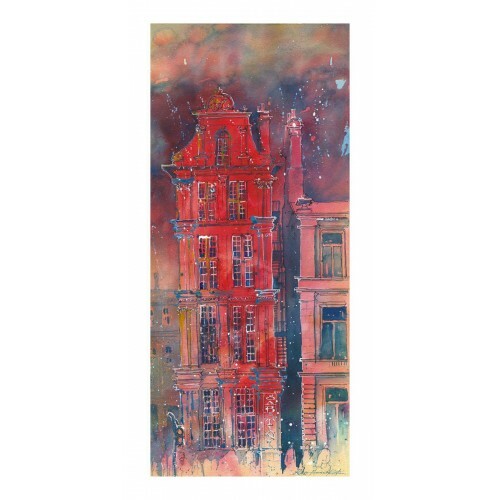 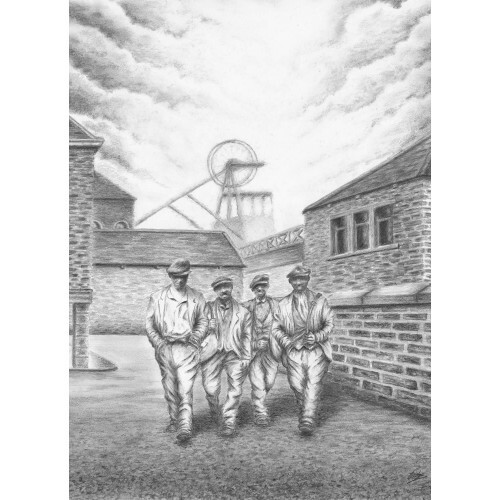 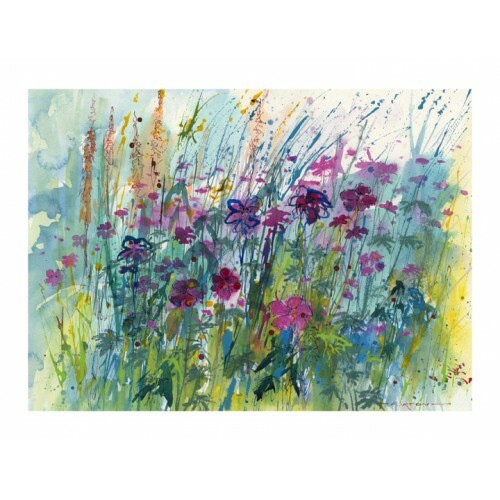 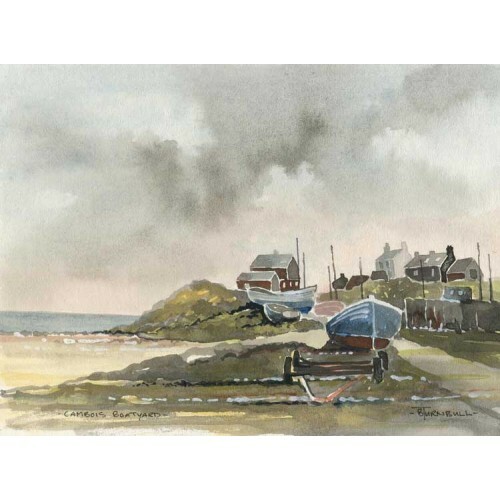 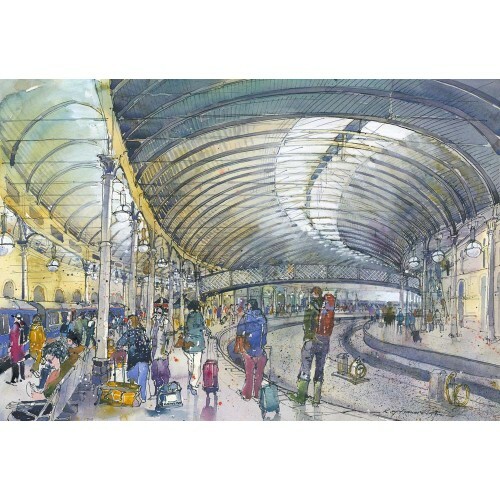 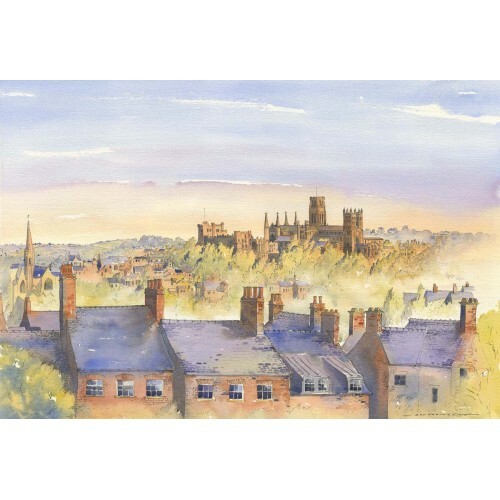 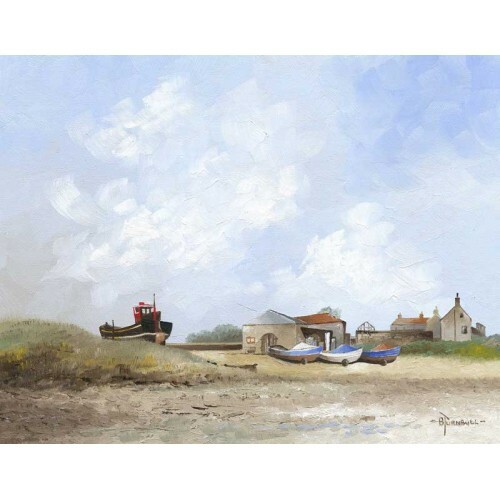 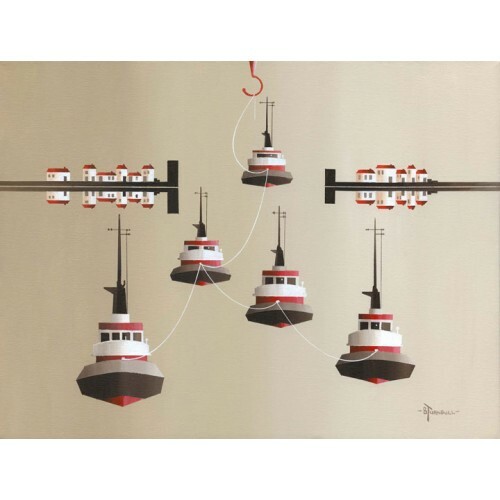 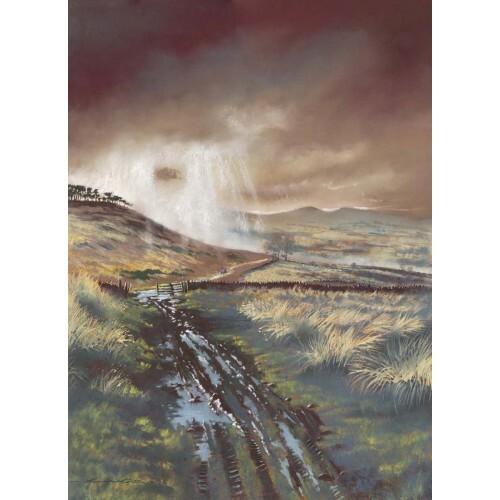 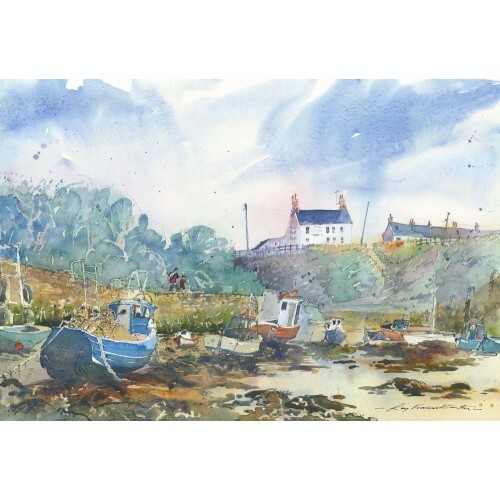 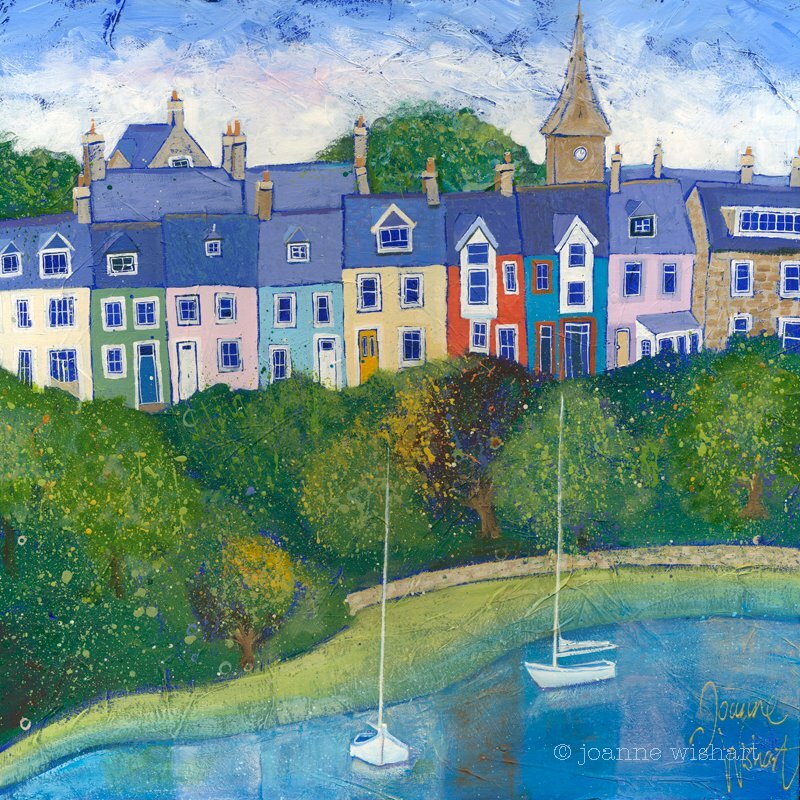 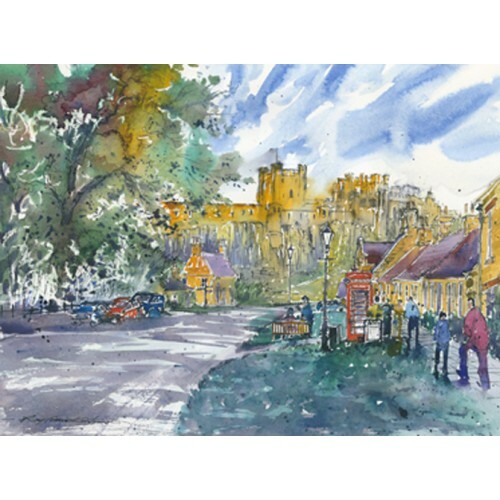 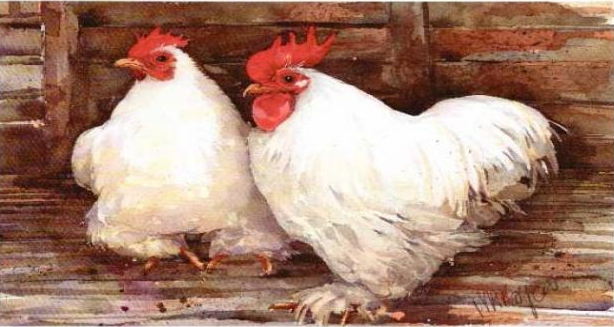 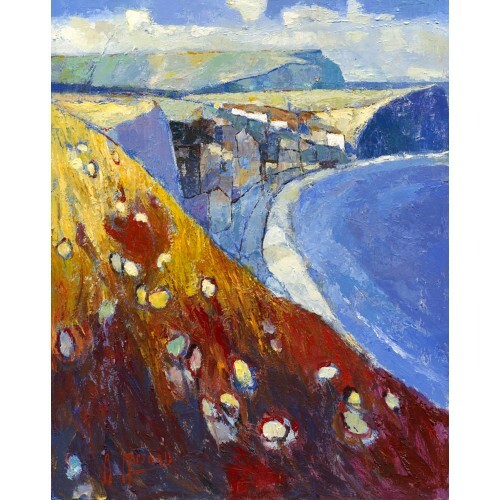 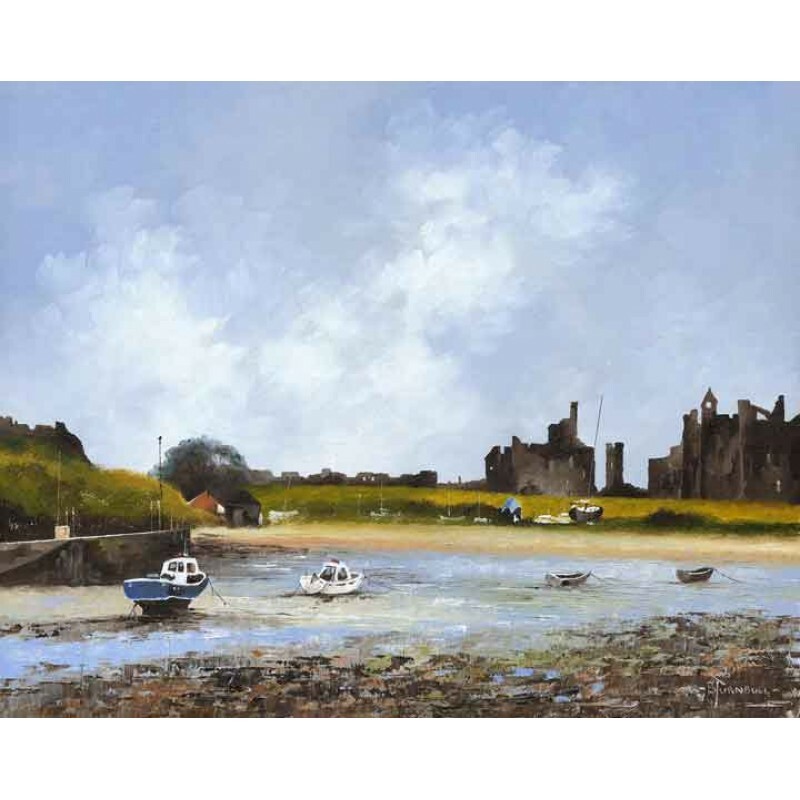 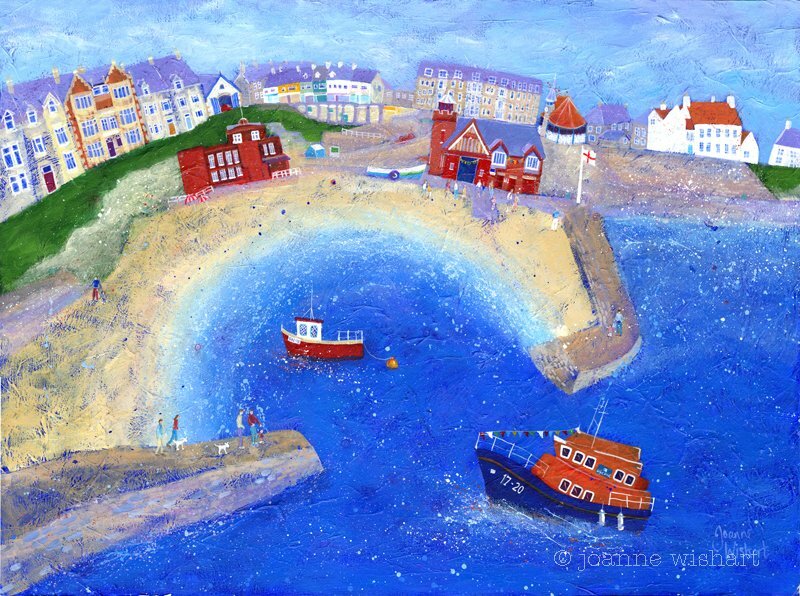 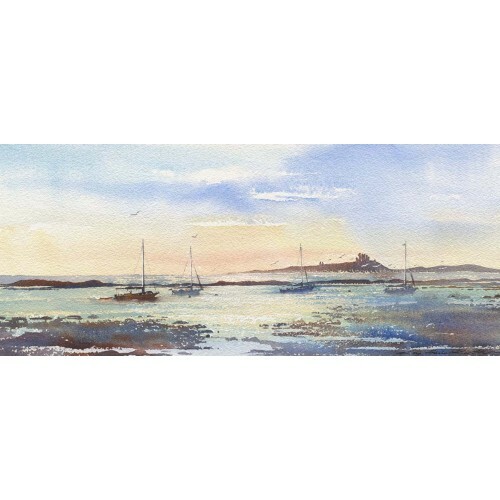 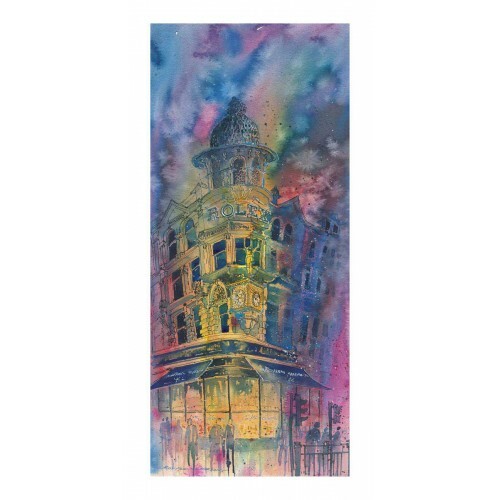 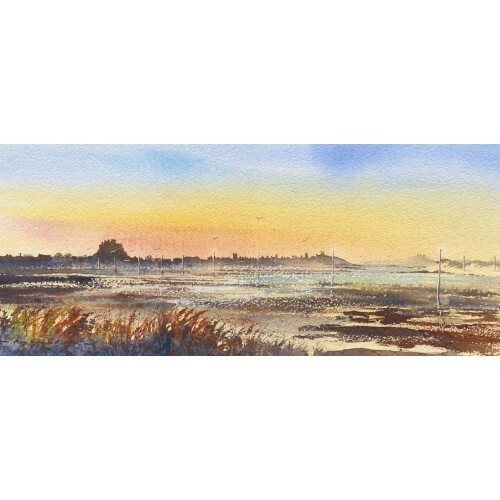 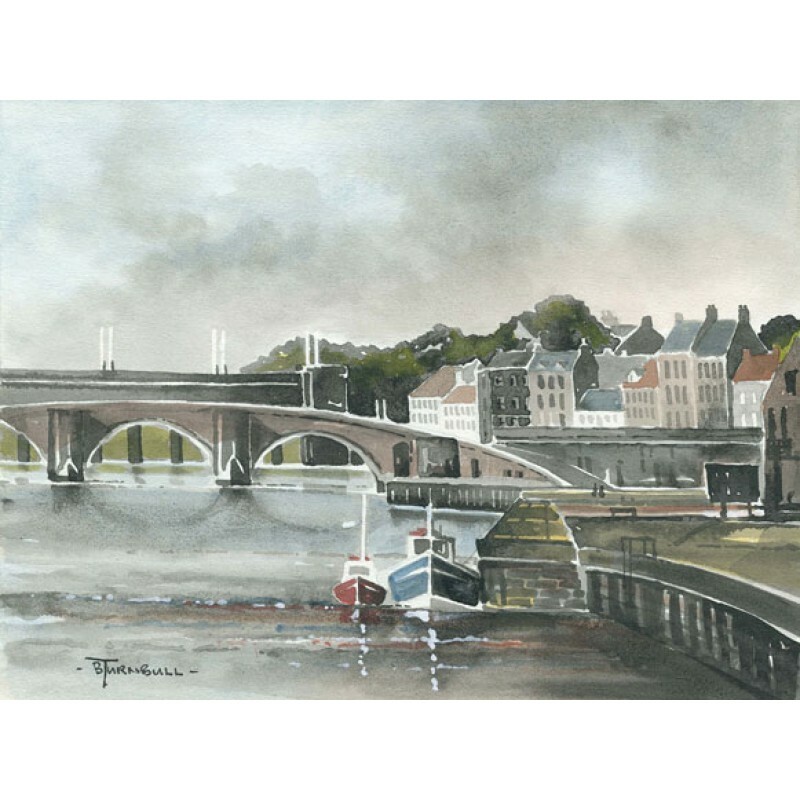 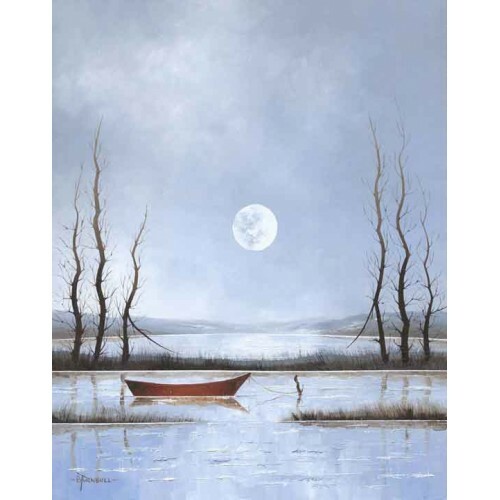 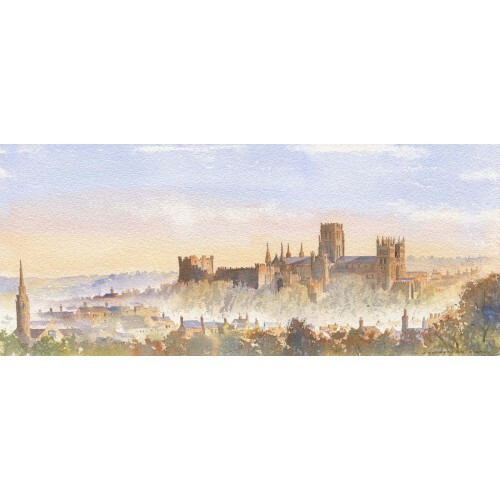 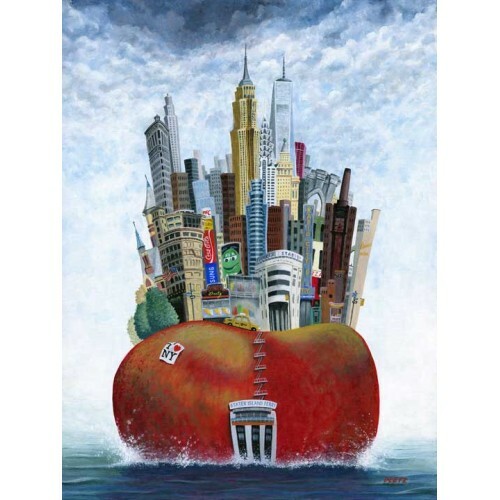 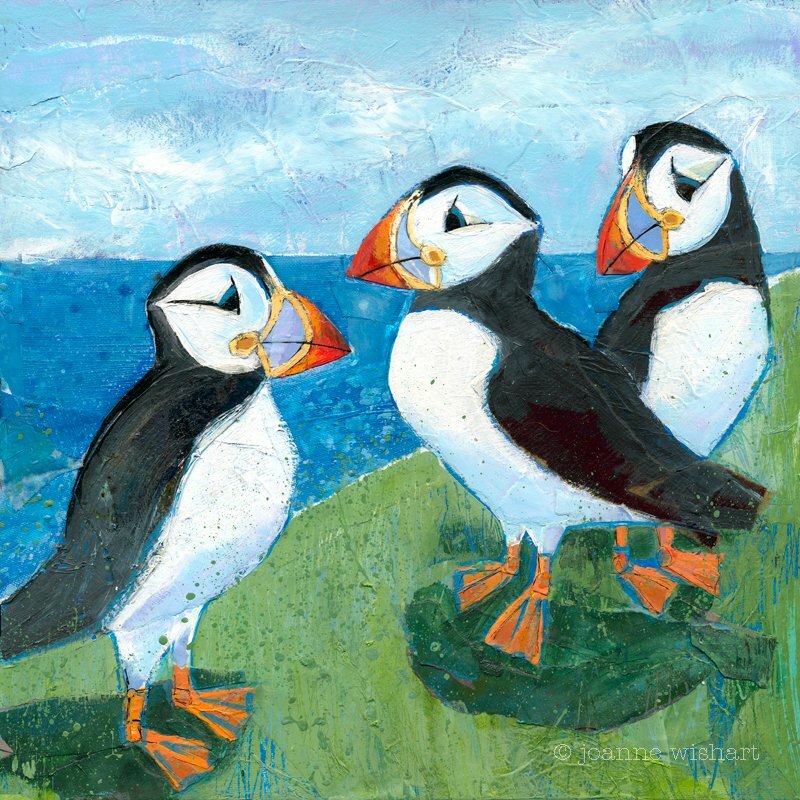 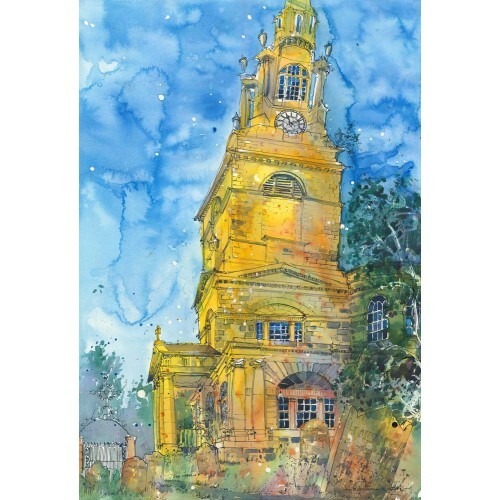 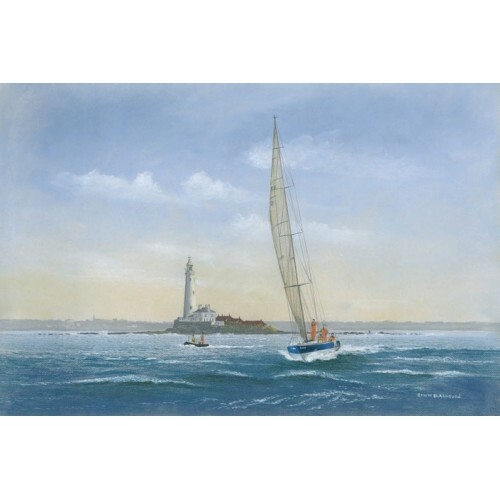 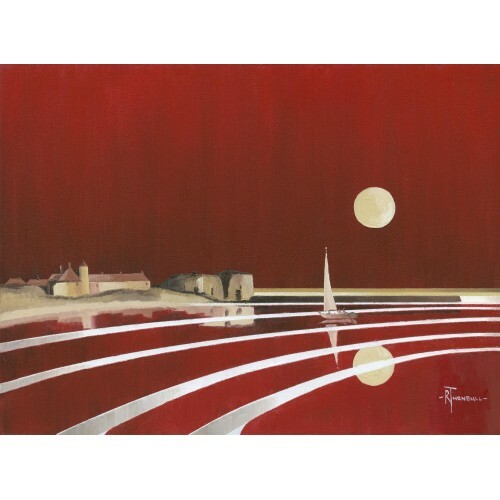 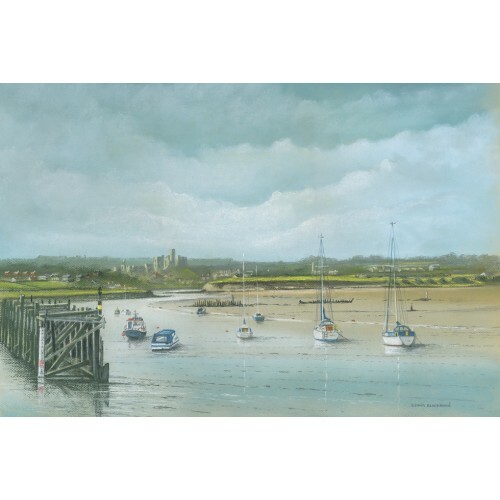 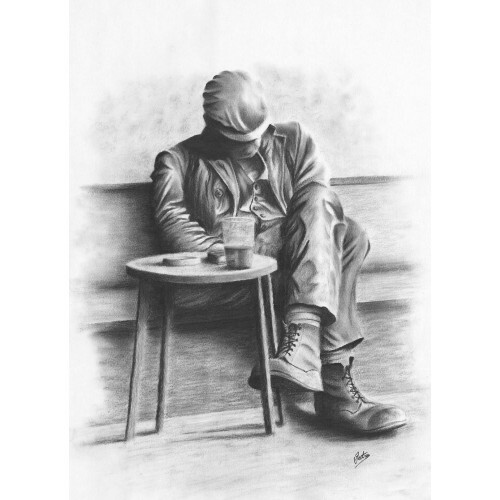 This print is signed and numbered by the artist Joanne Wishart. 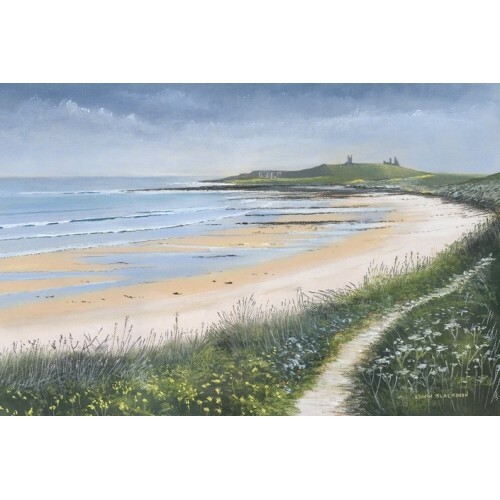 The route of this path winds around the picturesque Embleton Bay. 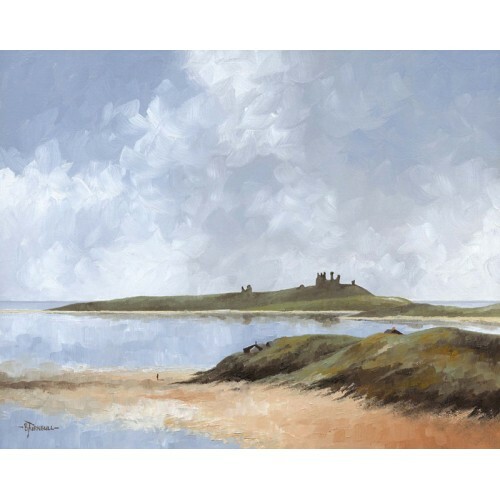 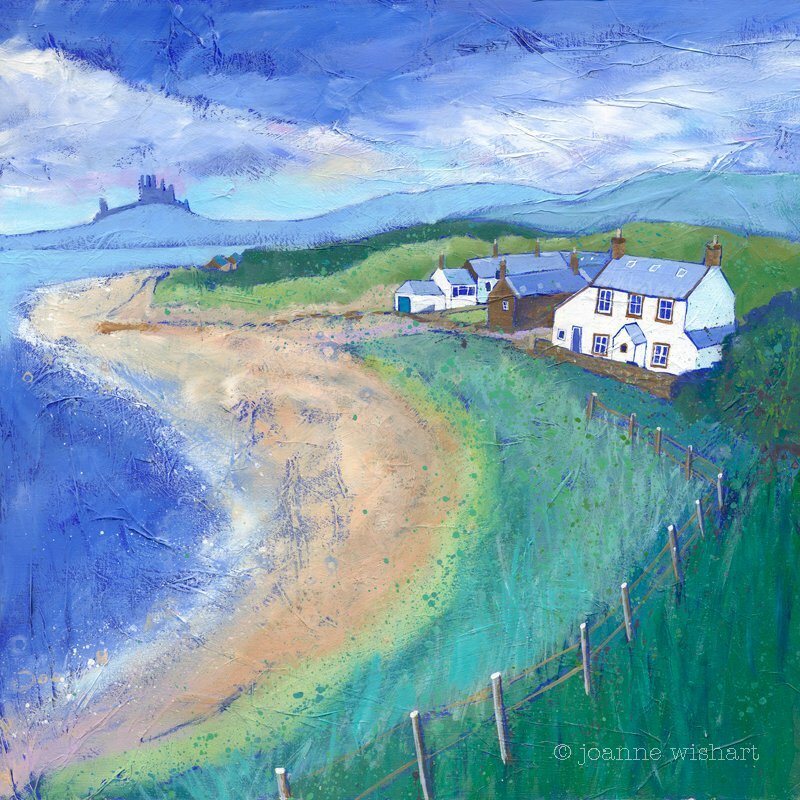 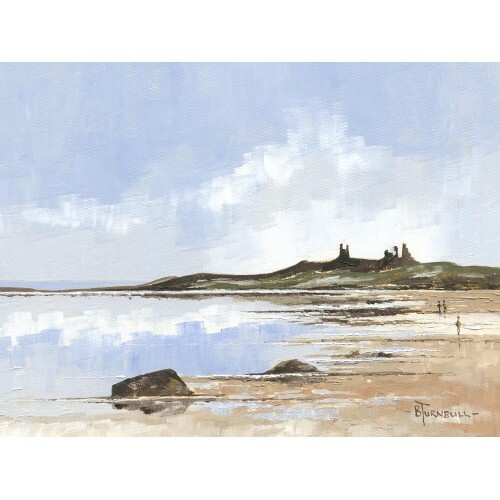 Dunstanburgh castle is visible in the background. 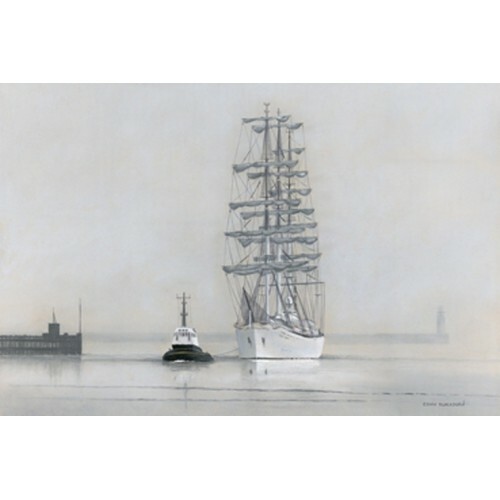 The Polish tall ship “Dar Mlodziezy” arriving in the River Tyne on a foggy evening. 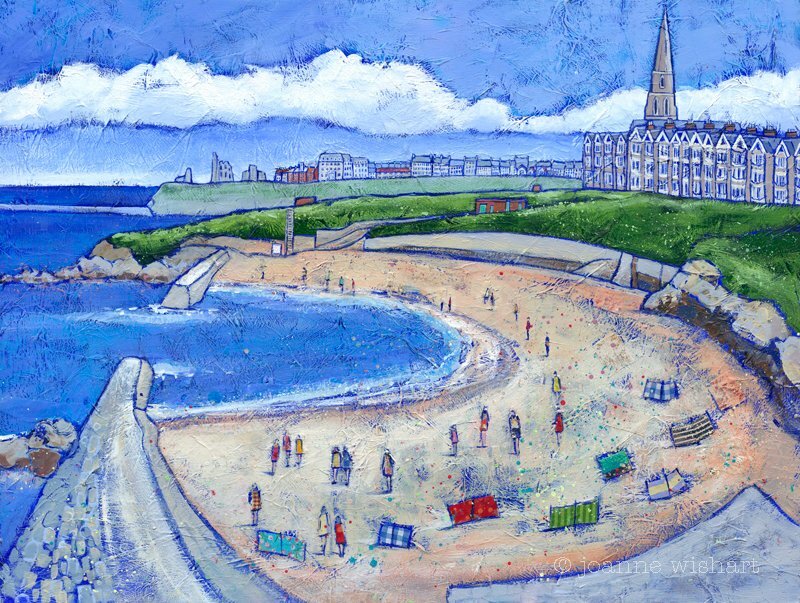 The faint sight of the Tynemouth pier is just visible in the background. 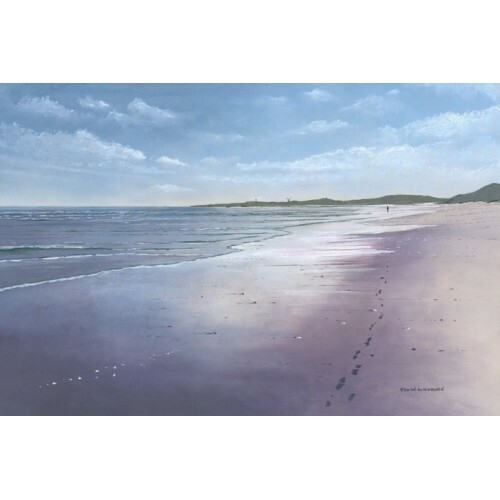 The magnificent and peaceful stretch of beach that is Druridge Bay in Northumberland, it is 7 mile long and is situated between Amble and the village of Cresswell on it’s southern shore. 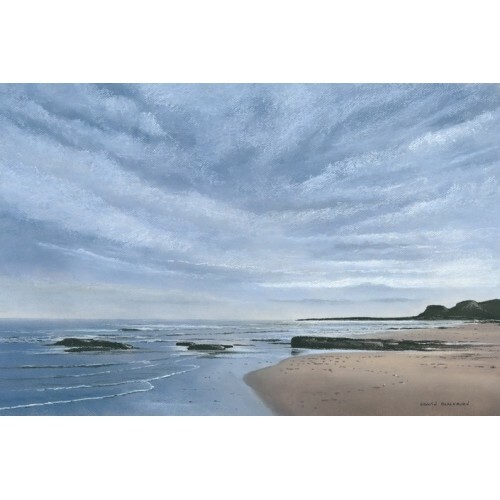 Cresswell beach on the Northumberland coast with an incoming tide. 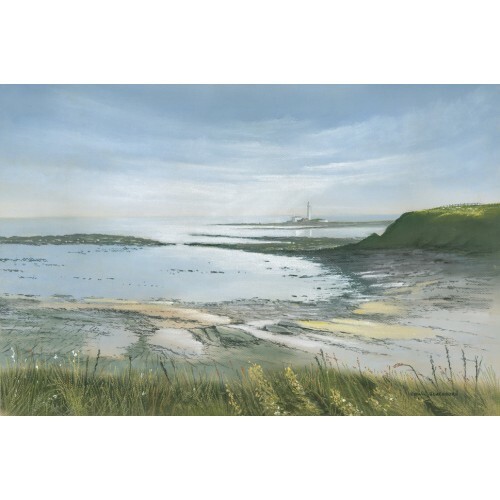 Looking South towards St Mary’s Lighthouse on a summer afternoon across the rocky bay at Old Hartley, Northumberland. 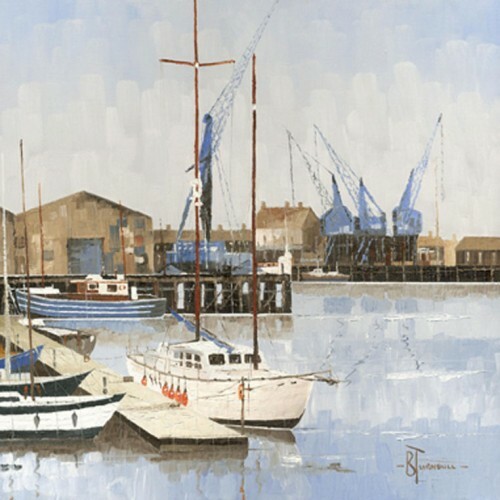 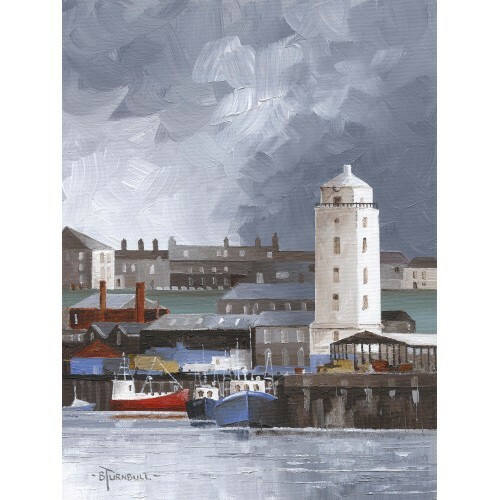 North Shields Fish Quay is situated near the mouth of the River Tyne. 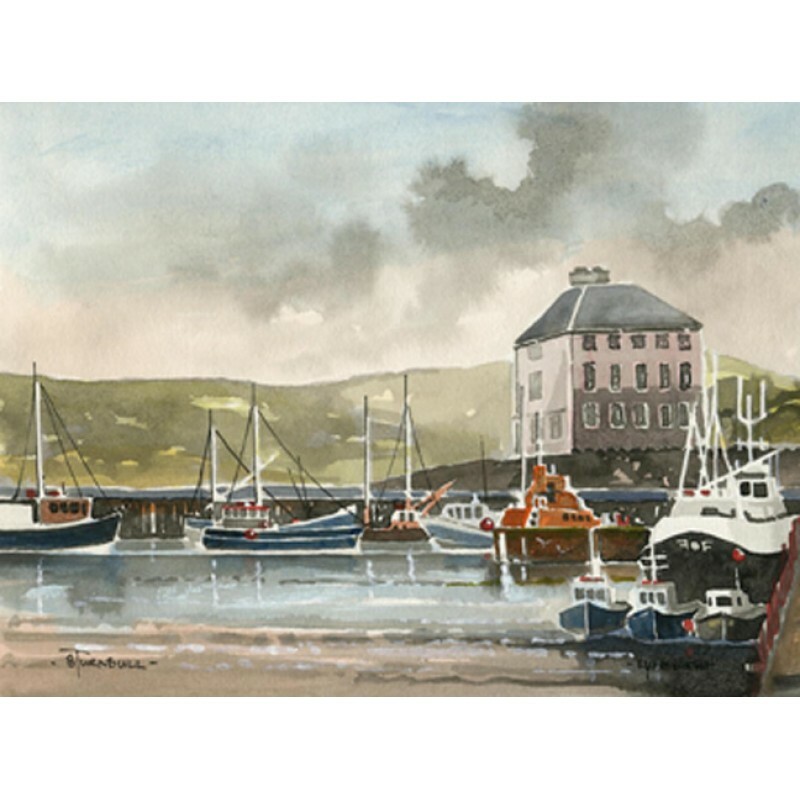 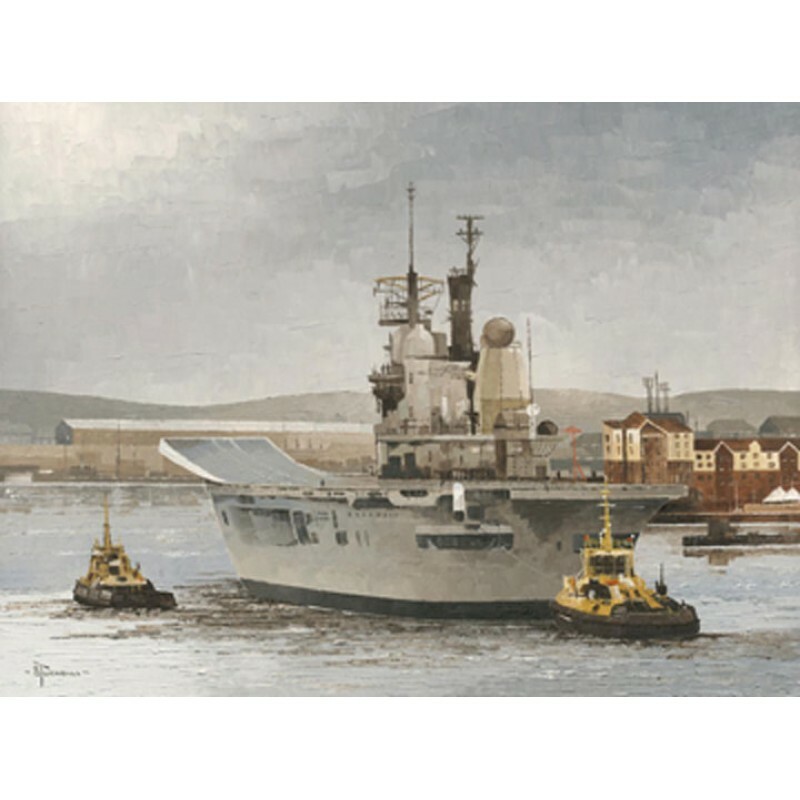 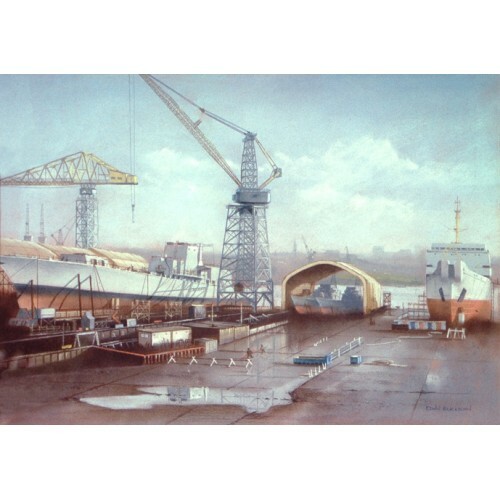 Here shown during the 1980’s, a busier time than today when it supported a much larger fishing fleet. 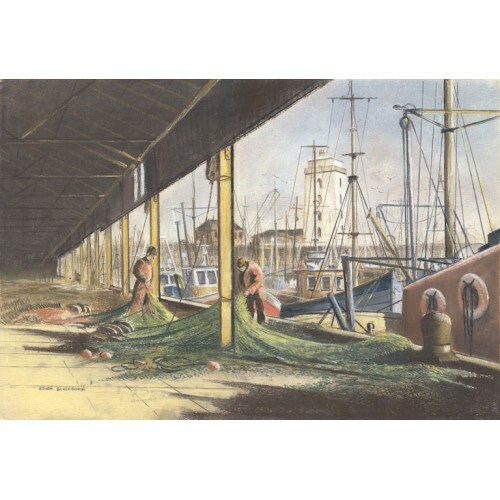 Fishermen are seen preparing nets for the coming voyage. 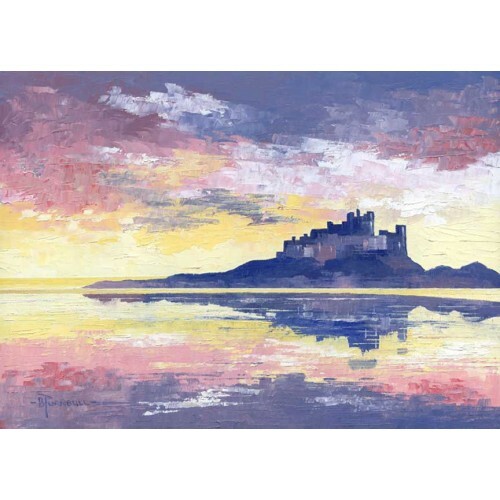 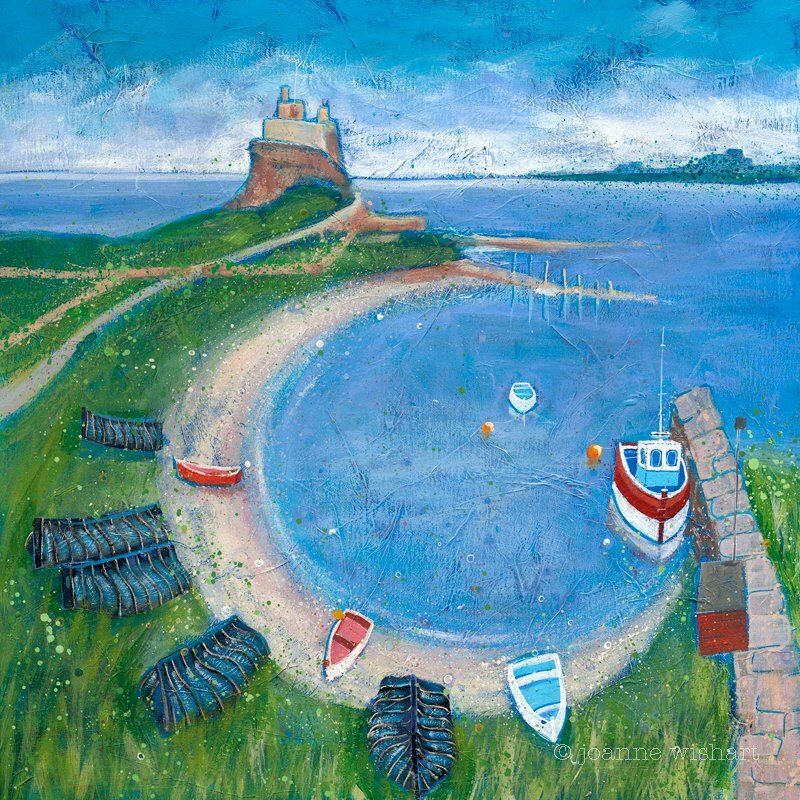 Beginning on Holy Island the 97 mile St. Oswald’s Way follows the stunning Northumberland coast, before heading inland across the beautiful countryside to Heavenfield and Hadrian’s Wall. 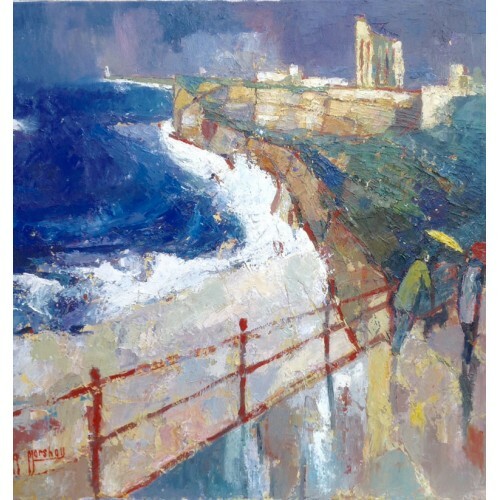 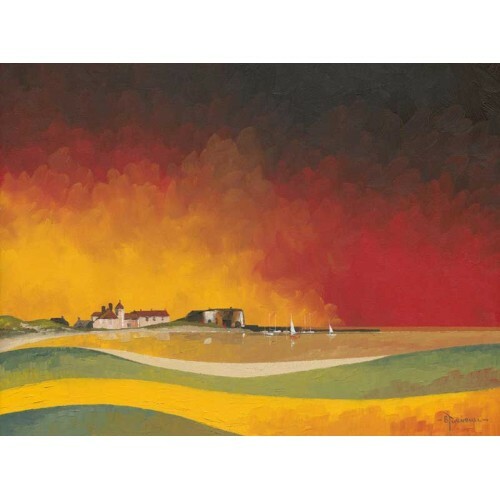 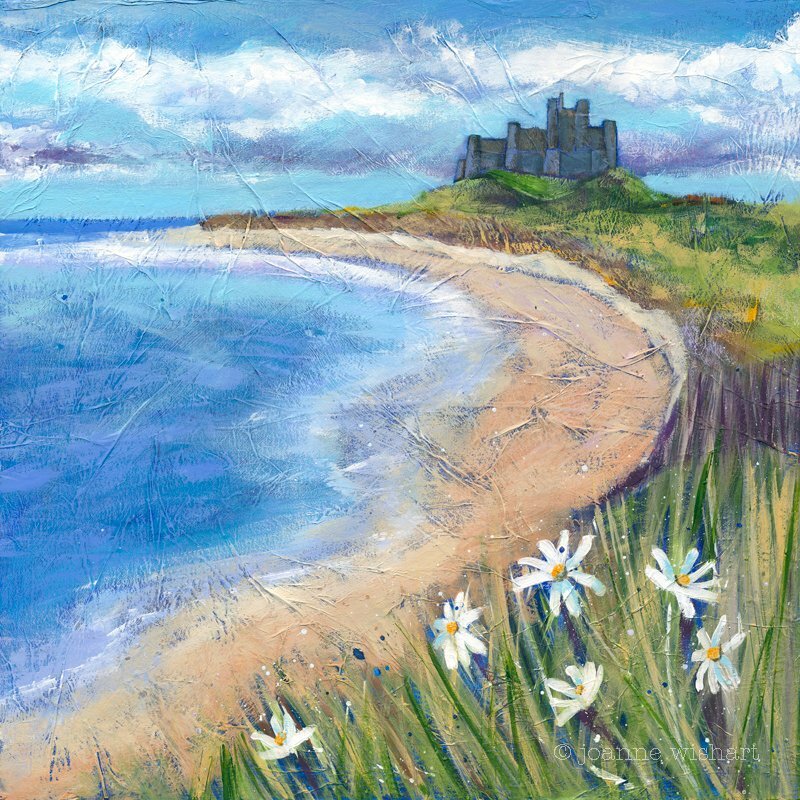 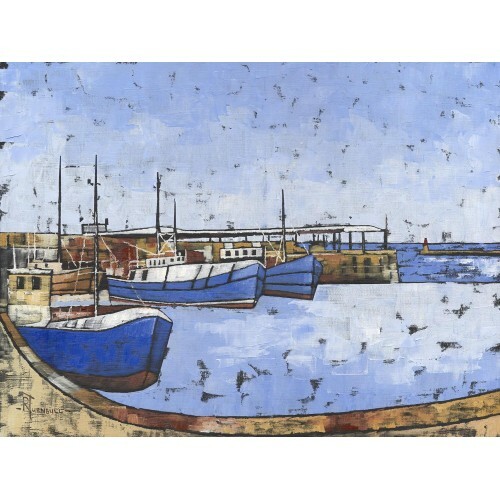 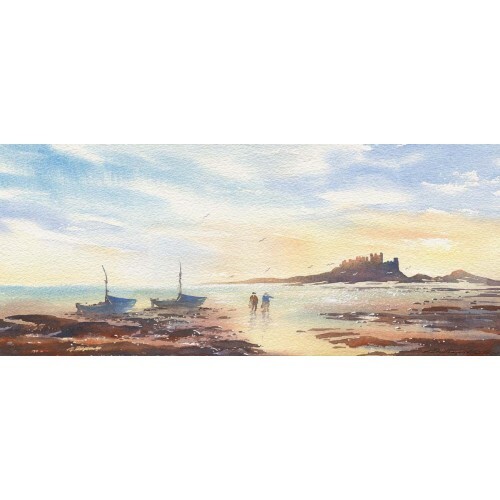 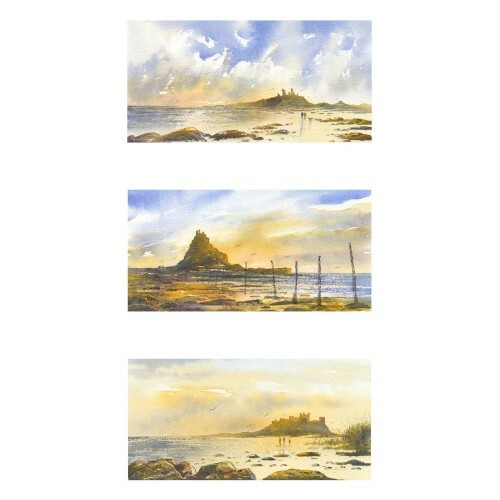 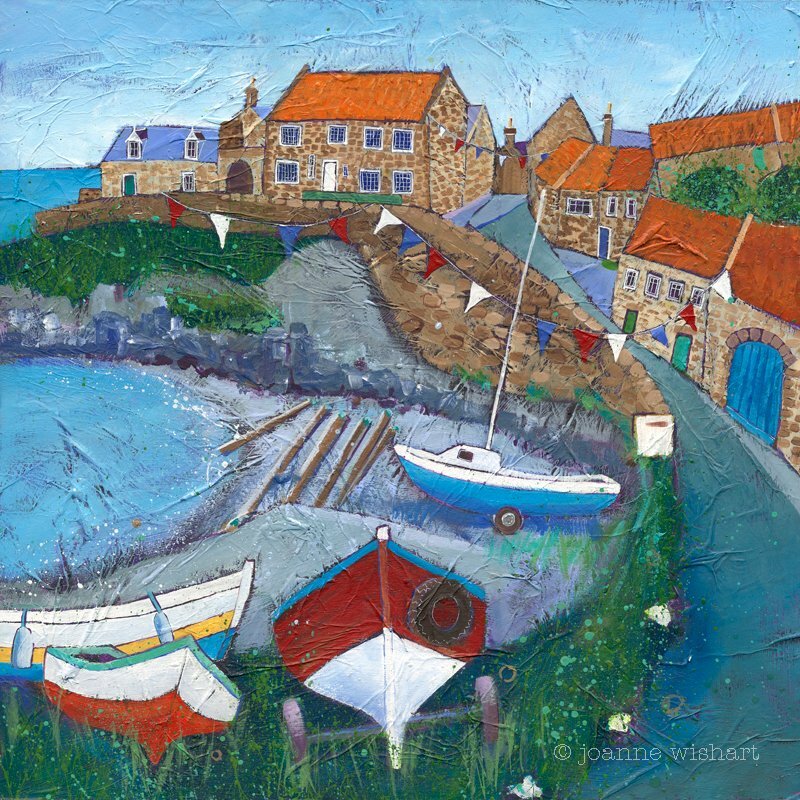 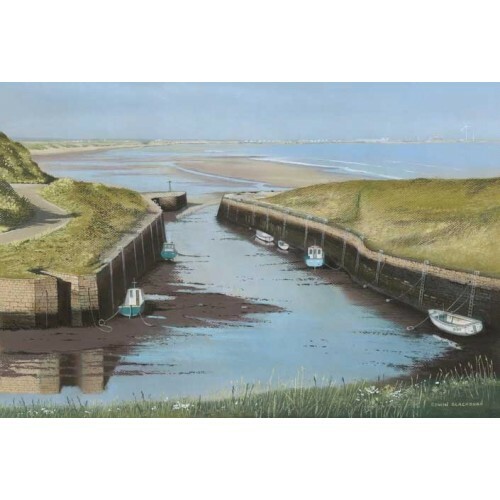 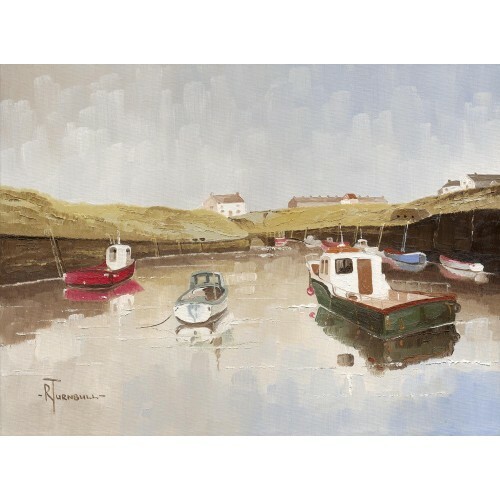 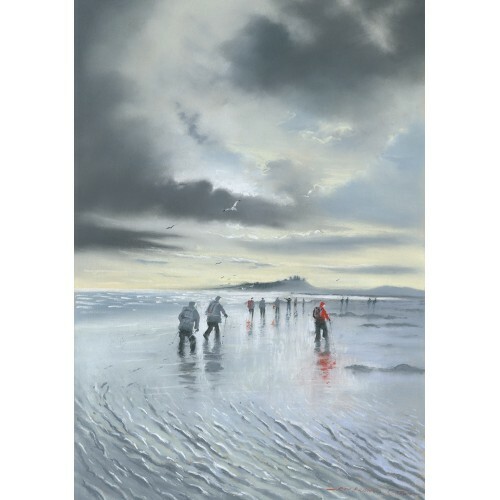 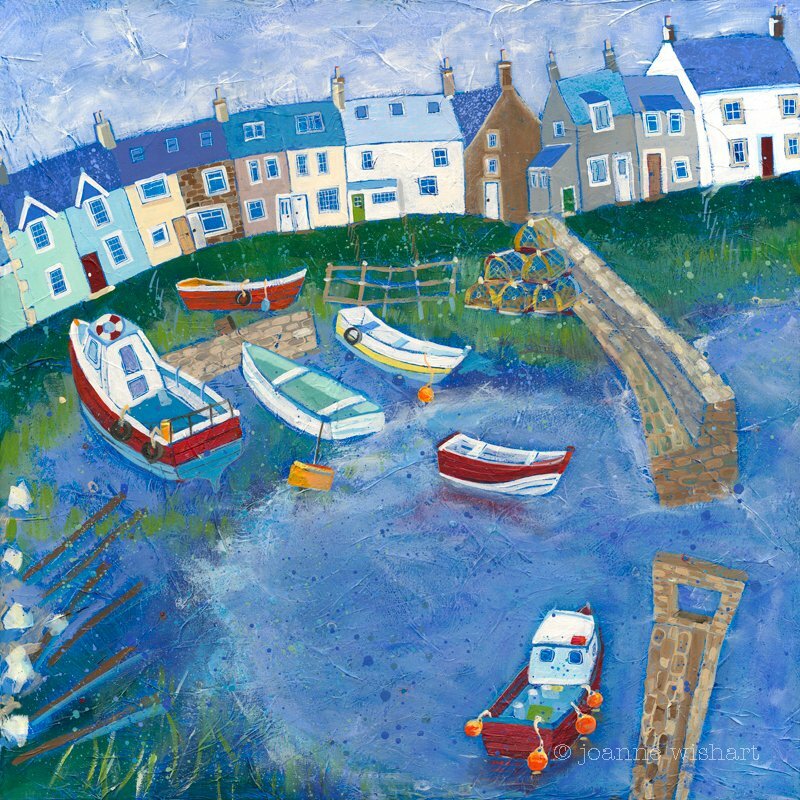 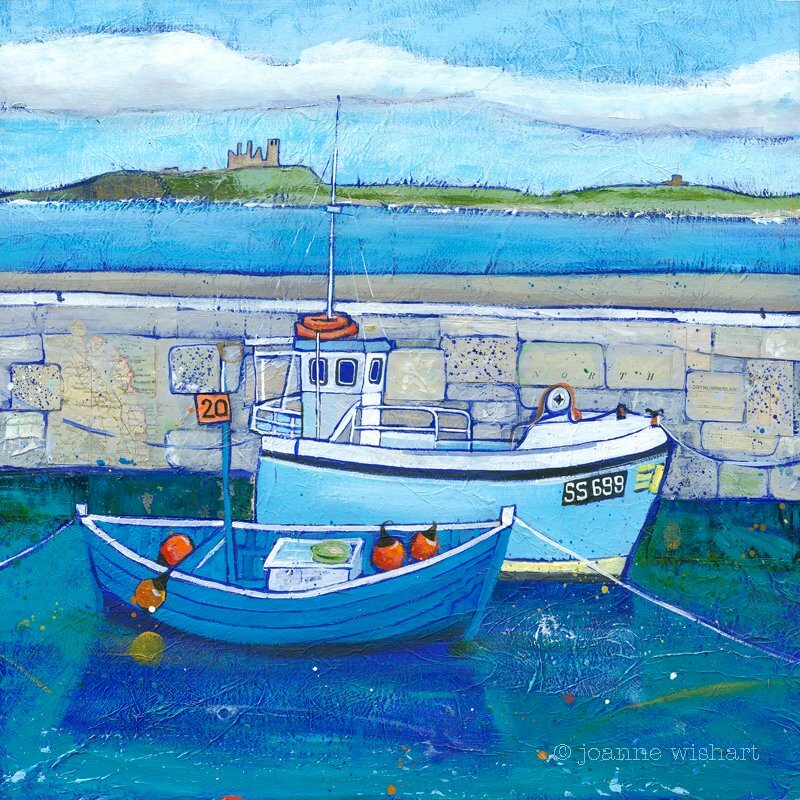 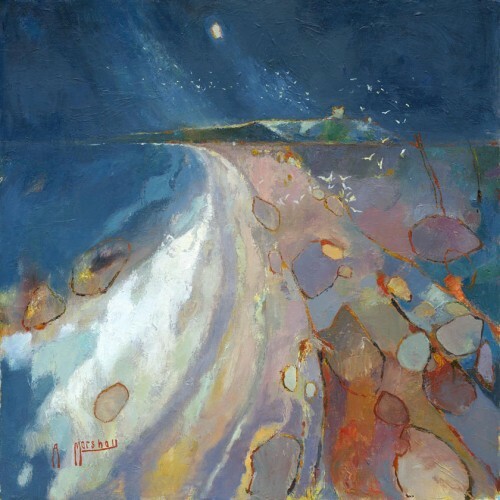 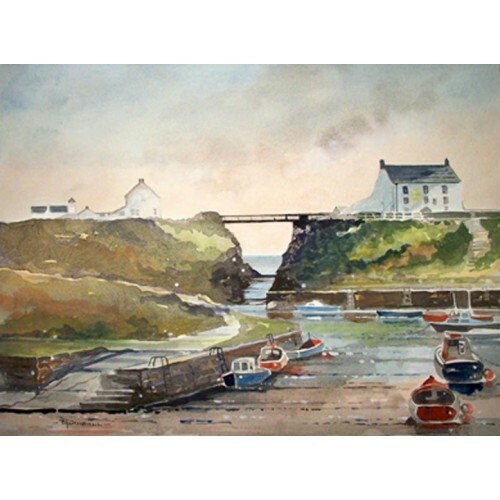 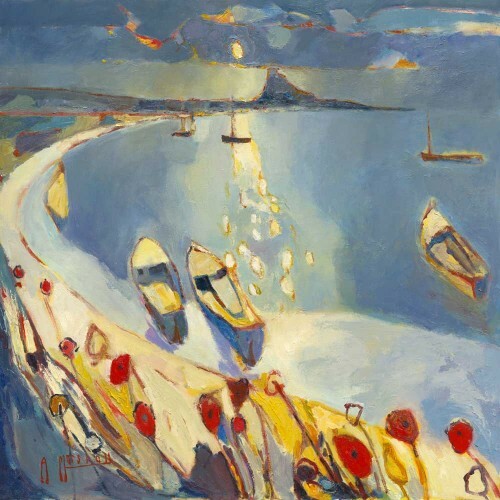 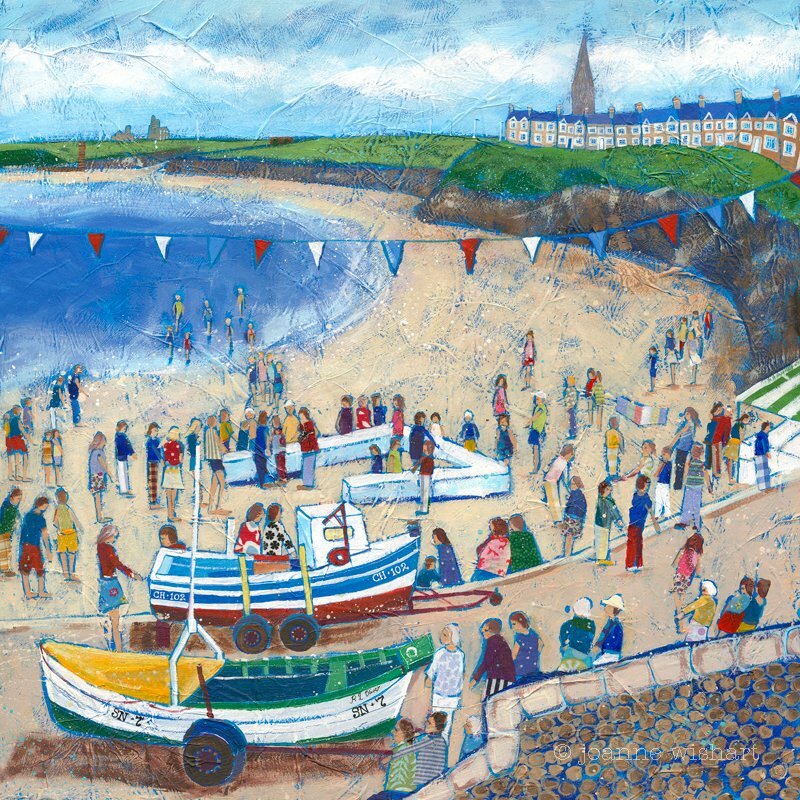 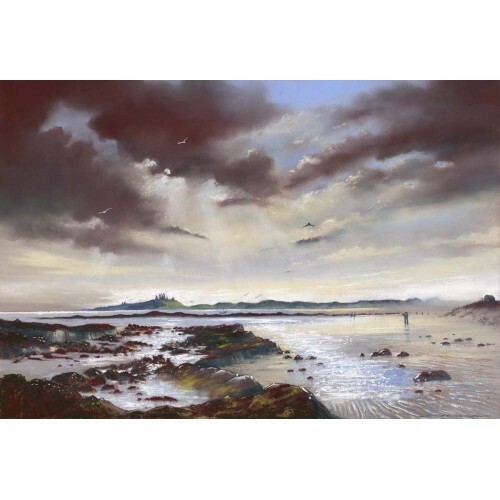 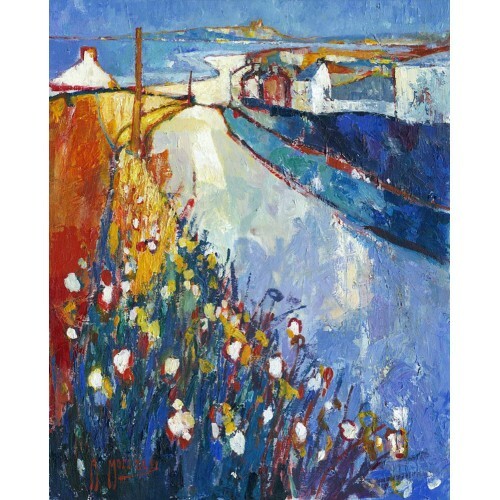 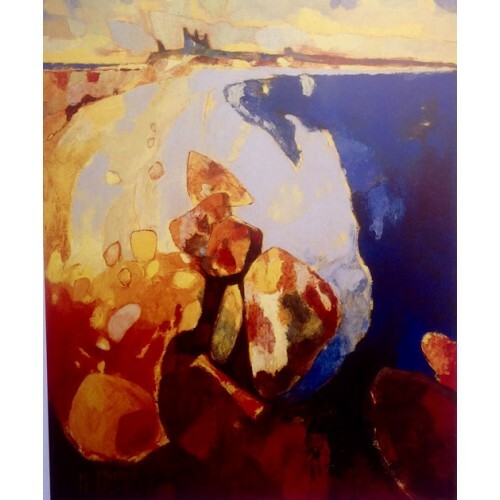 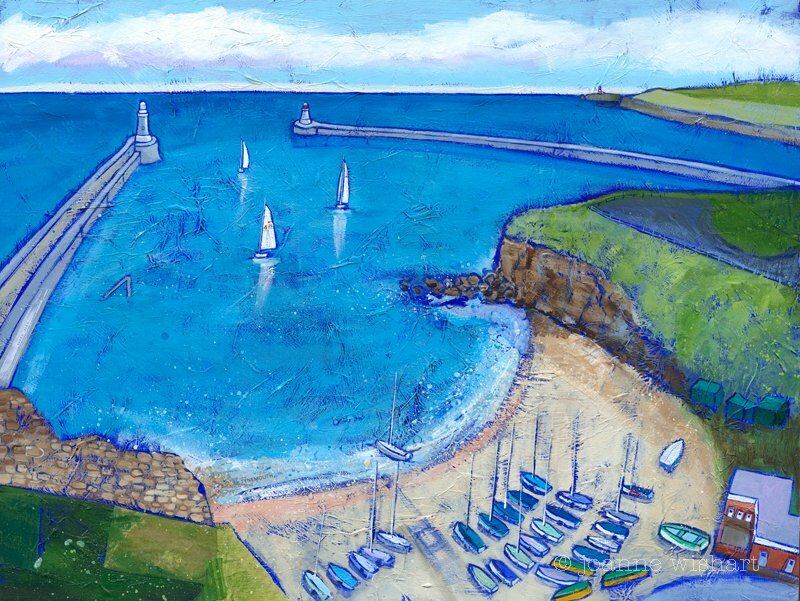 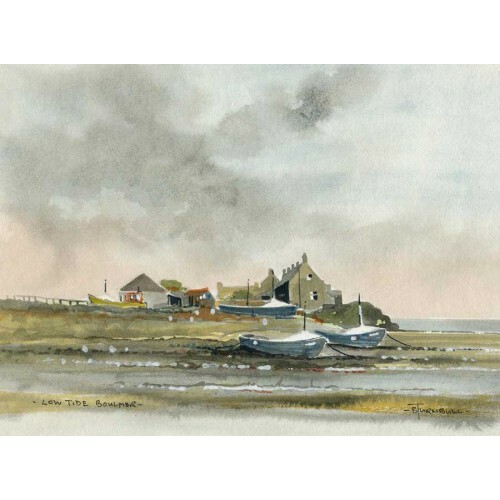 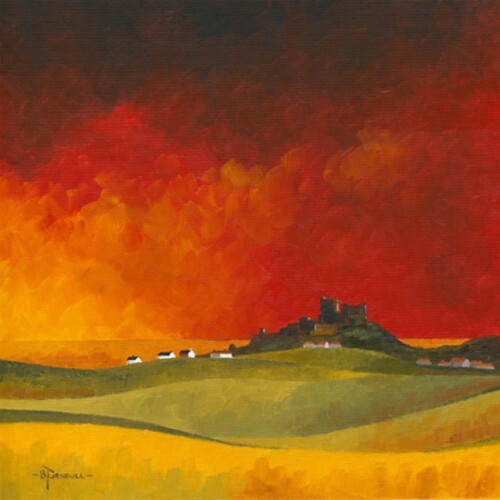 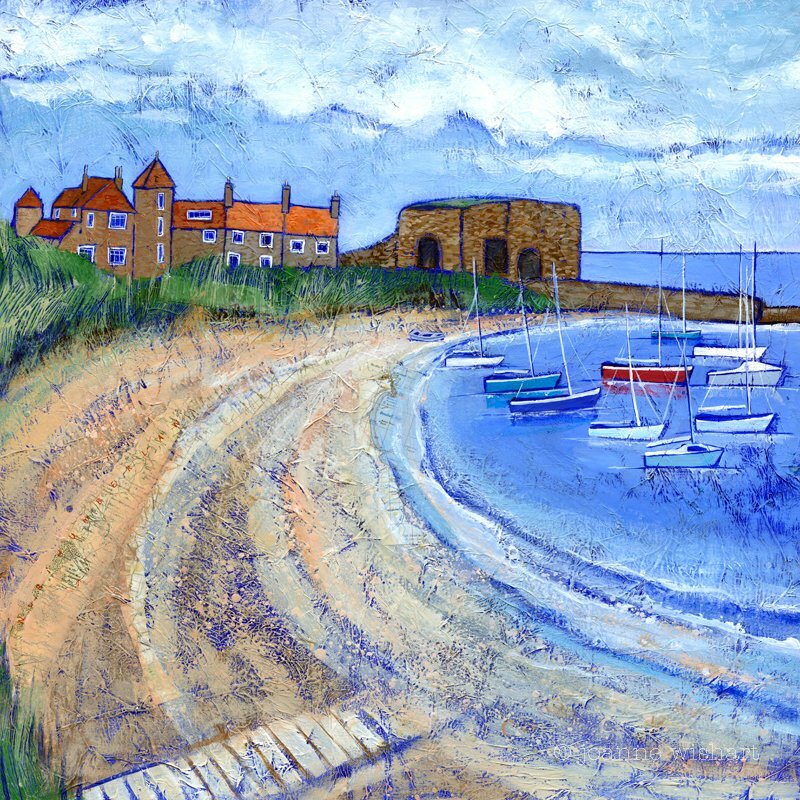 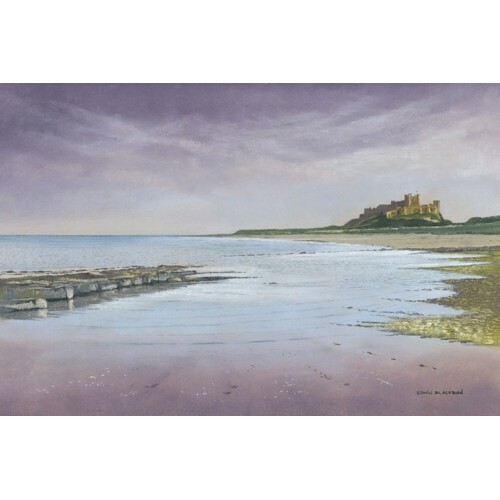 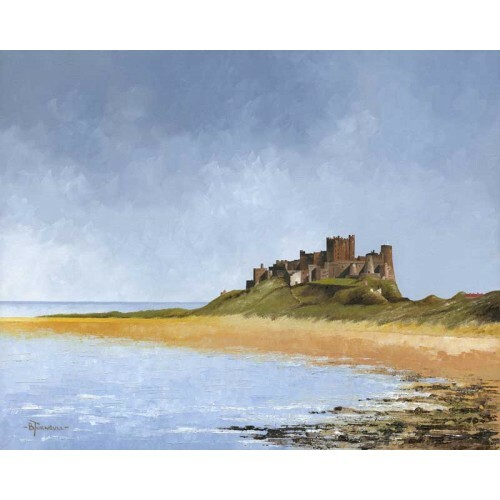 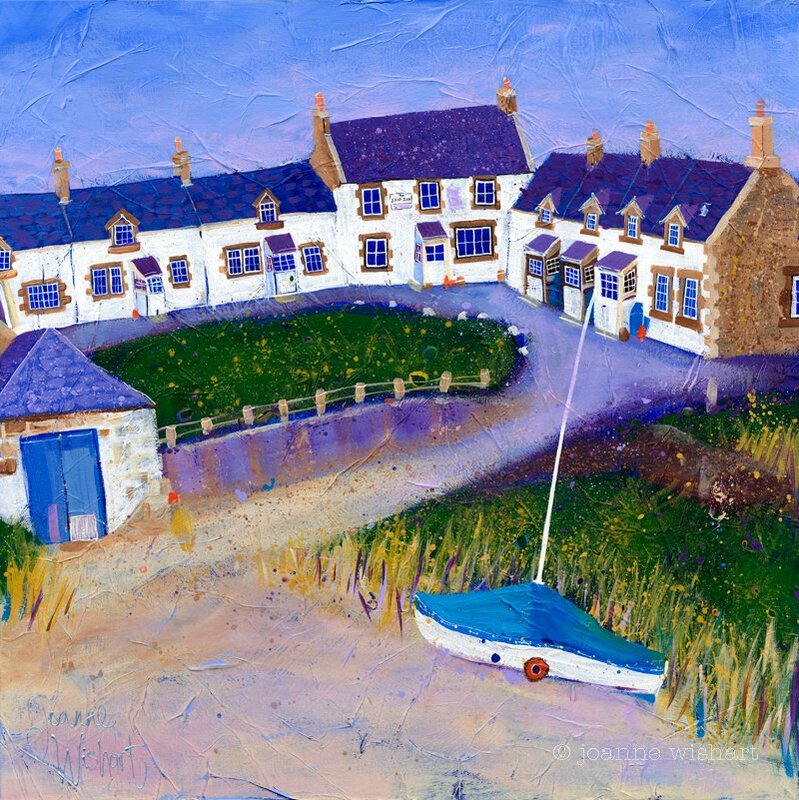 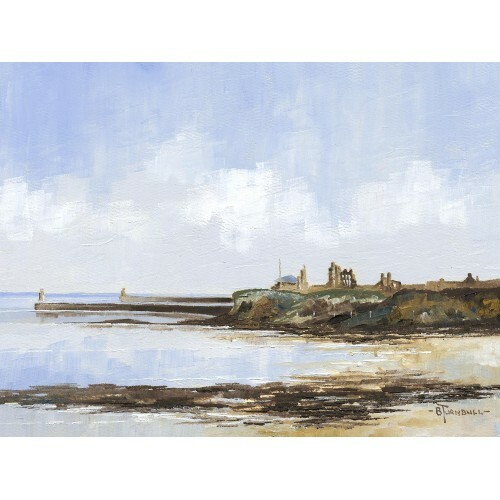 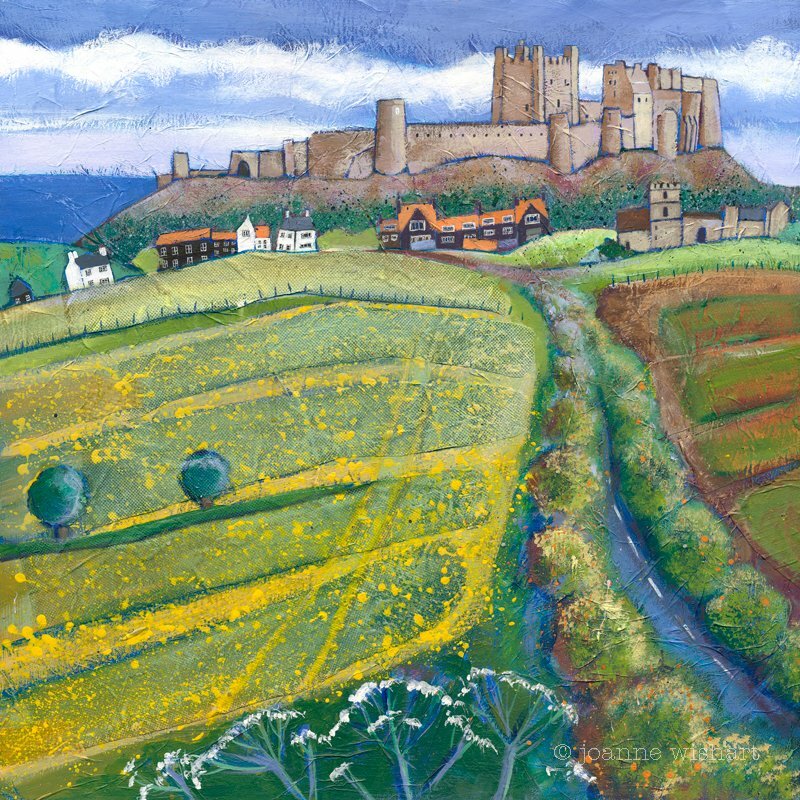 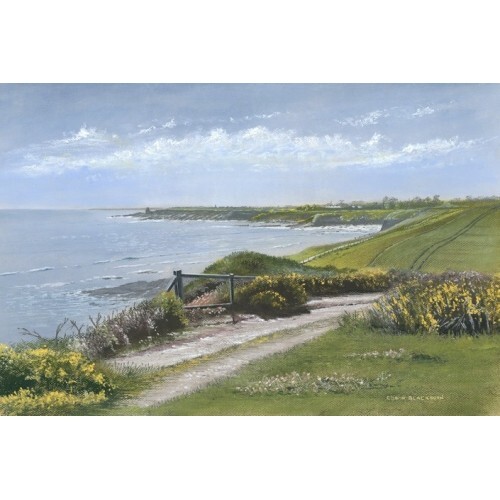 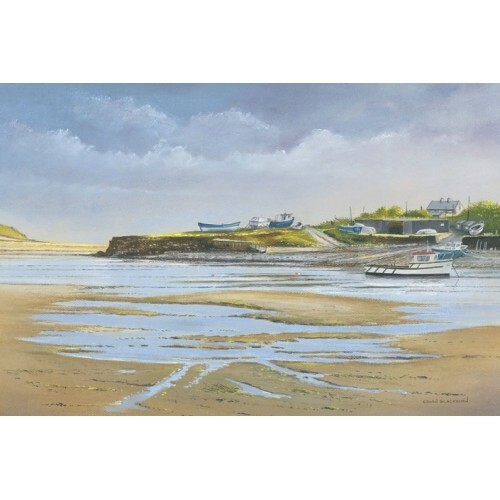 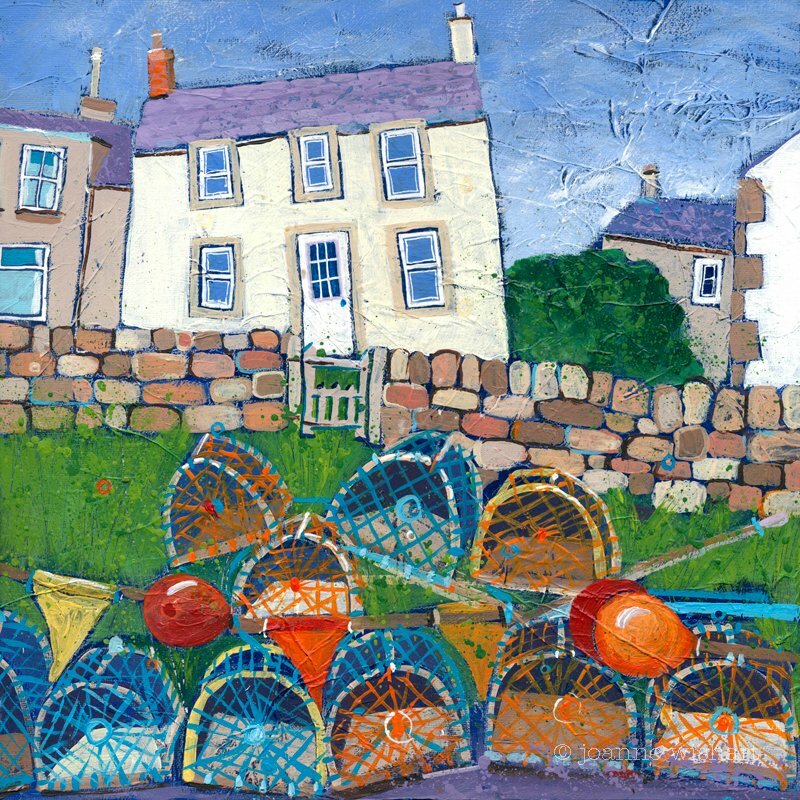 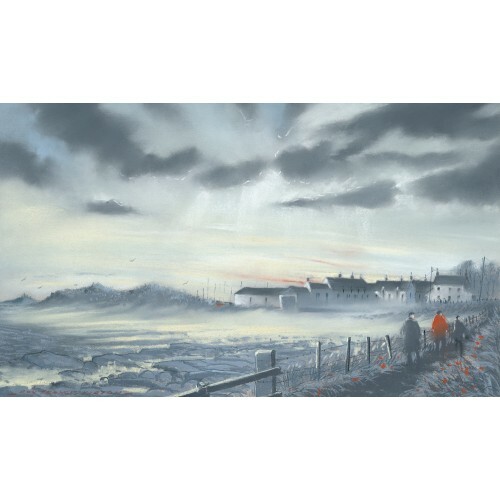 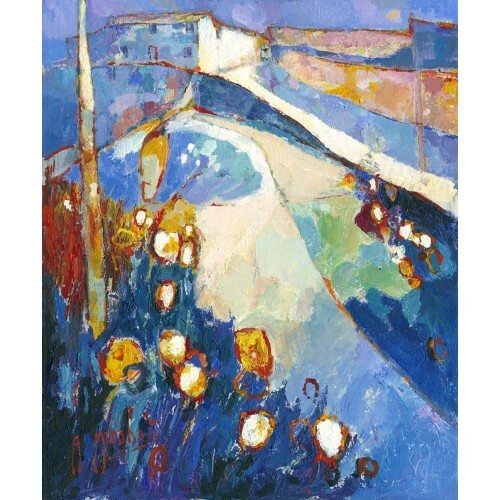 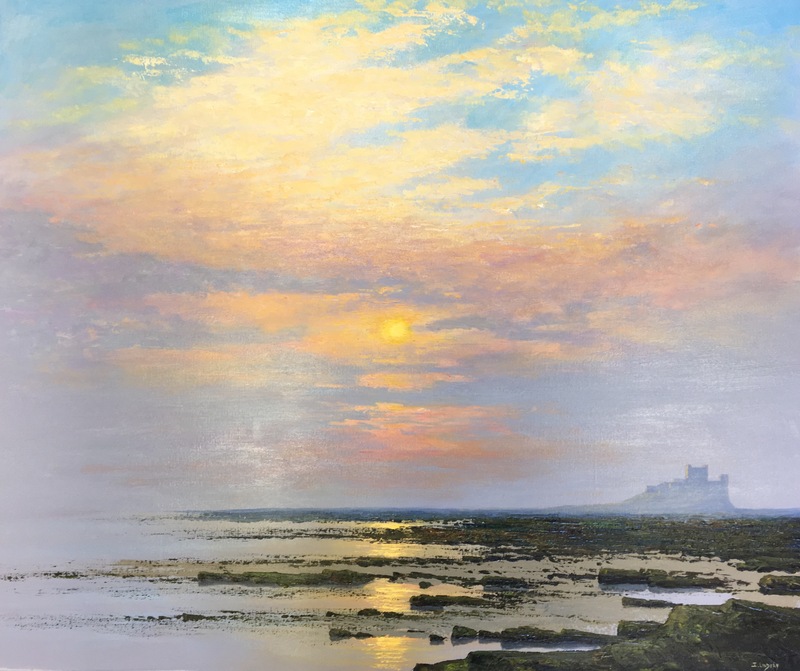 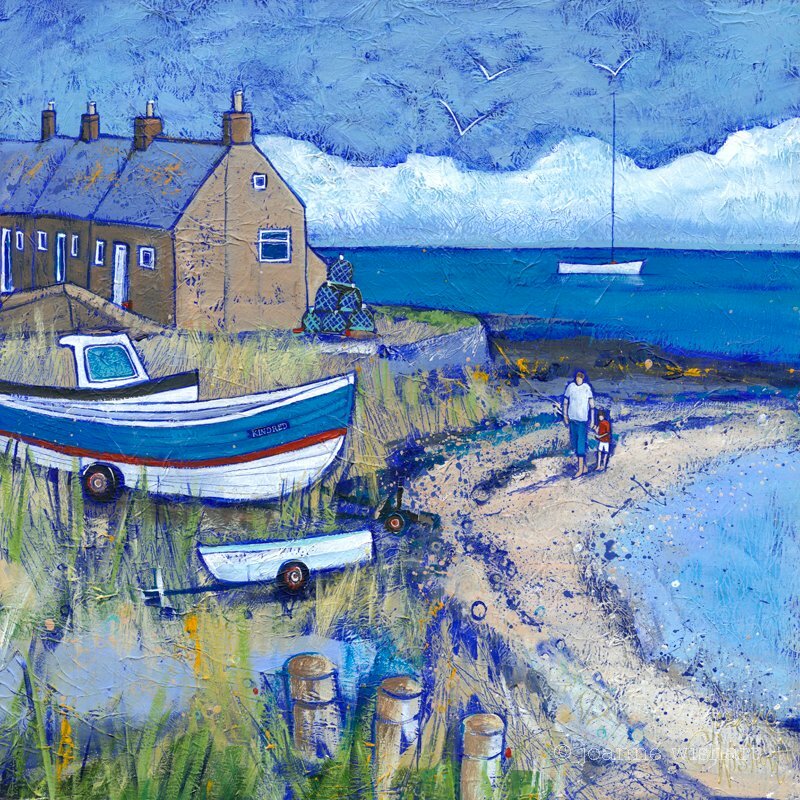 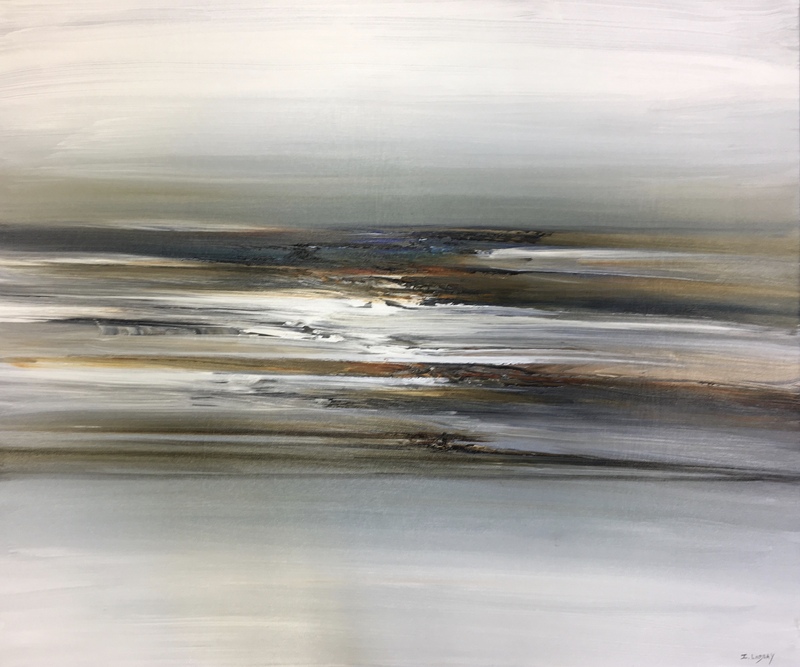 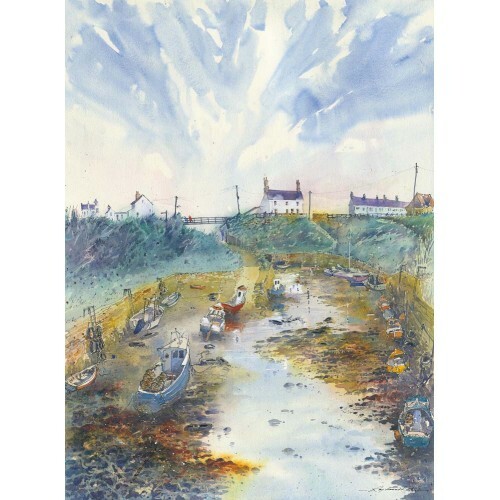 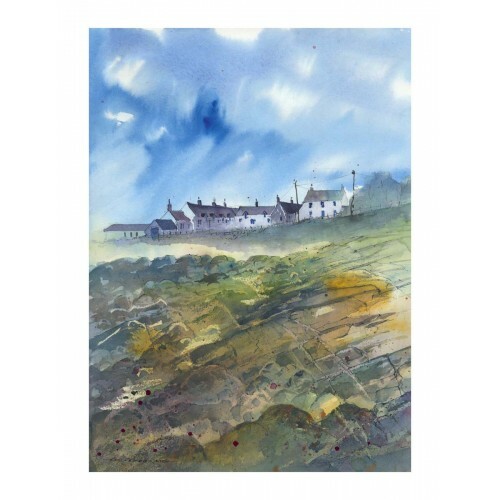 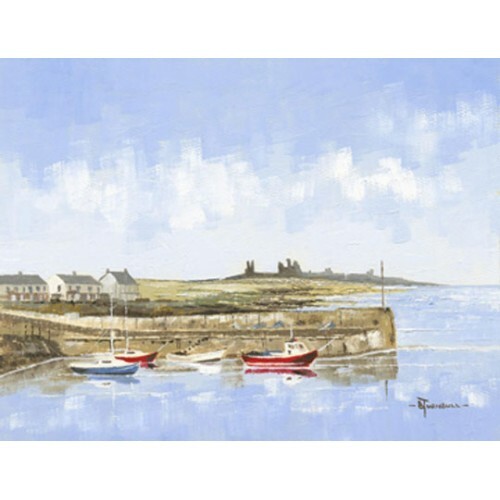 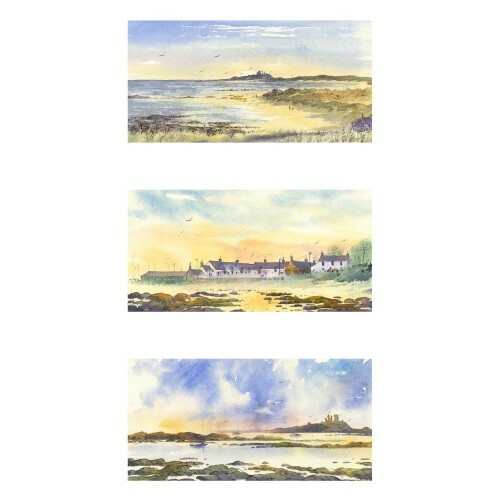 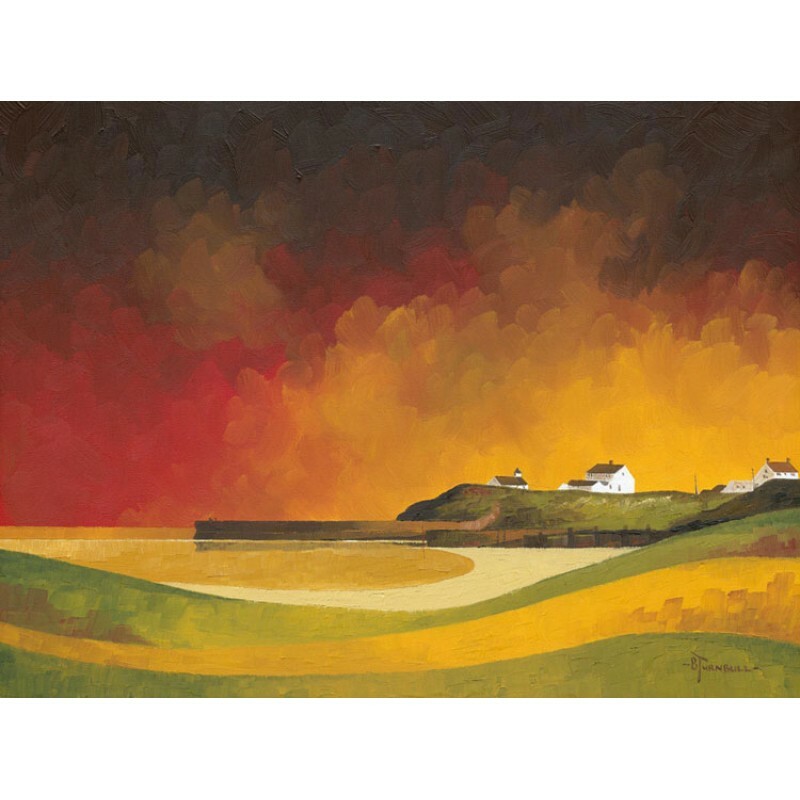 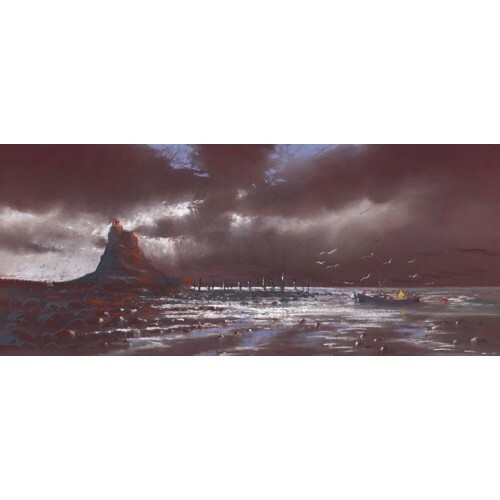 The painting is located about a mile south of Craster village, the path passing a small rugged bay looking south towards the village of Howick. 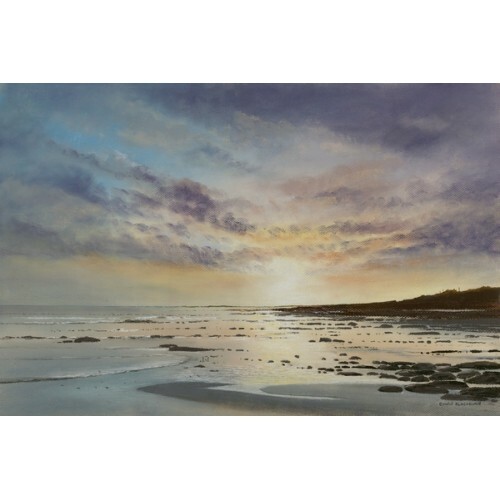 Sunrise at Cresswell beach located on the Northumberland coast. 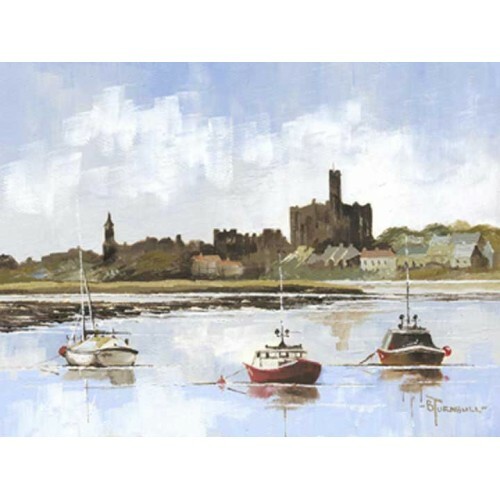 Looking towards the village of Warkworth in Northumberland with it’s castle prominent on the horizon. 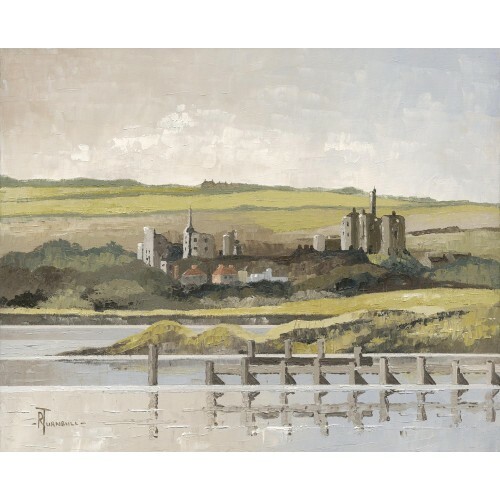 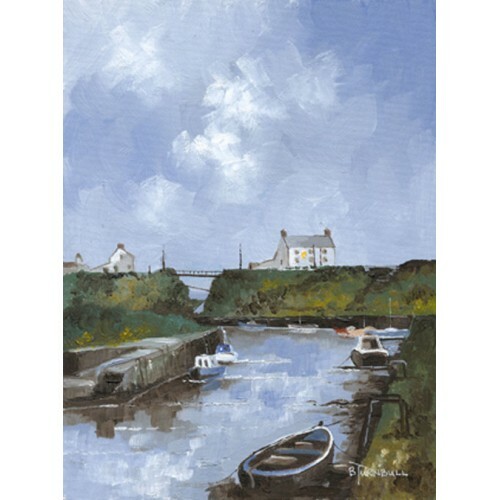 Viewed from Amble harbour looking up the River Coquet on a receding tide. 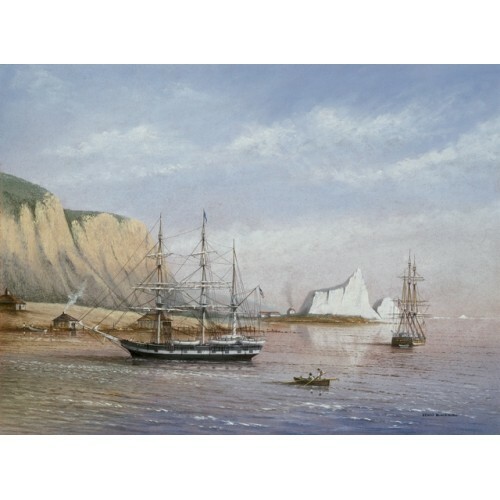 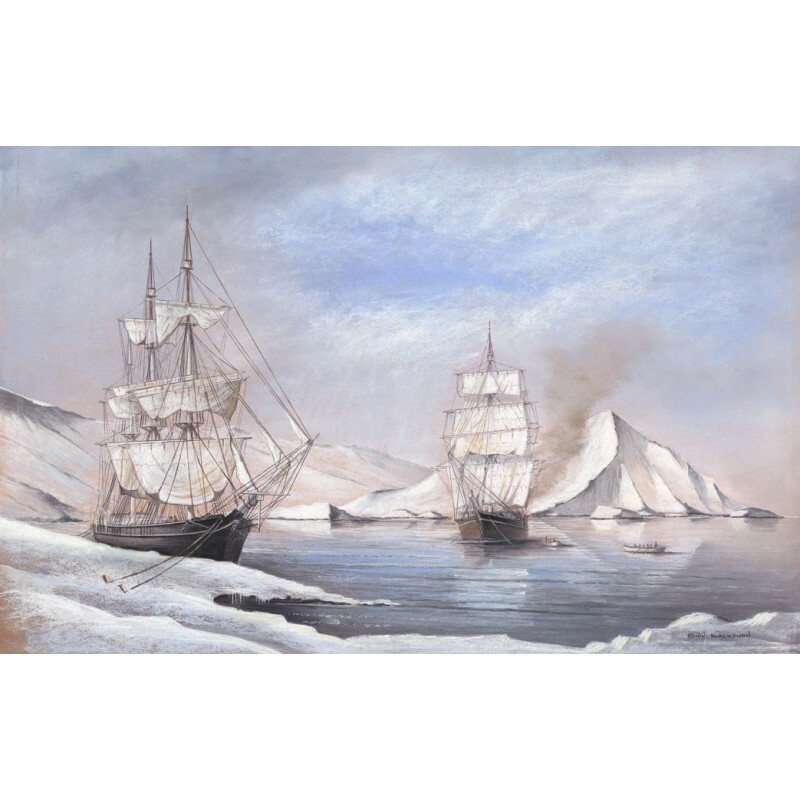 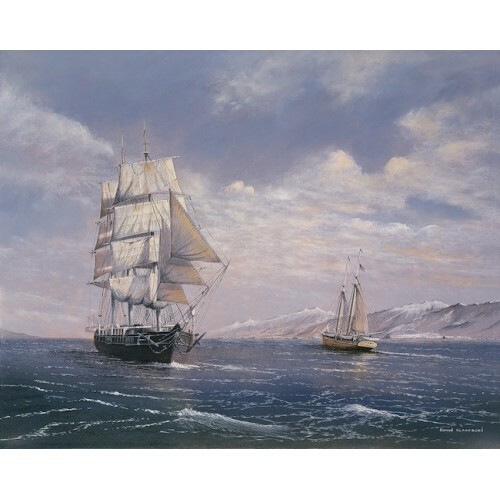 American whalers moored off a whaling station near Cape Charles, Labrador during the summer of 1873. 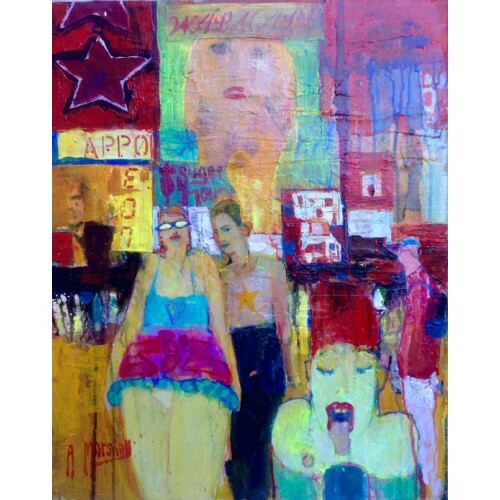 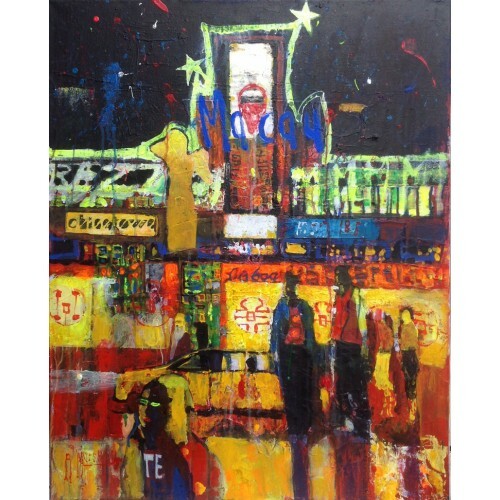 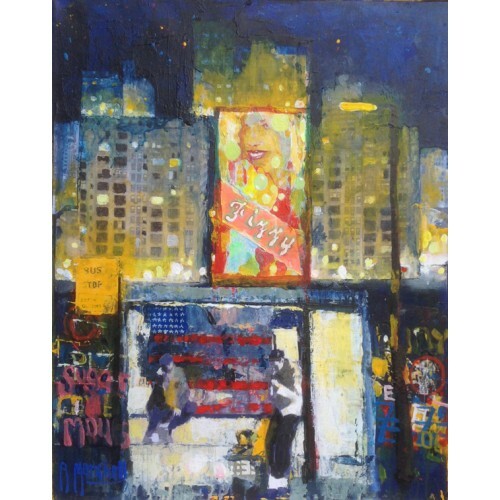 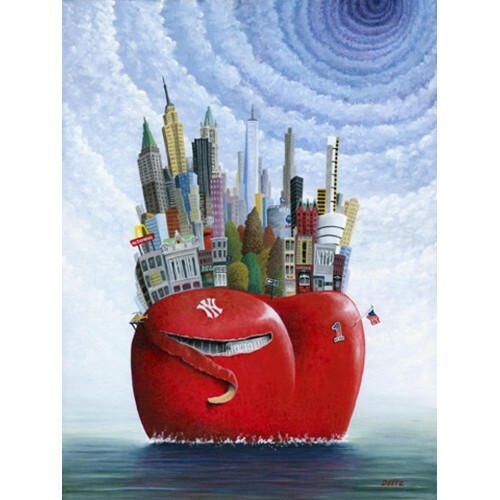 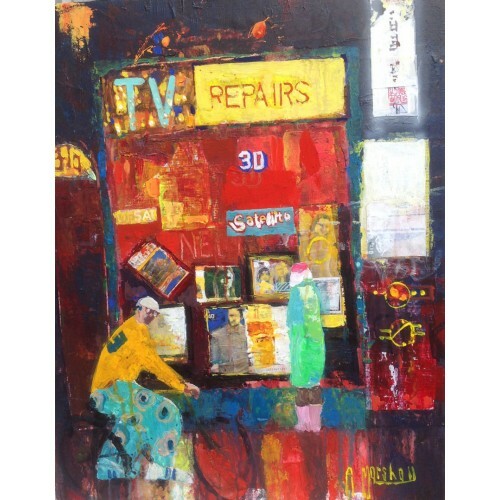 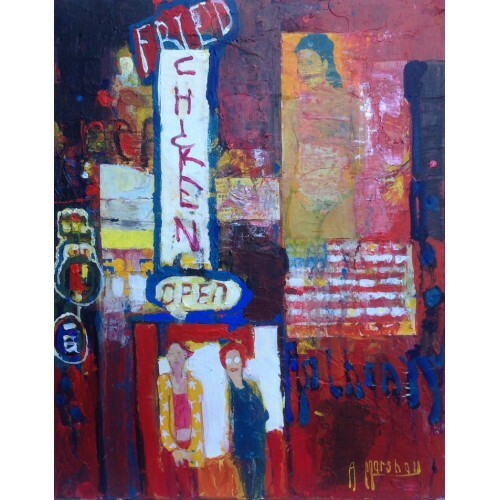 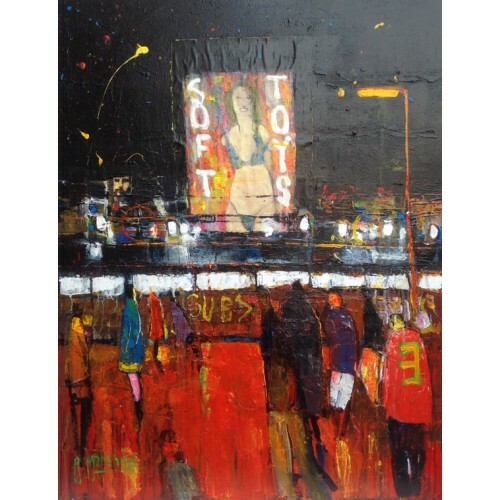 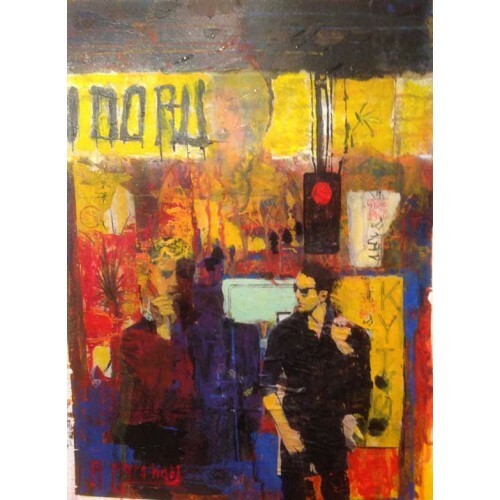 Welcome to the bright colours of Urban Contemporary art. 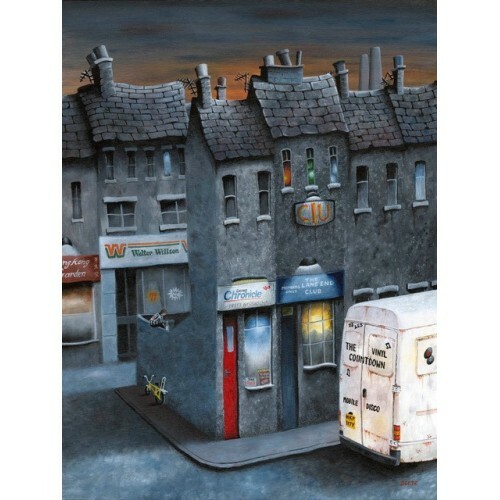 See the neon signs read the HD adverts. 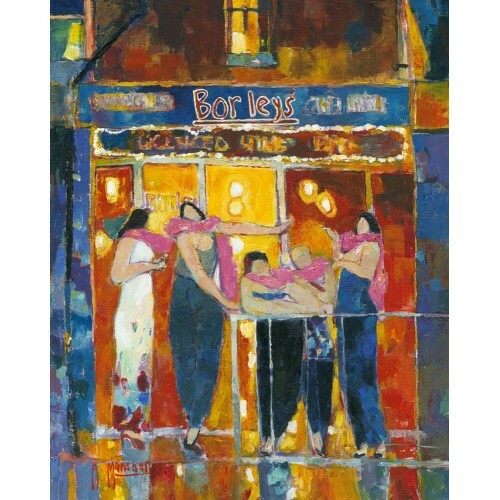 A Hen night to remember at a local tapas bar complete with feather boas. 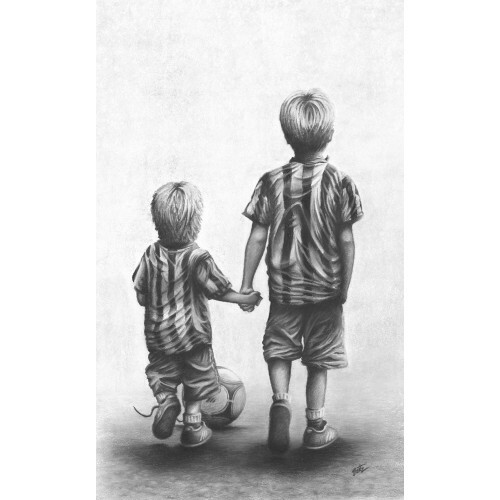 Format: Open edition lithographic print on 310gsm white stock with sheen. 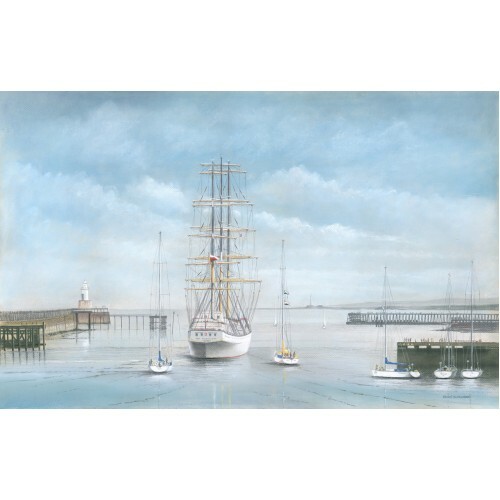 The monument was erected in 1845 by Public Subscription to the memory of Admiral Lord Collingwood and stands at the mouth of the River Tyne at Tynemouth. 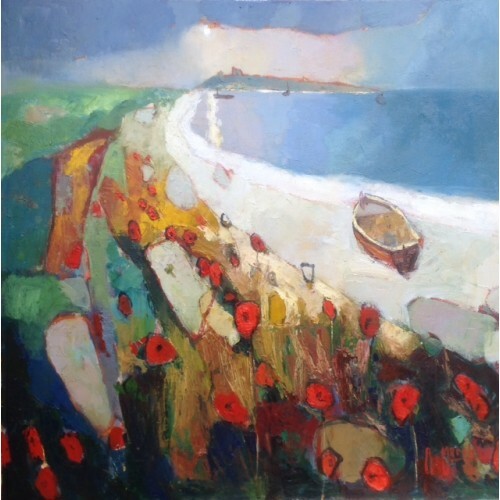 Such a pretty sight to see bright red poppies contasting with the golden beaches around Dunstanburgh. 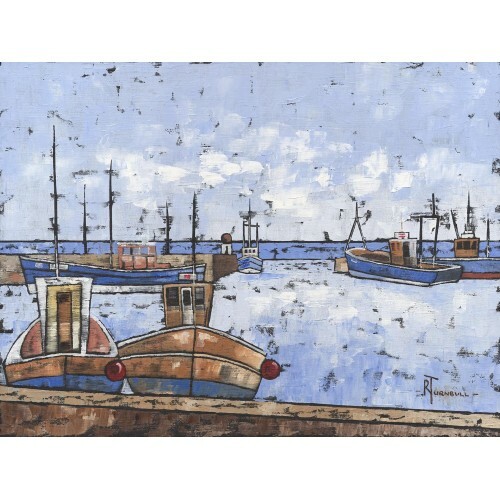 A delight to visit, fishing boats return to harbour with their valuable catch. 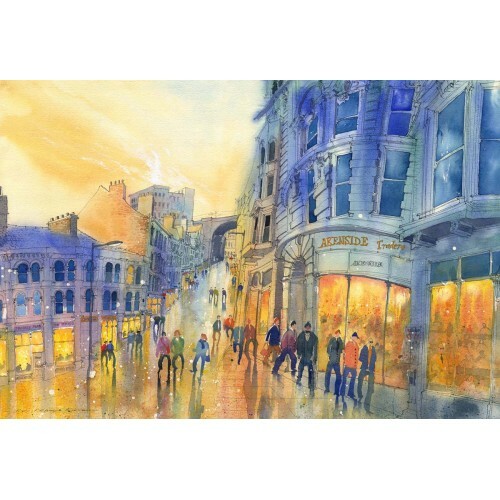 Shops closing and everyone coming out to relax and have fun. 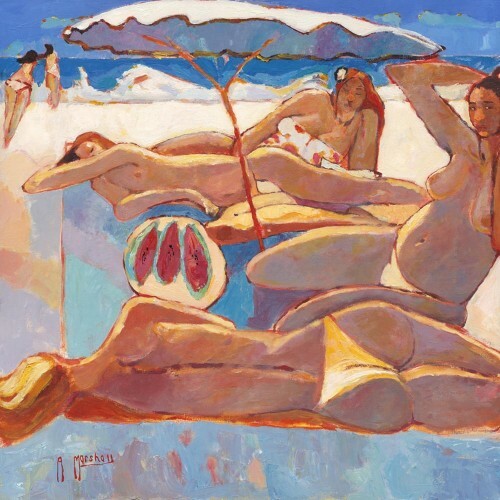 After a hot sunbathing session on the beach in Tenerife, you need Melon to cool off. 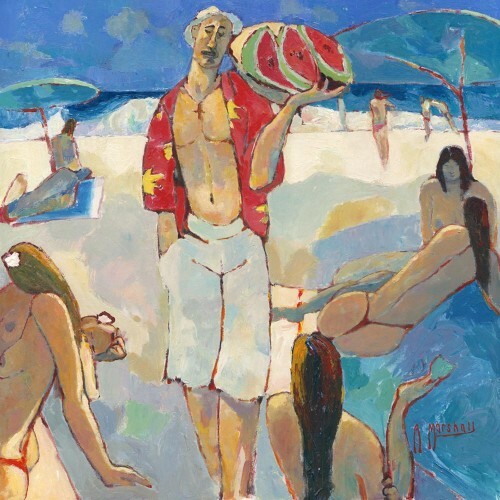 On a hot Teneriffe beach, the Melon Man is a welcome sight. 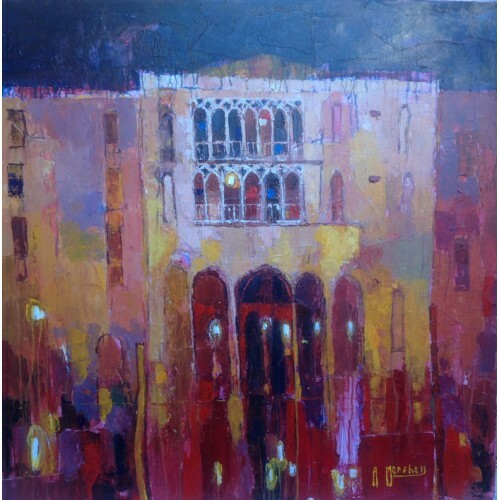 One of the beautiful Venetian palaces situated on the Grand Canal. 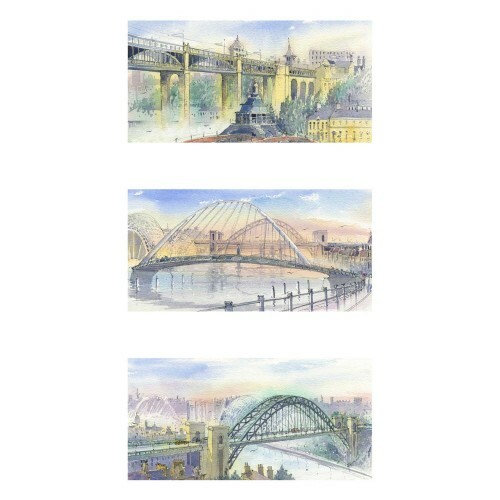 The iconic bridges of the superb Newcastle Quayside, one of the North-East’s top 10 attractions. 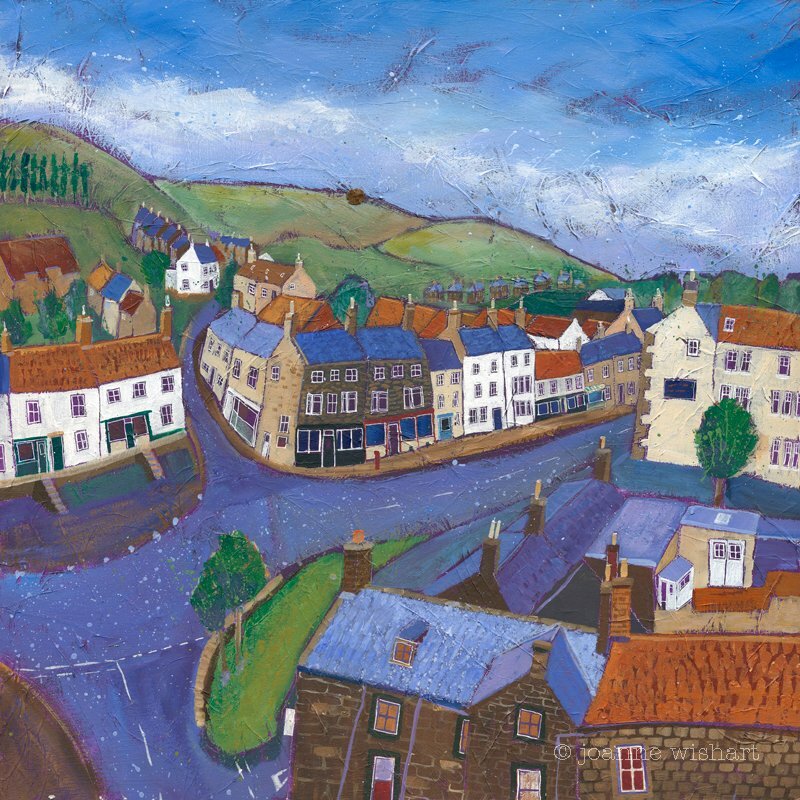 A pretty North Yorkshire village near Whitby, after an April shower. 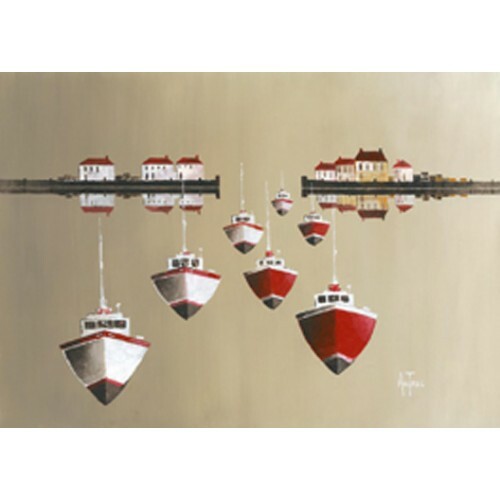 Everyone enjoying themselves on harbour day. 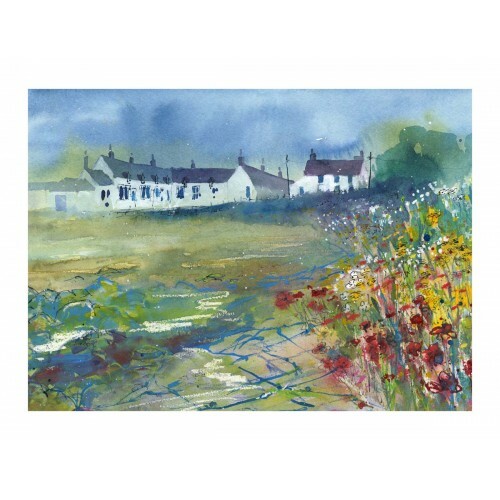 Summer in this beautiful Northumbrian seaside village complete with roadside flowers, what an inspiration. 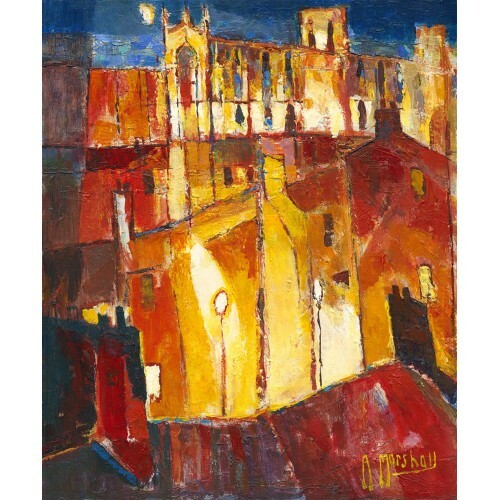 The majestic York Minster is one of the largest of its kind in Northern Europe, here it is lit by town lights. 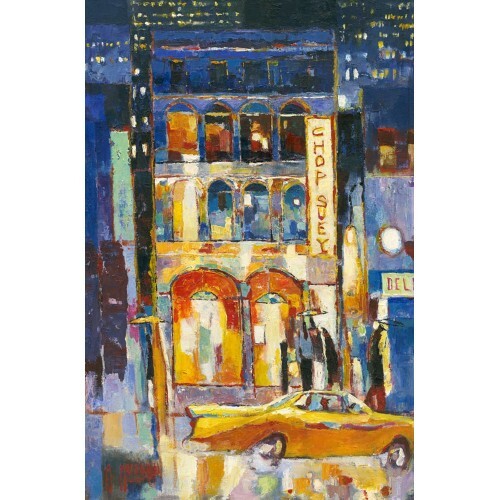 The Big Yellow Taxi an Iconic New York workhorse always on the go. 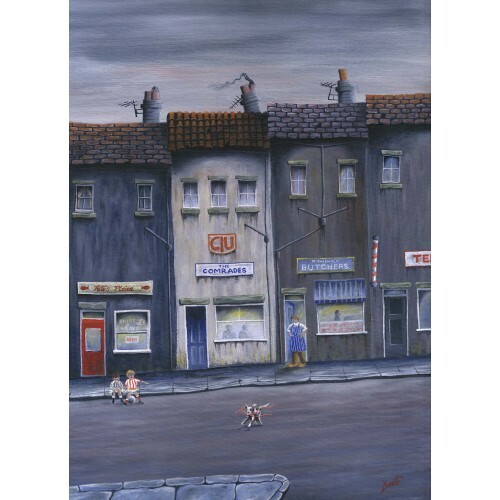 Taking the Bairn yem for tea. 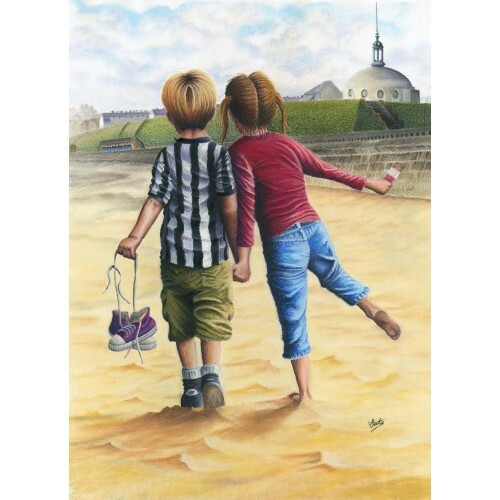 First date at Whitley Bay. 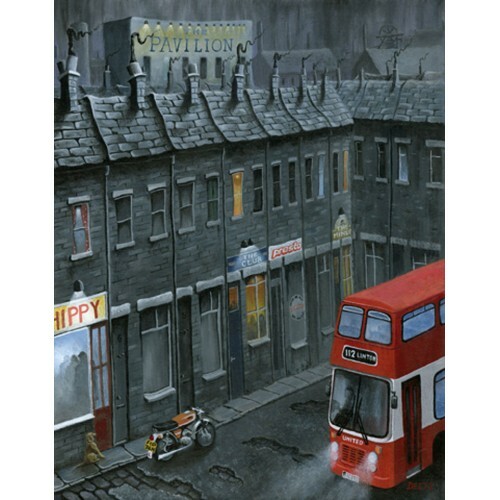 Fizzies are a local name for 50cc Yamaha mopeds which we used to get around town at breakneck speed. 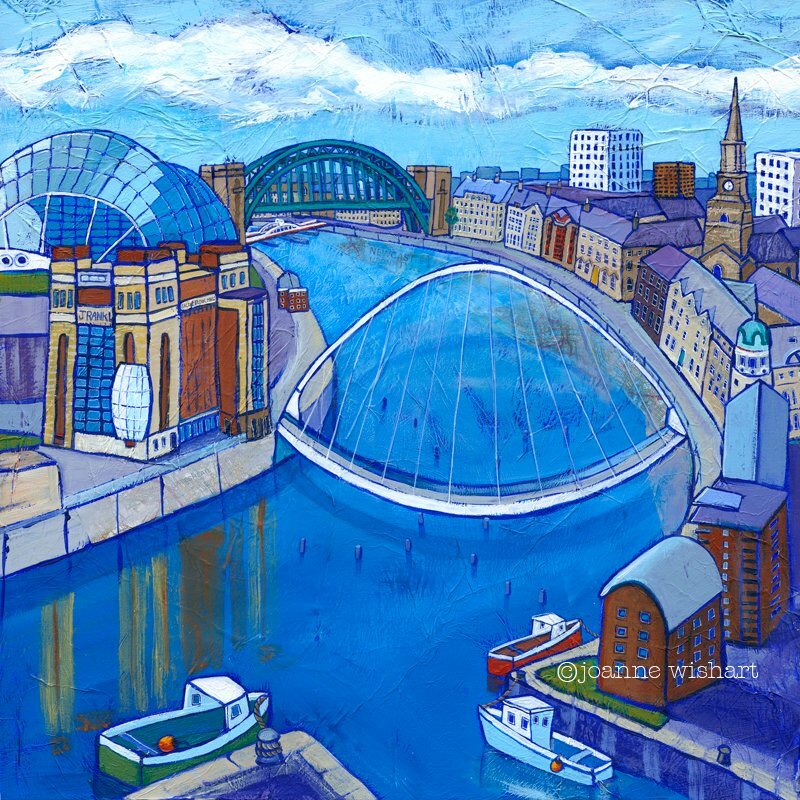 Whether you enjoy the Ouseburn for its bustling alternative music scene, its flourishing creative networks, or its abundant local history and heritage, the valley has something for everyone. 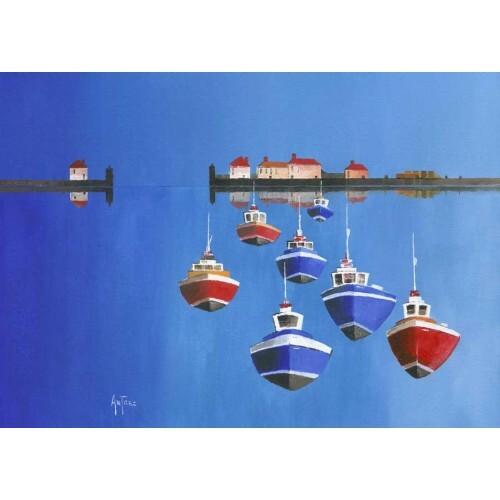 A twist on the famous Amble harbour, Northumberland. 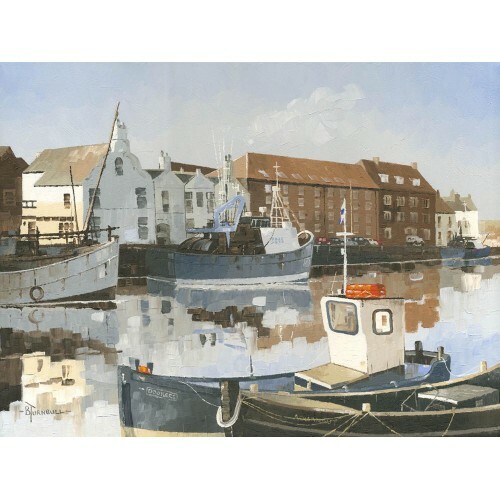 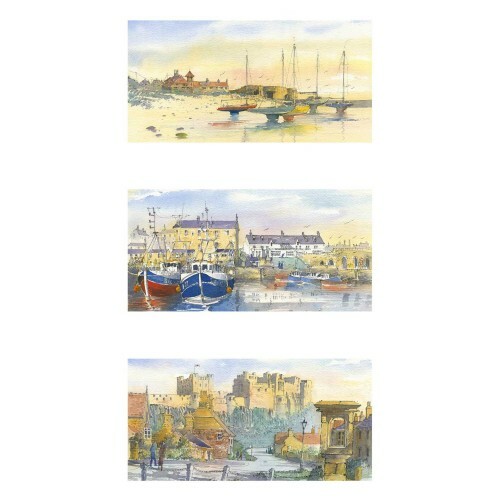 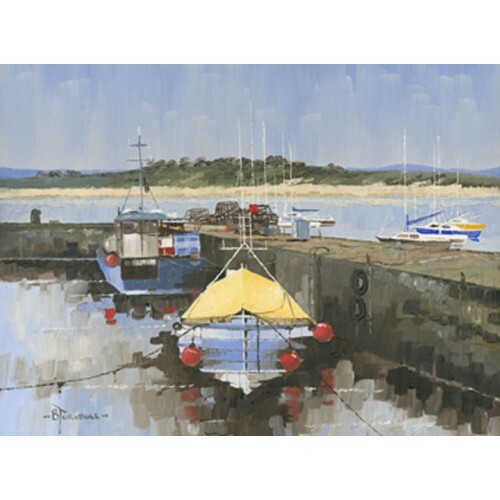 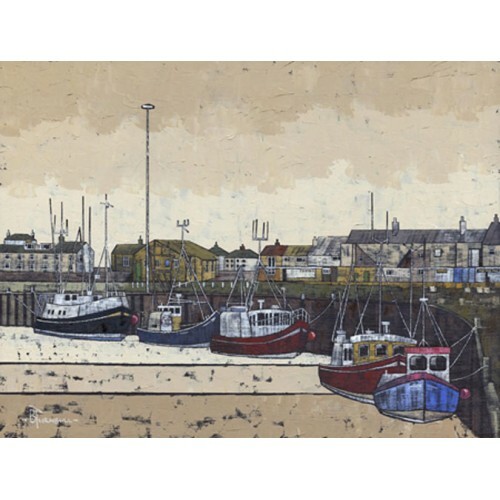 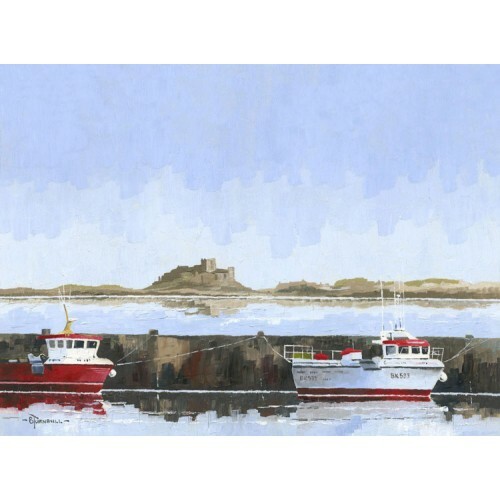 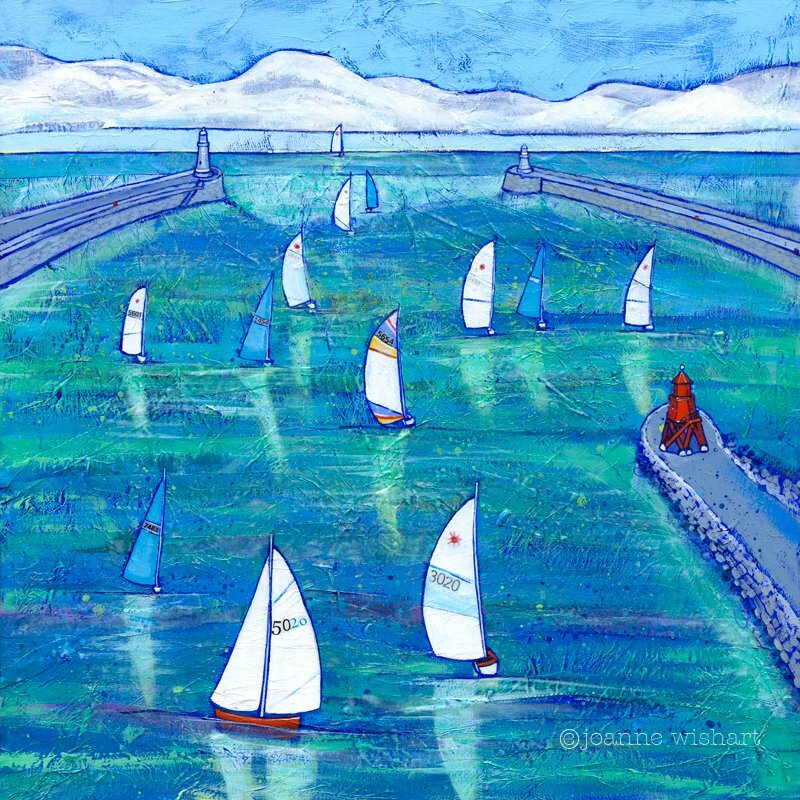 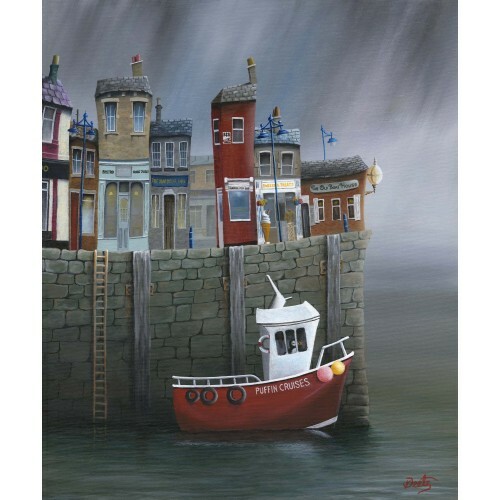 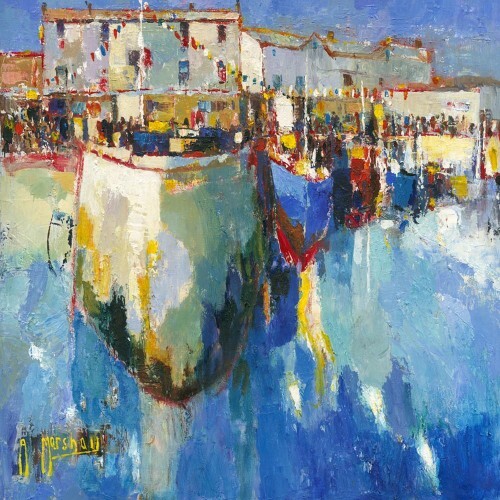 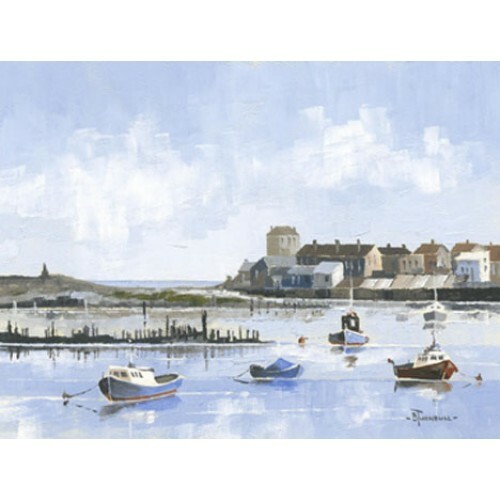 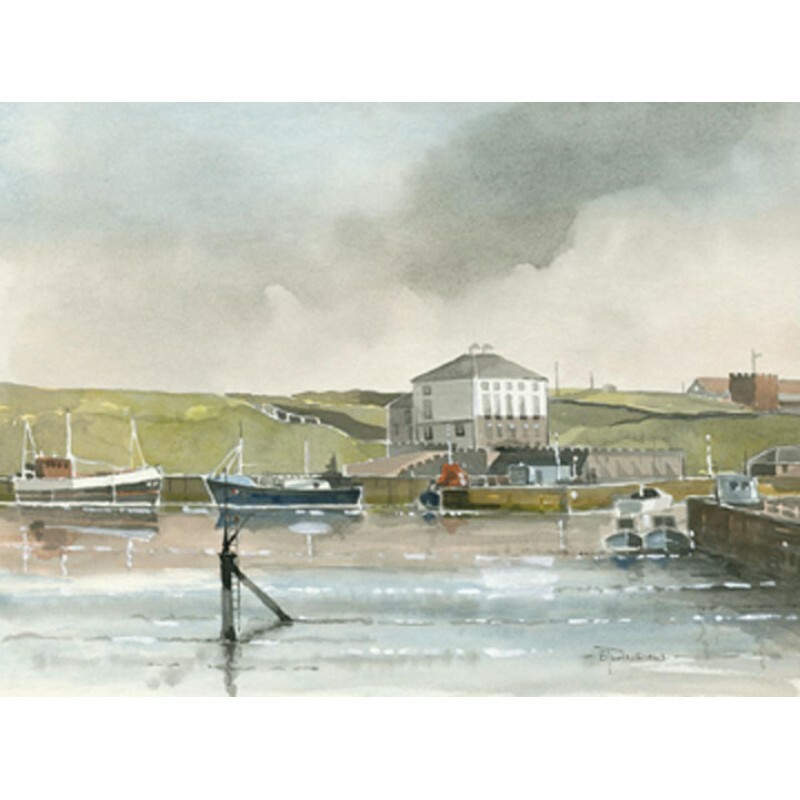 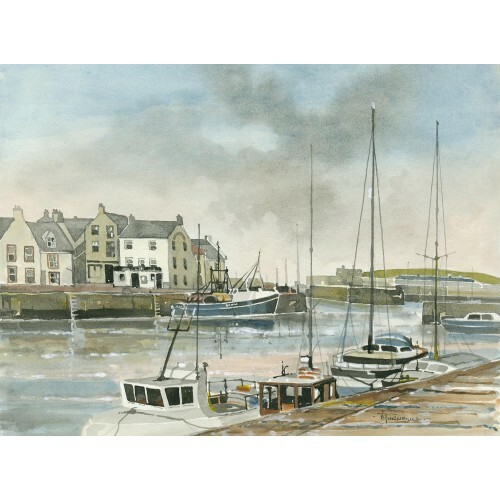 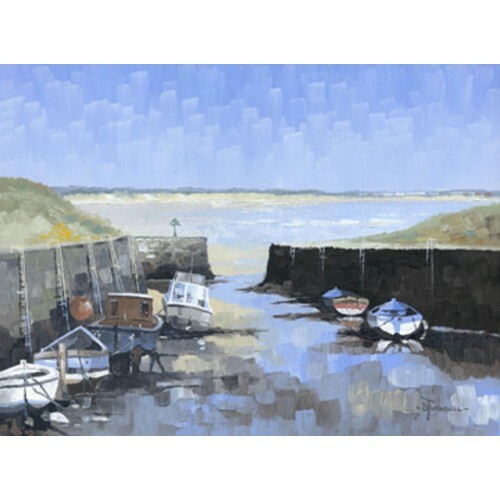 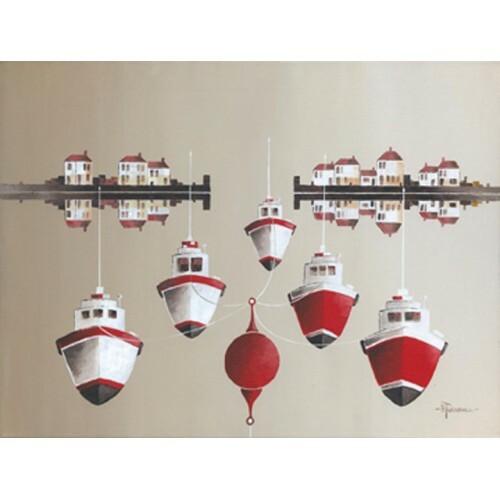 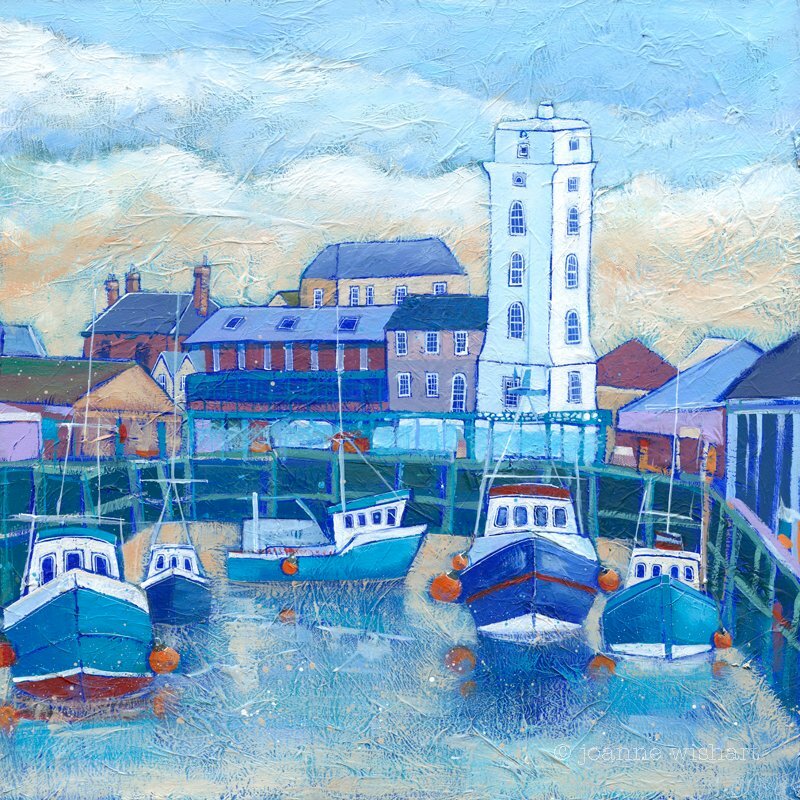 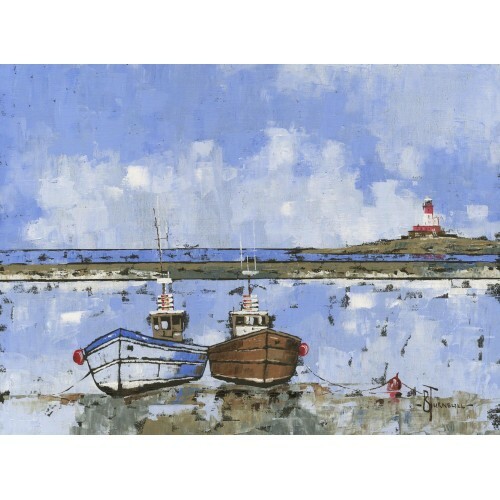 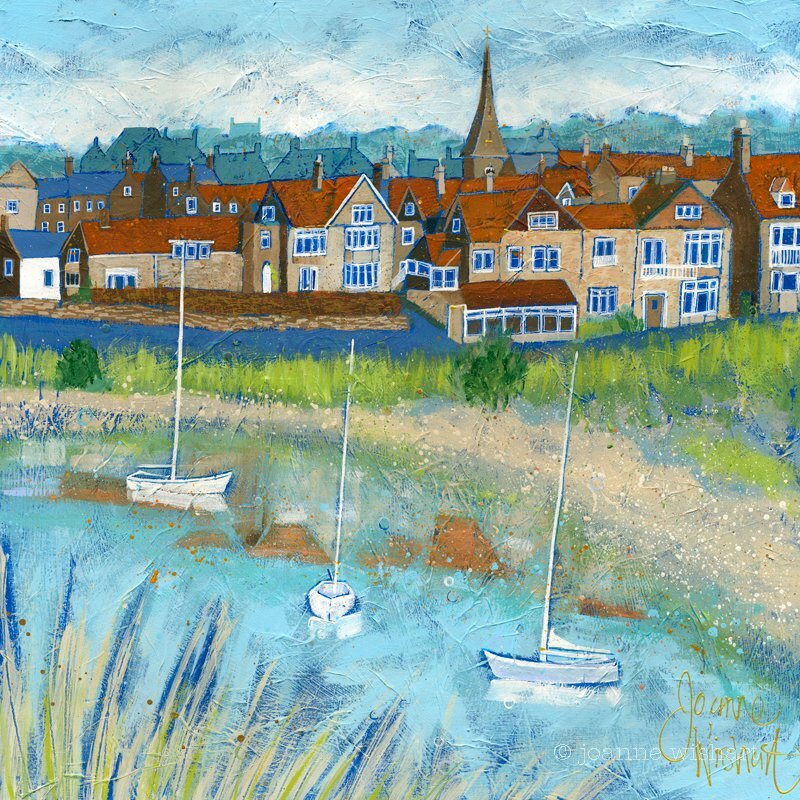 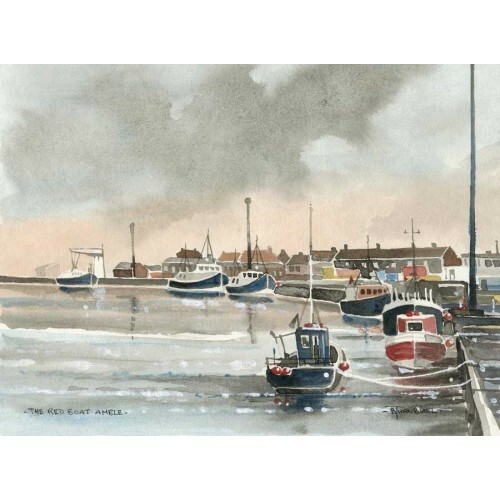 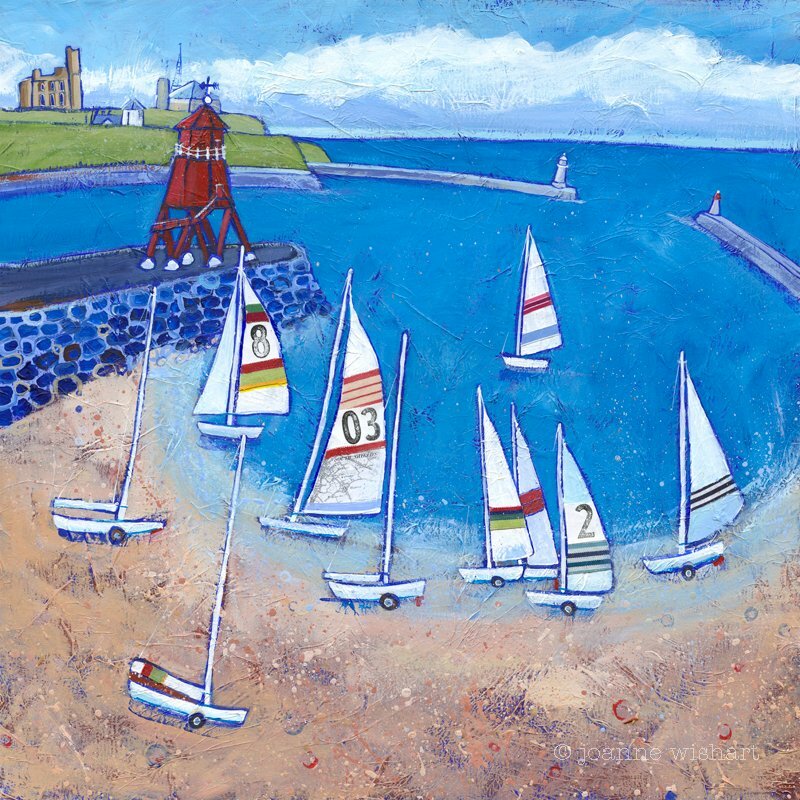 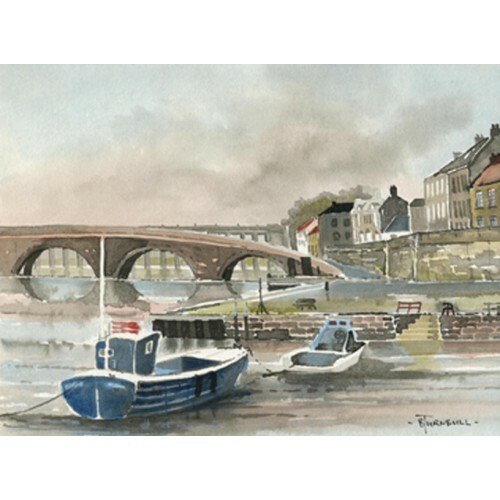 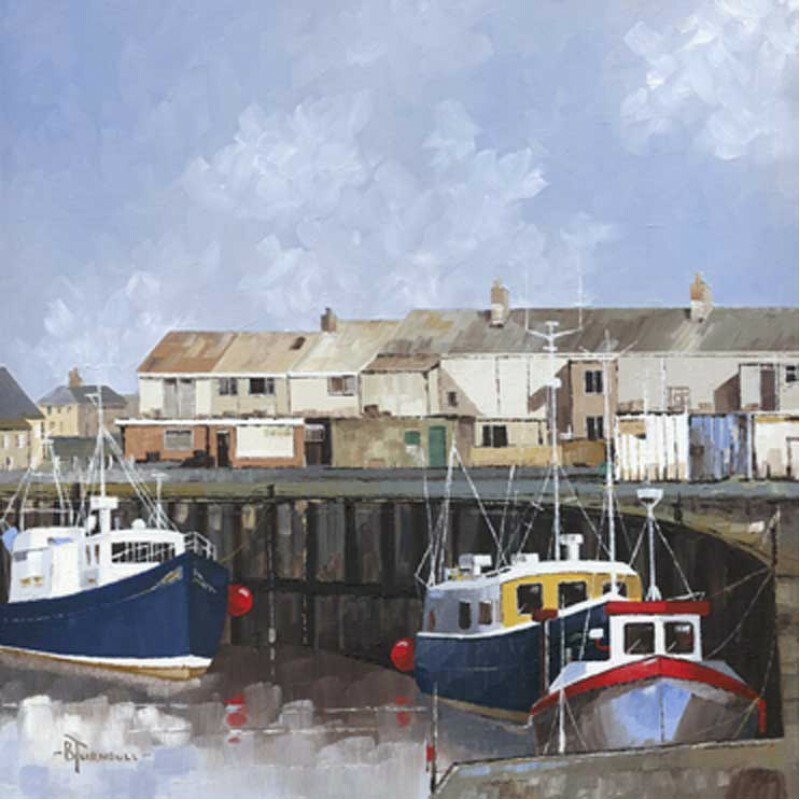 A quirky take on Seahouses harbour. 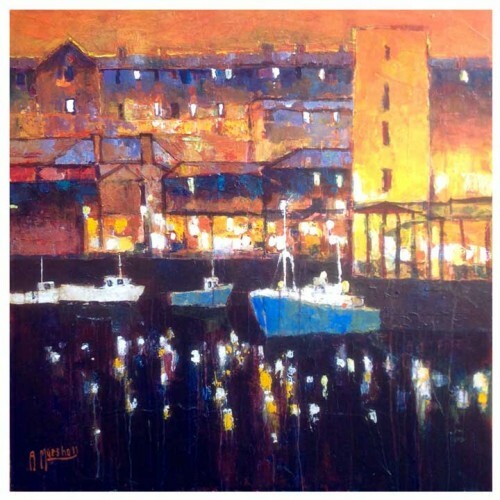 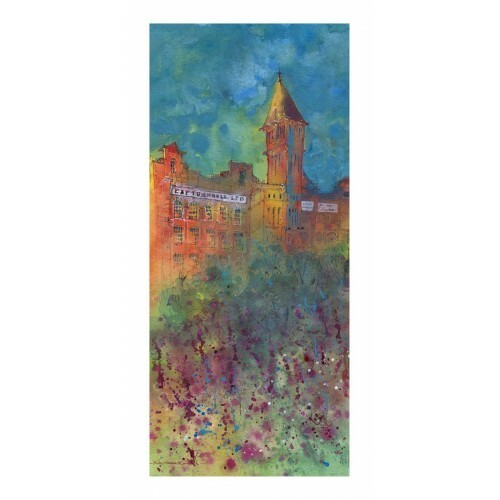 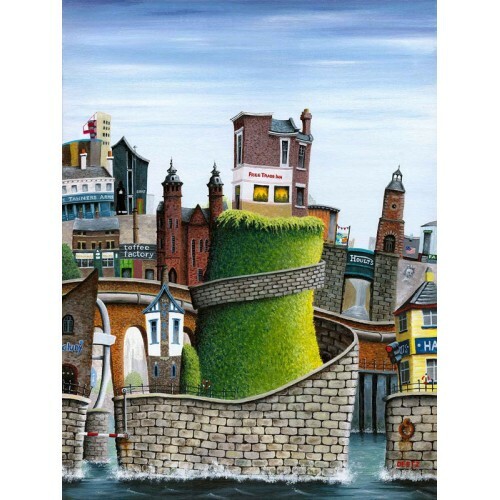 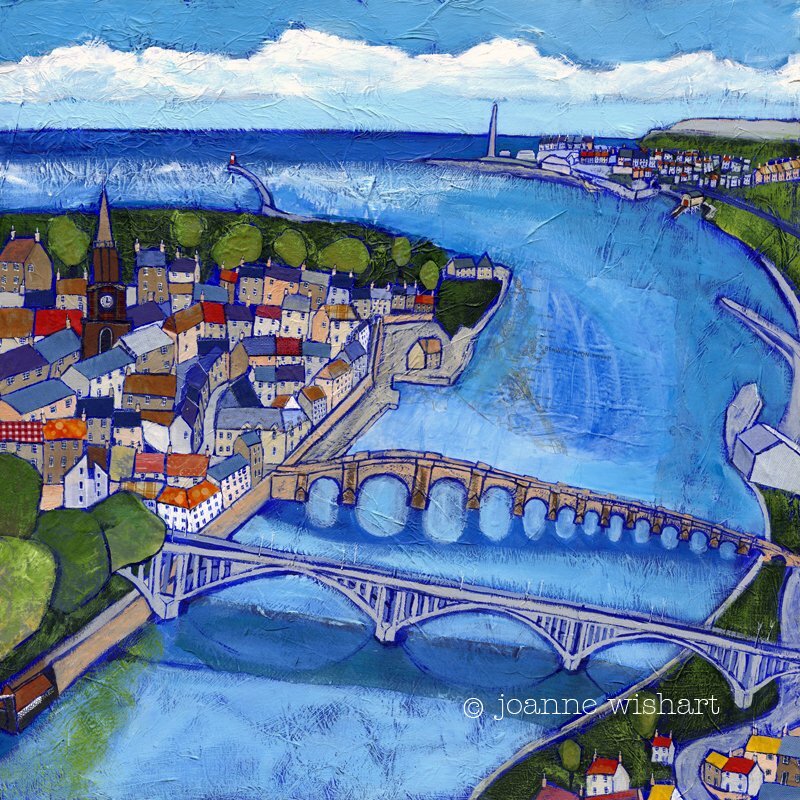 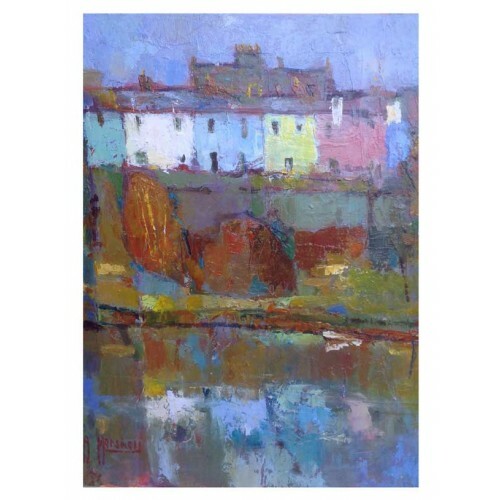 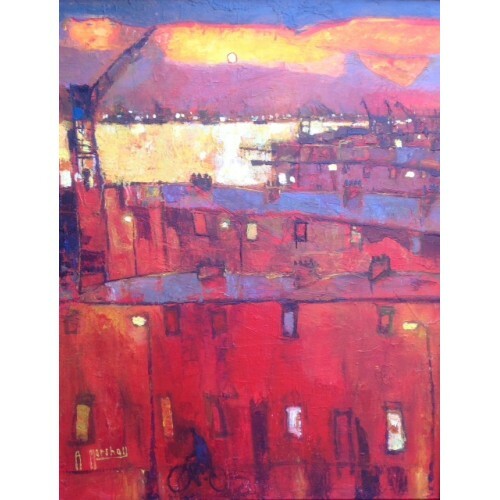 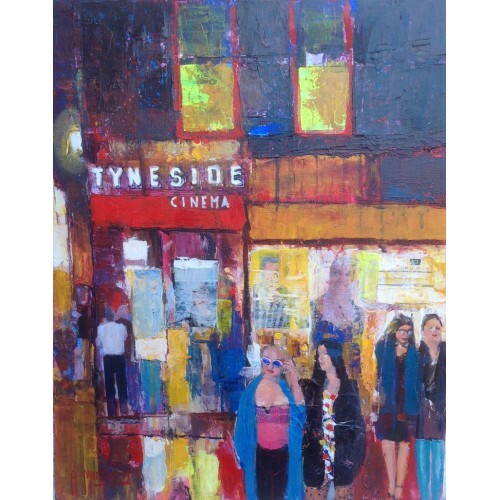 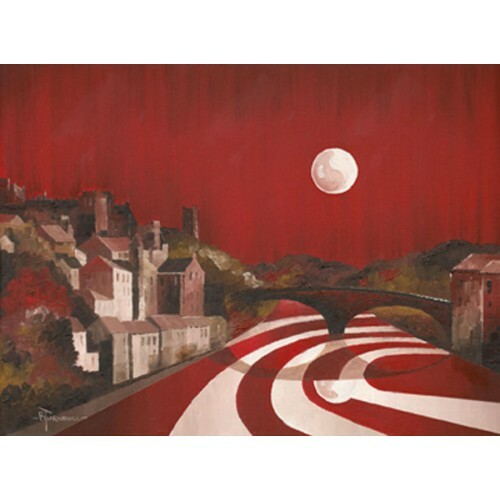 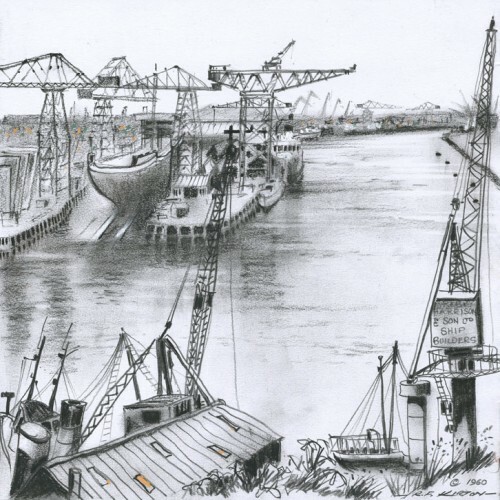 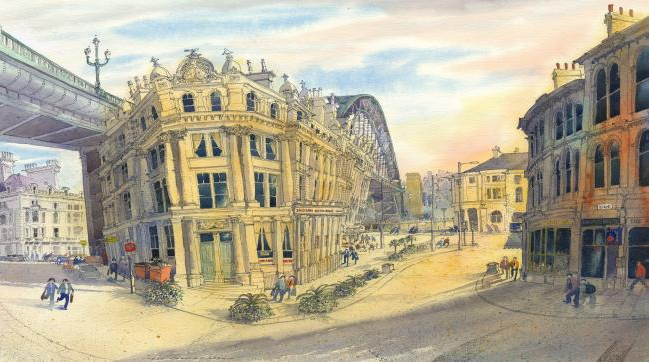 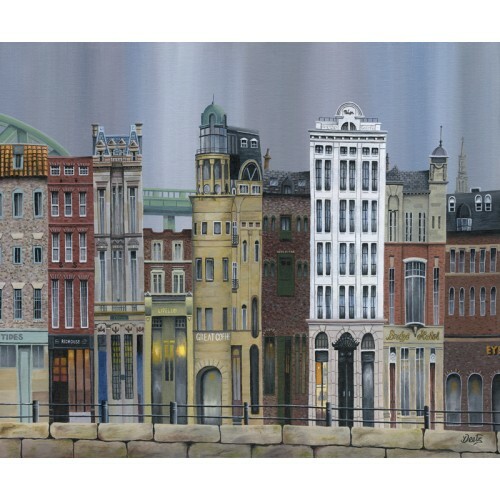 A quirky take on the fabulous Newcastle Quayside. 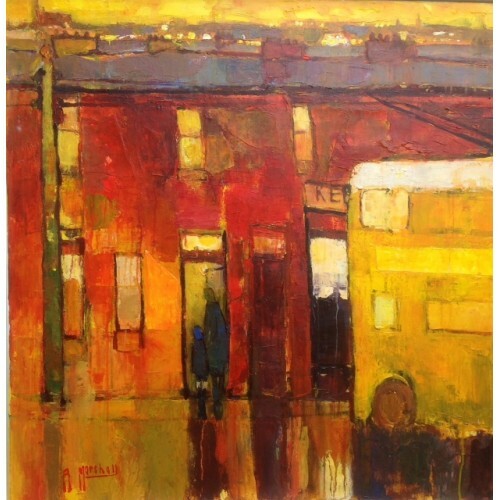 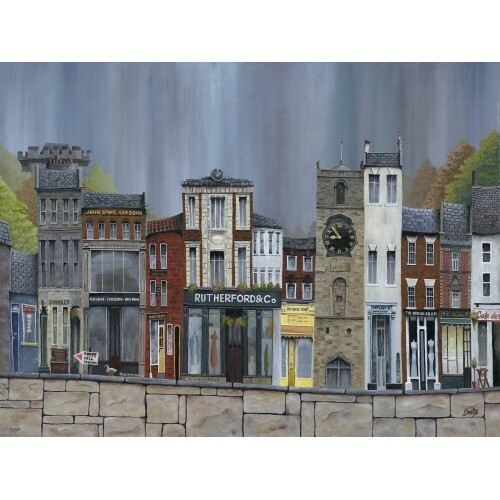 A quirky take on Morpeth, Northumberland. 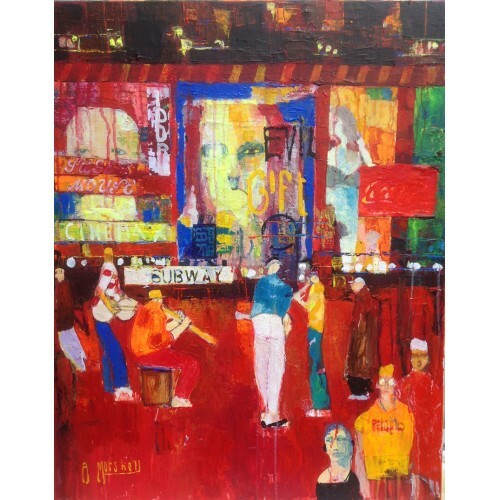 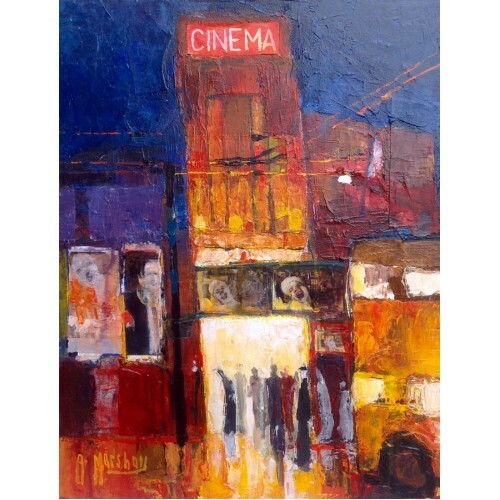 Smaller size mounted and framed print of the Theatre Night pastel. 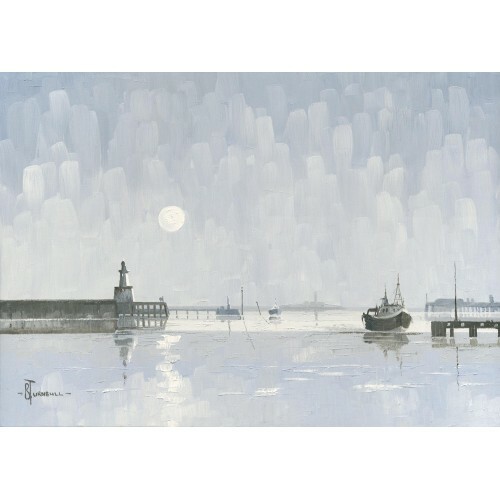 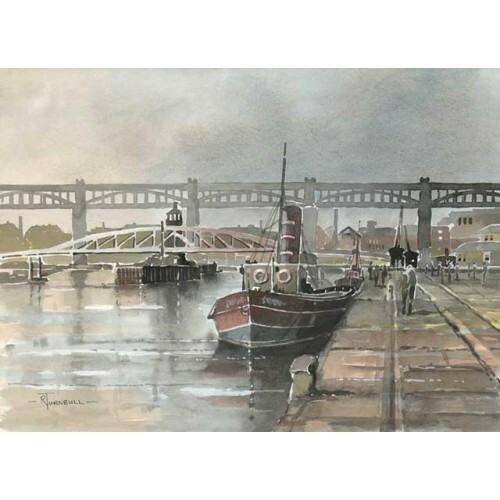 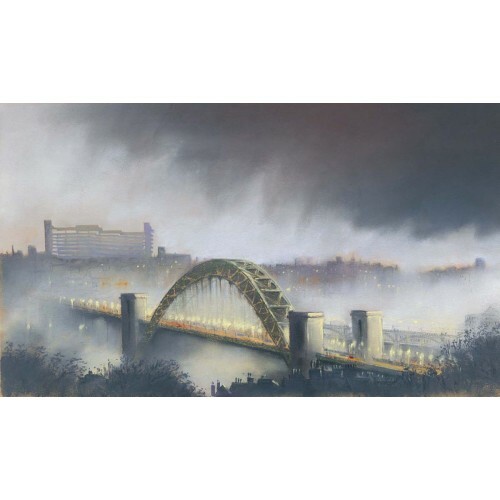 Smaller size mounted and framed print of the Tyne Evening pastel. 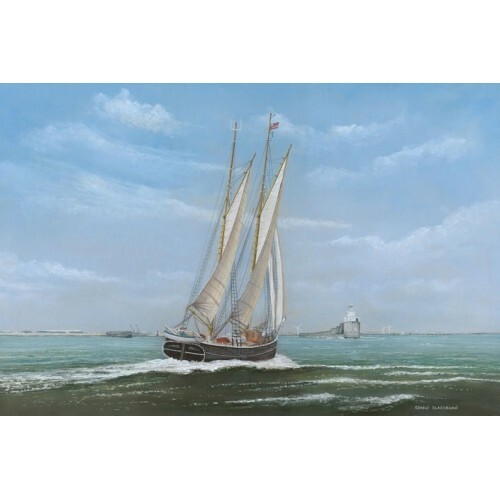 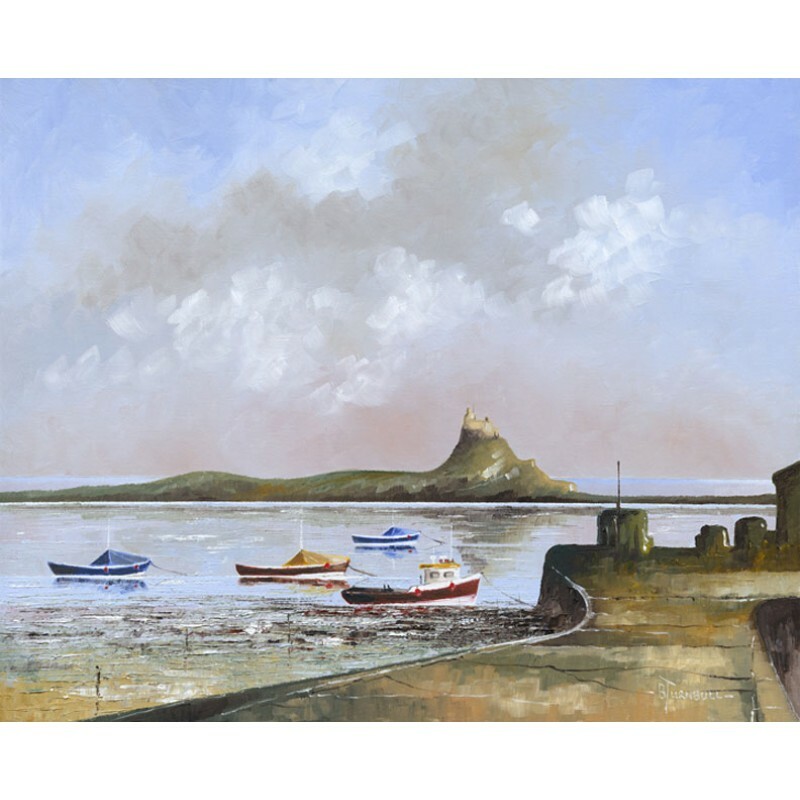 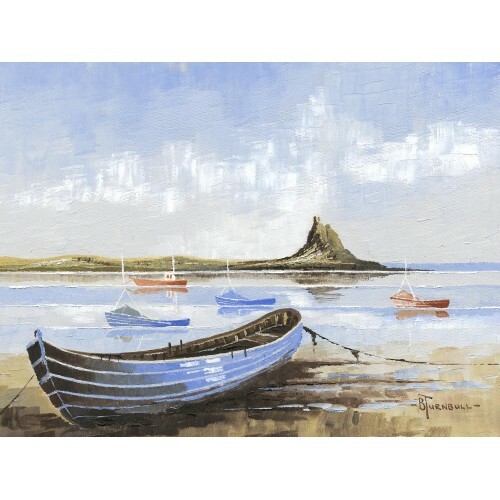 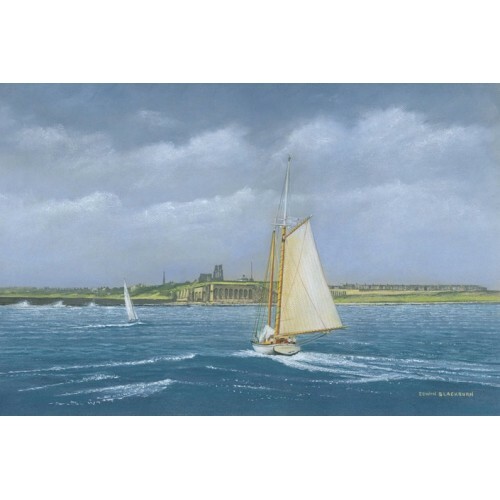 I was out bird watching one day at Lindisfarne harbour when a fishing boat came in and, because it was low in the water, the boat had to wait for the tide to come back in. 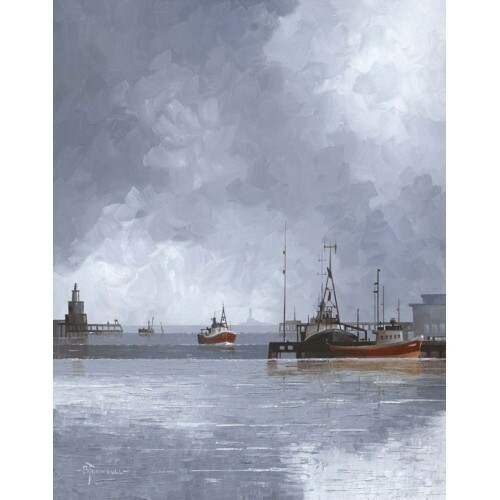 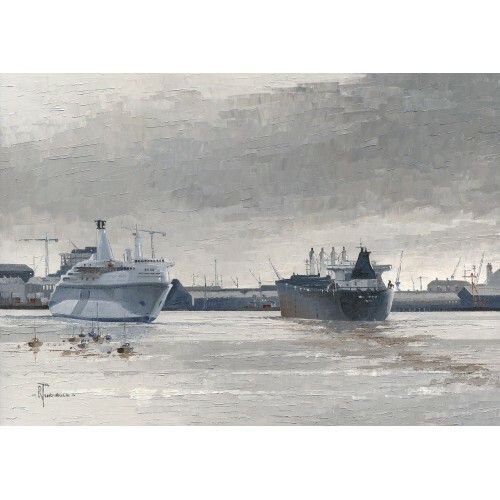 When the fishermen on board started to prepare the fish, the seabirds started to flock around the boat making an atmospheric moody painting against a stormy morning sky. 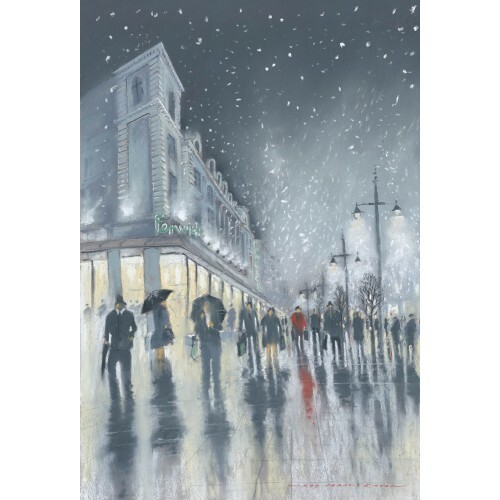 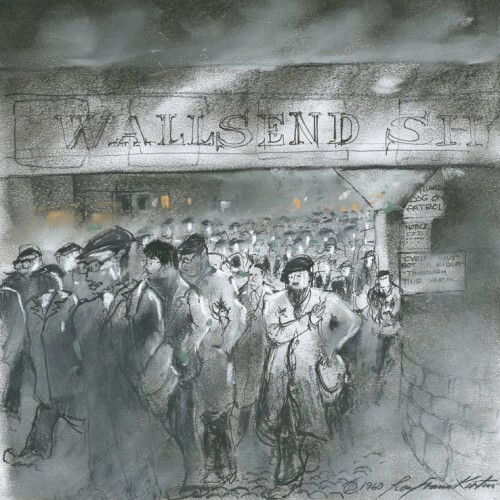 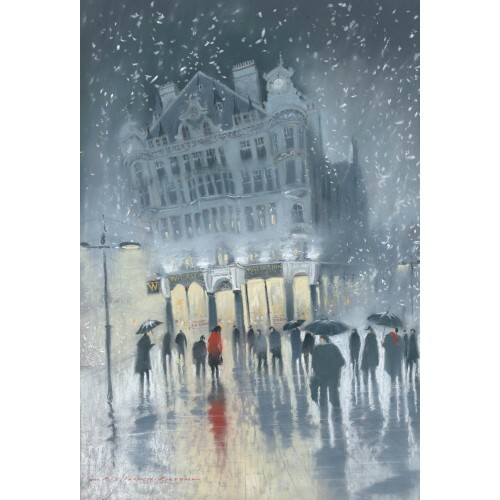 Smaller size mounted and framed print of the Winter Shopping – Northumberland Street pastel. 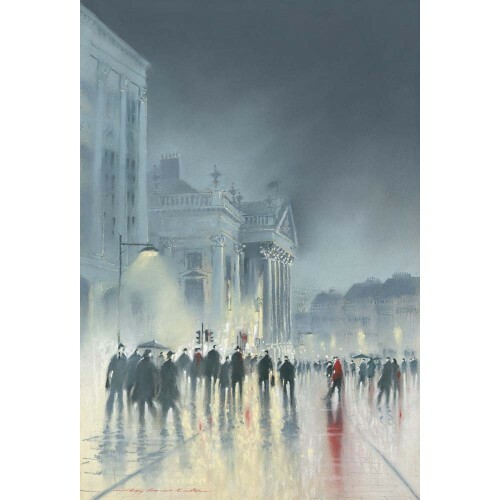 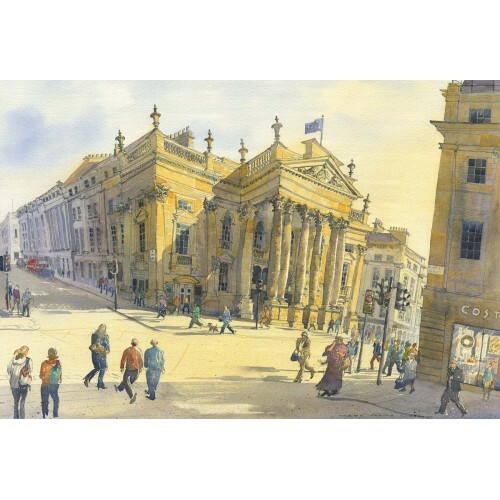 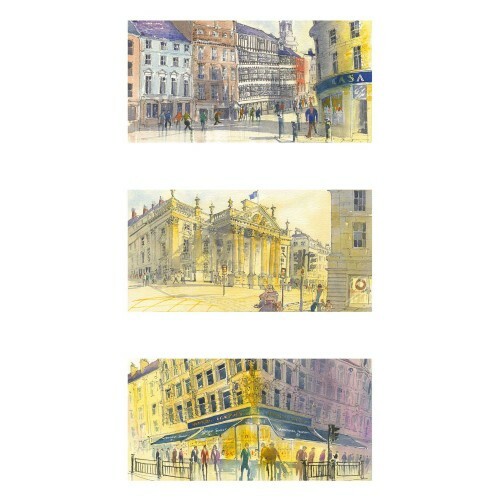 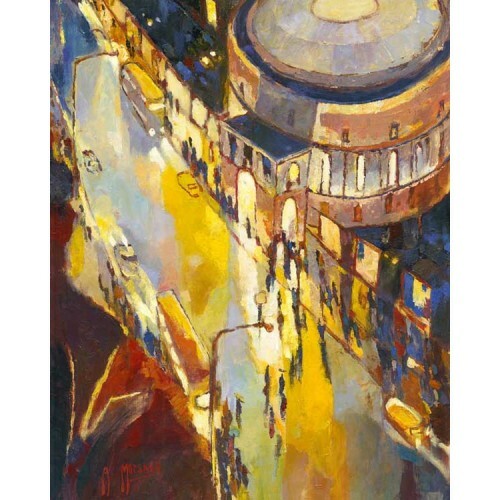 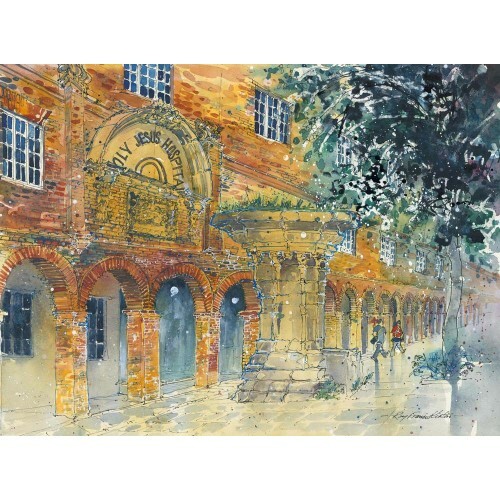 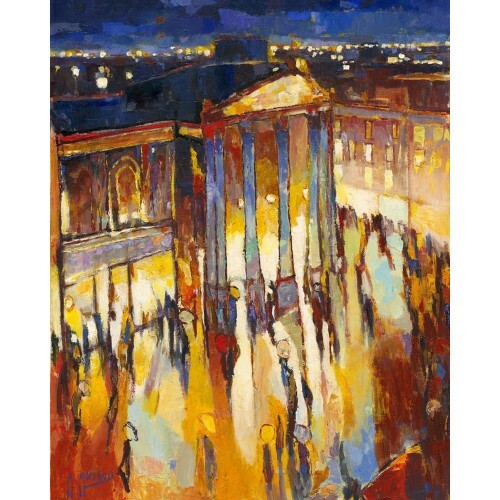 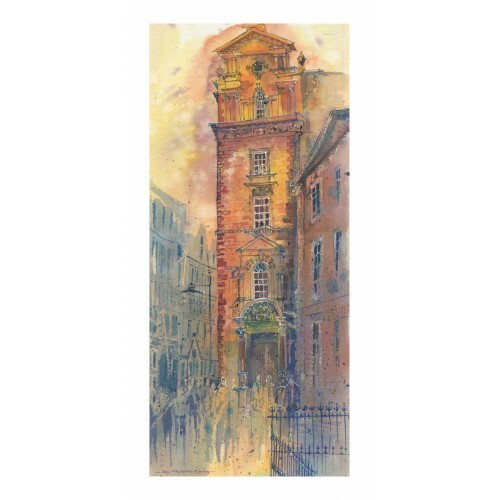 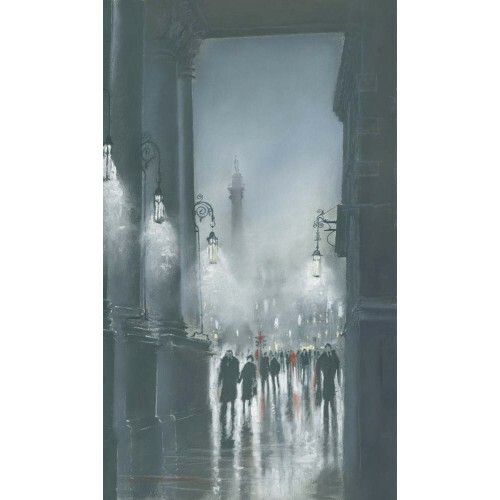 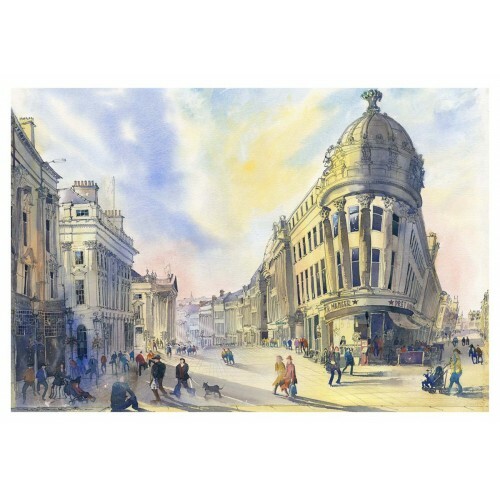 From his collection of new original pastels and limited edition prints Greys monument is visible in the background as theatre goers walk underneath the Theatre Royal portico. 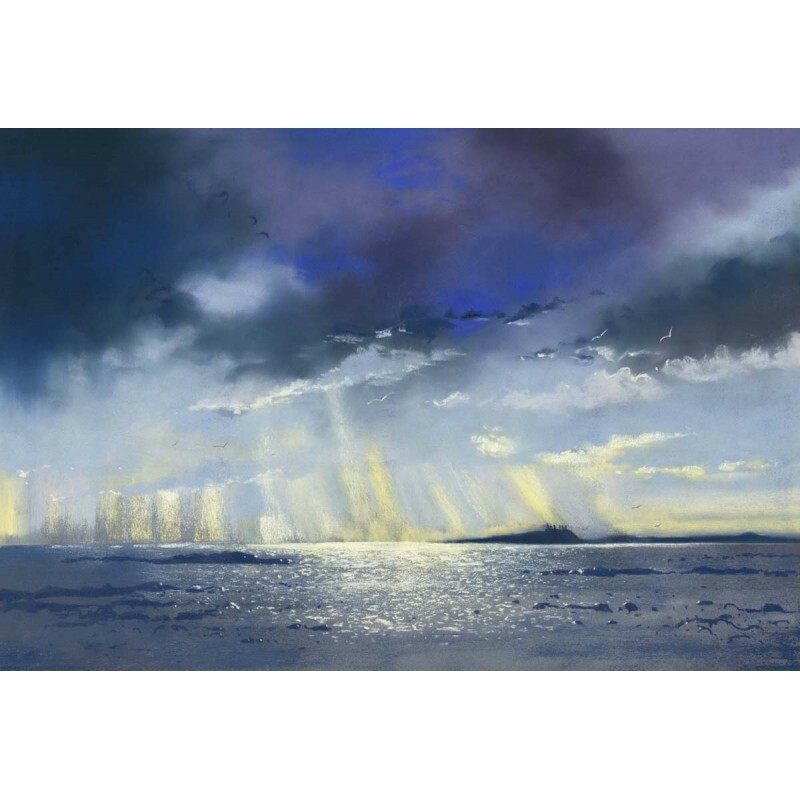 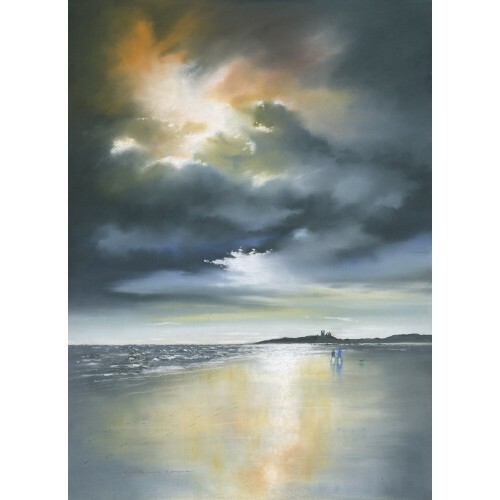 Smaller size mounted and framed print of the Breaking Dawn at Dunstanburgh pastel. 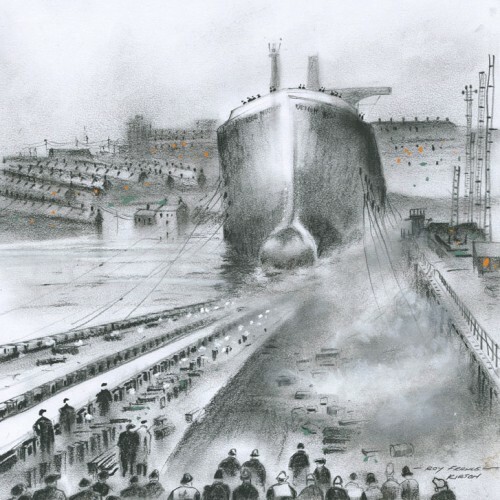 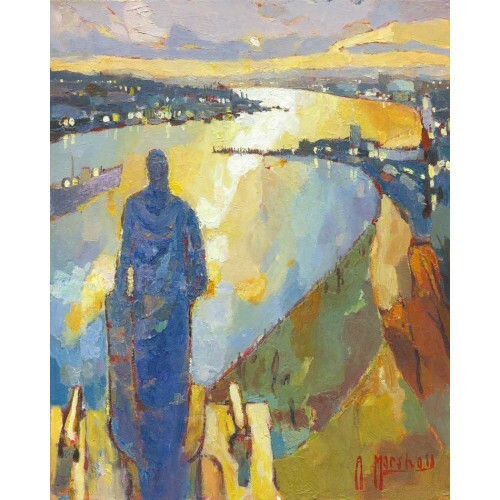 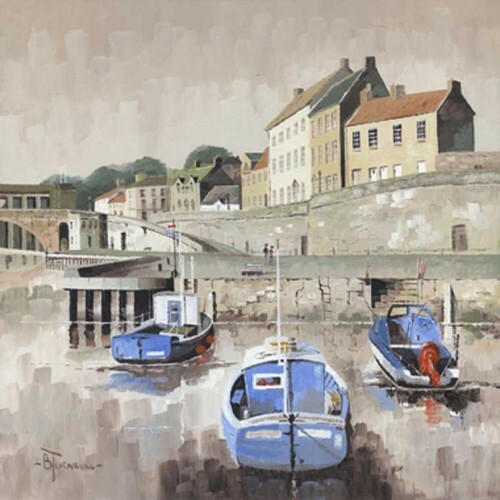 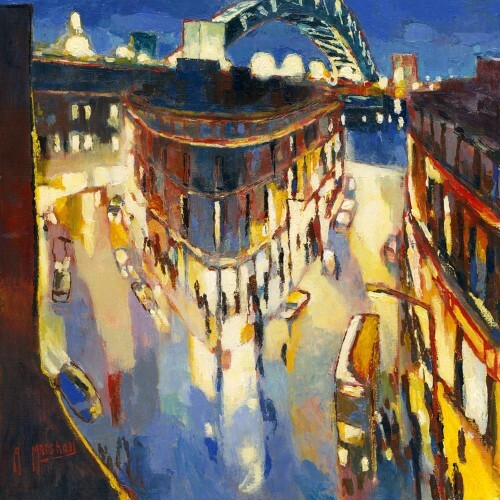 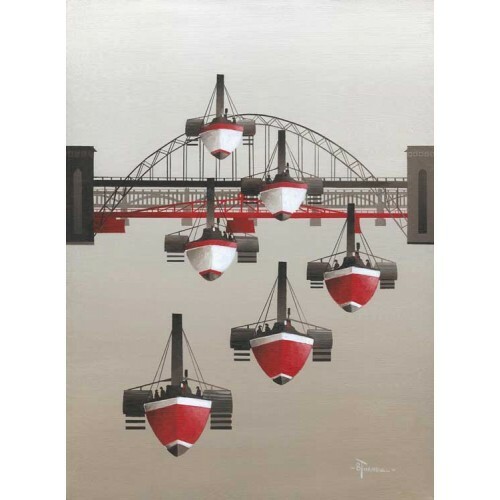 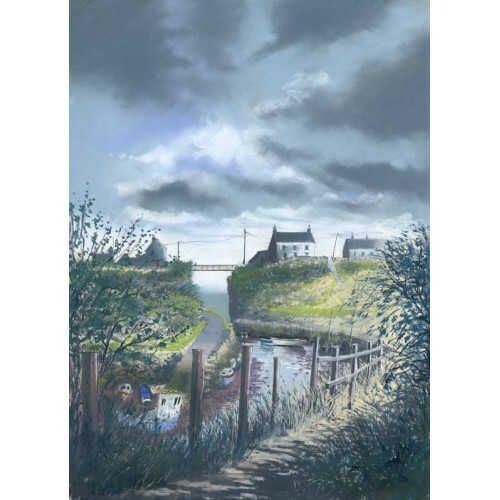 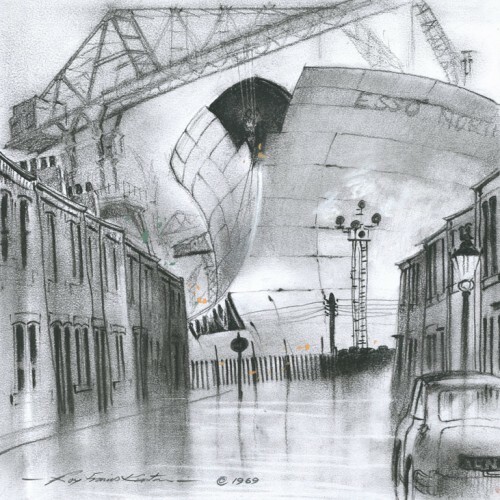 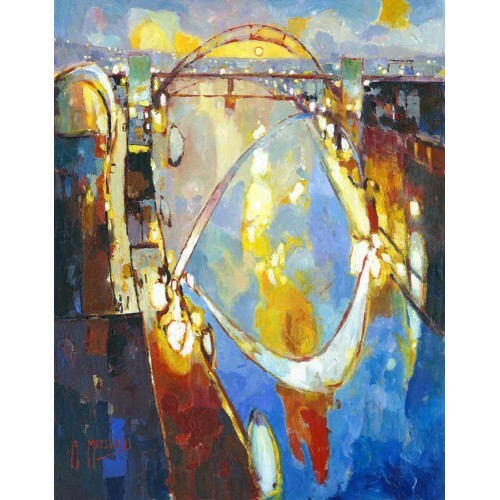 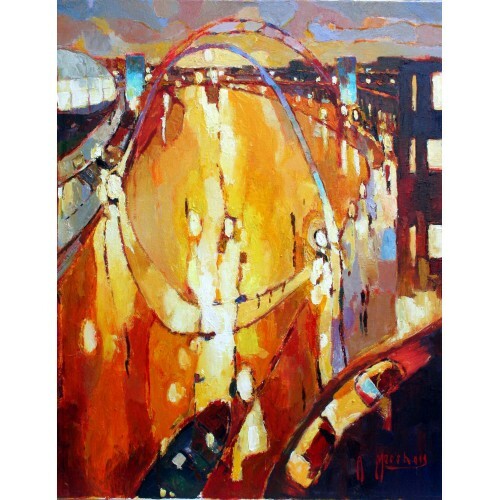 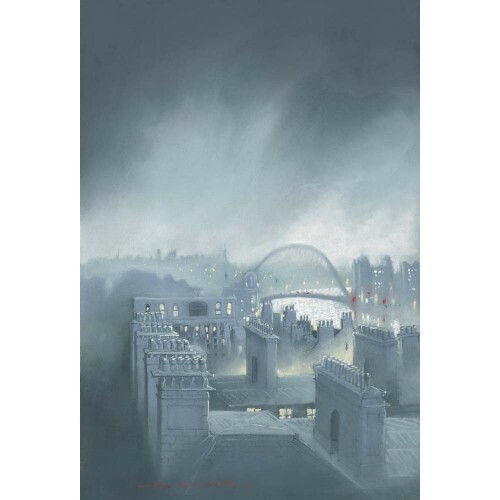 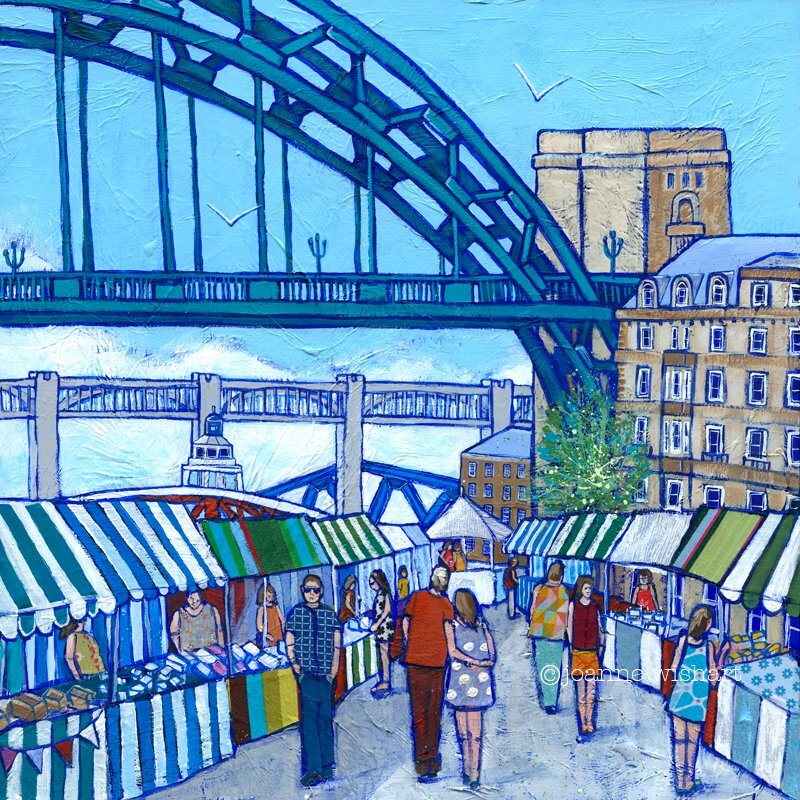 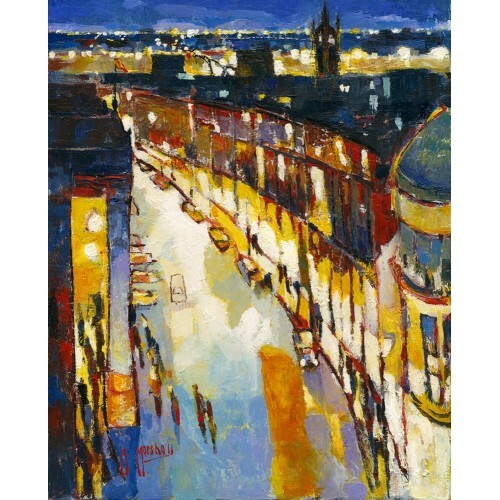 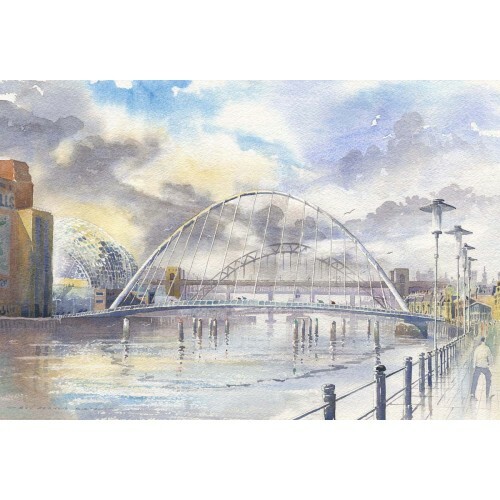 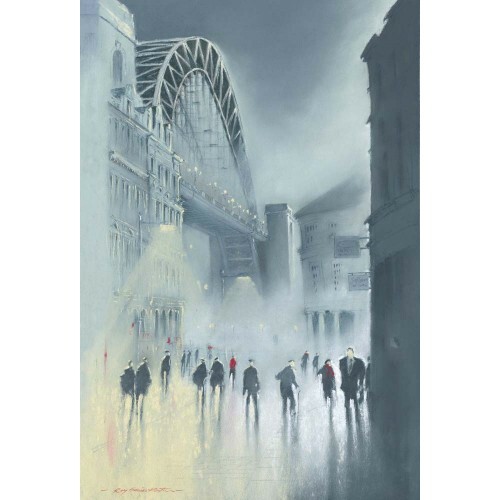 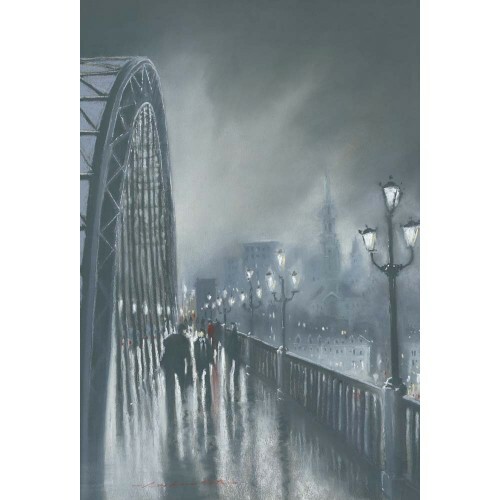 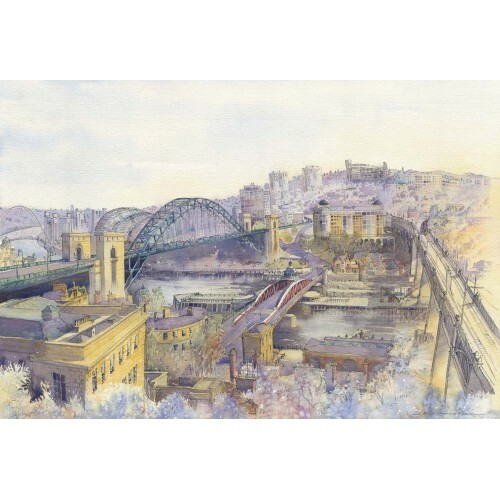 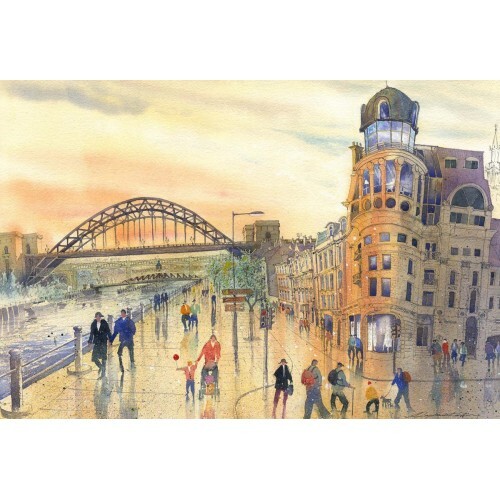 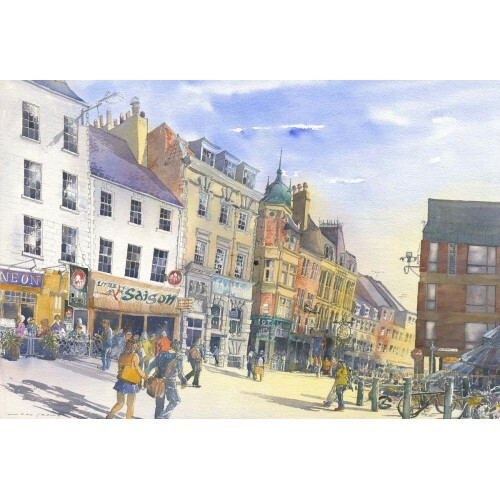 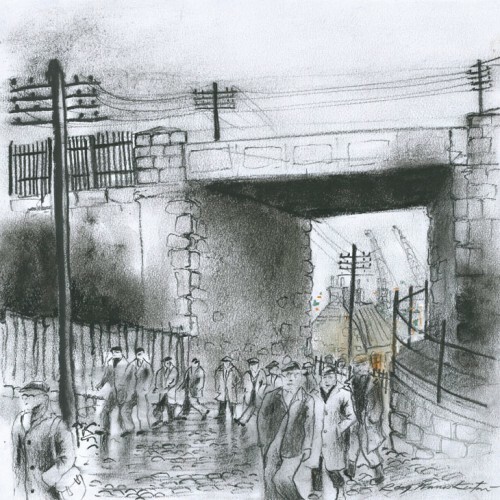 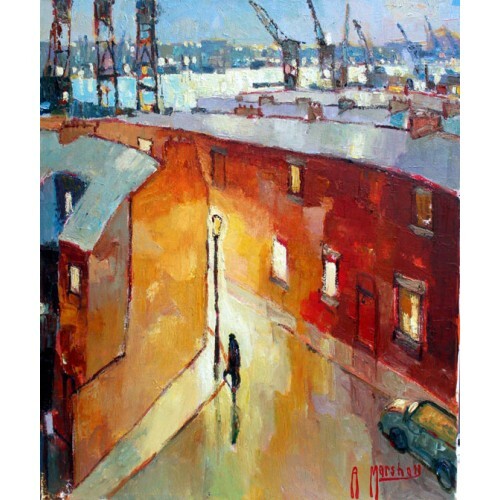 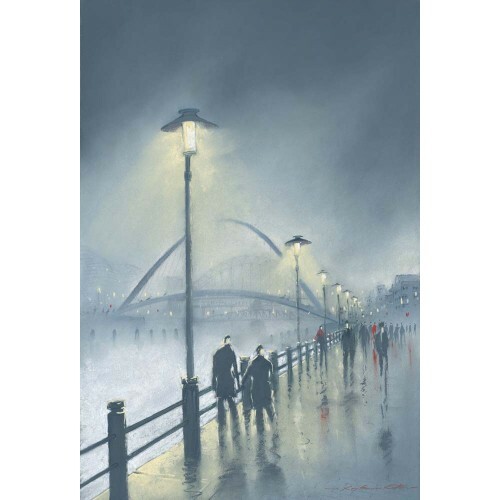 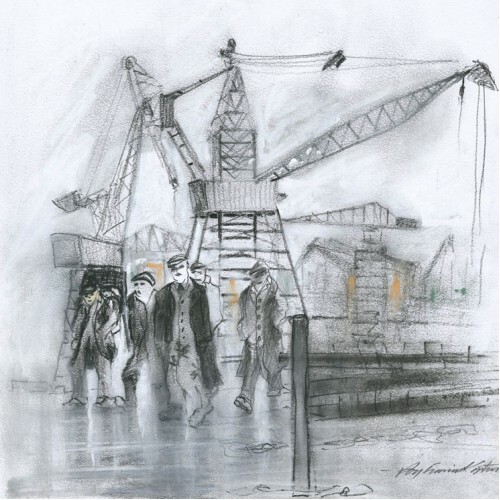 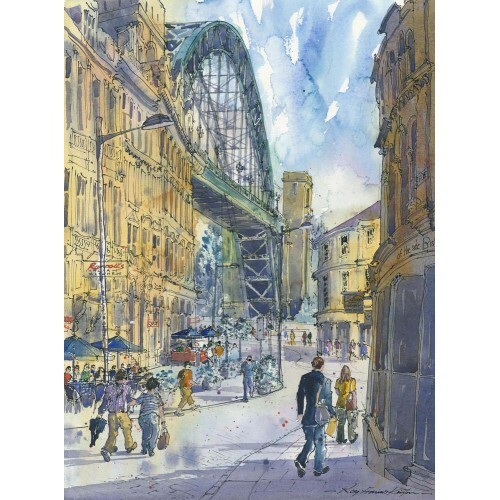 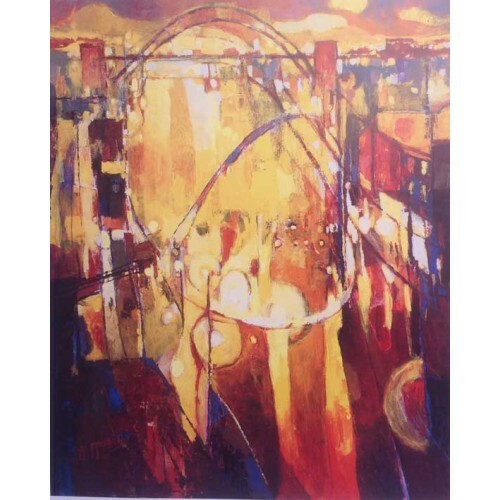 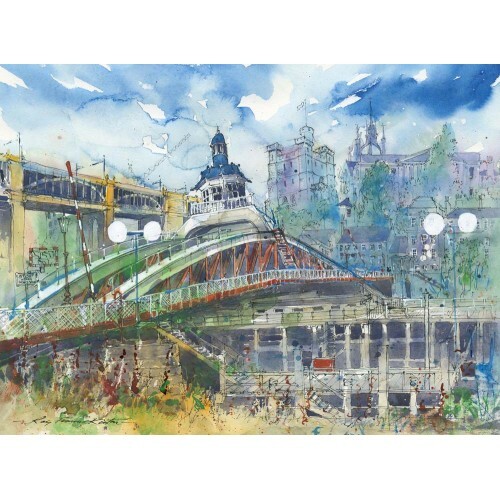 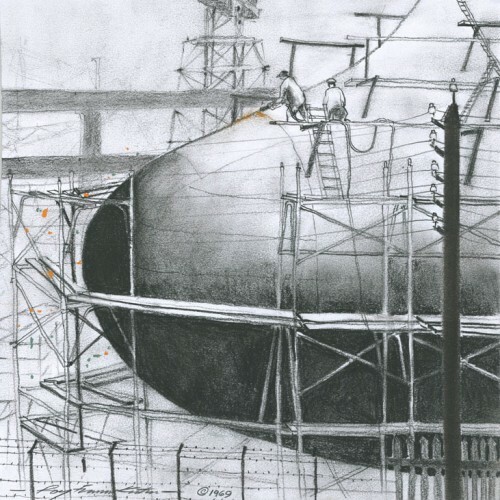 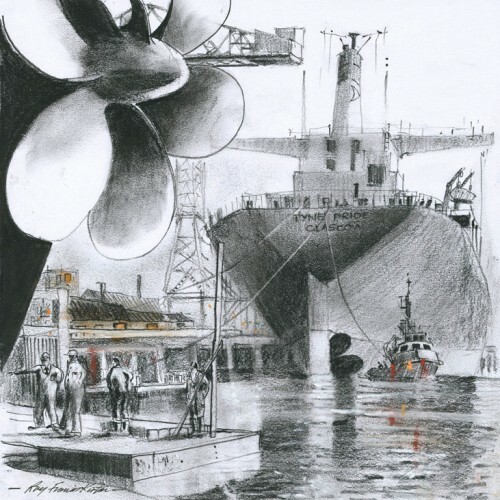 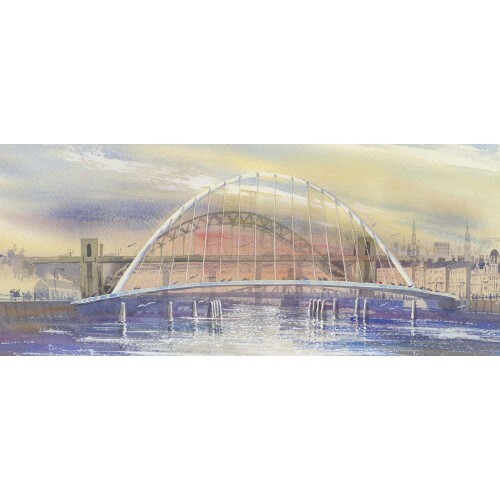 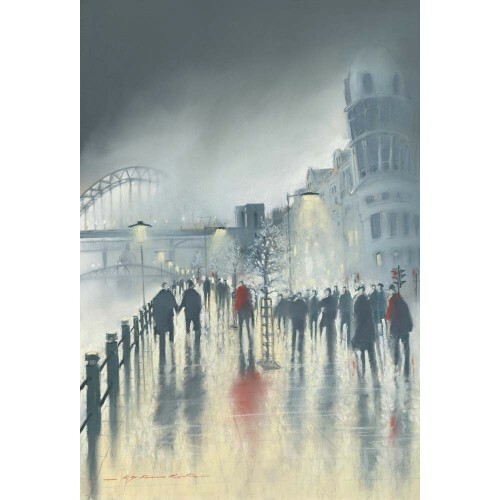 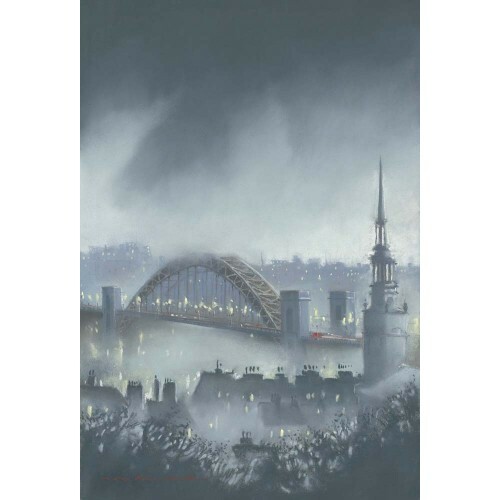 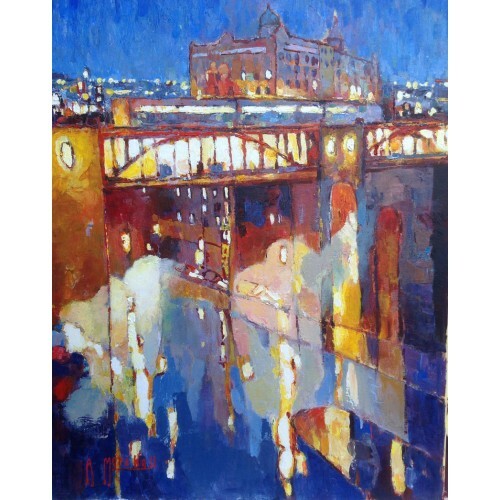 From his collection of new original pastels and limited edition prints The Millennium bridge is visible in the background as people walk along Newcastle Quayside. 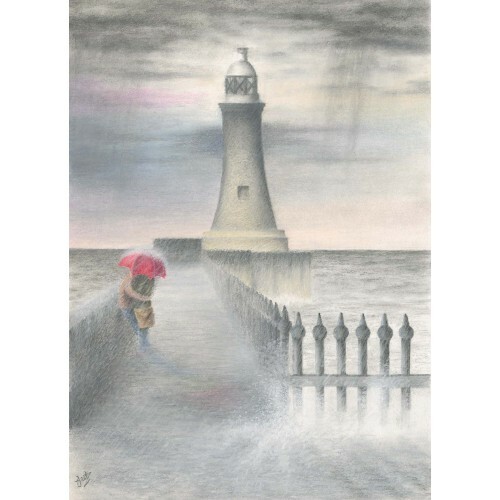 Smaller size mounted and framed print of the Book signing pastel. 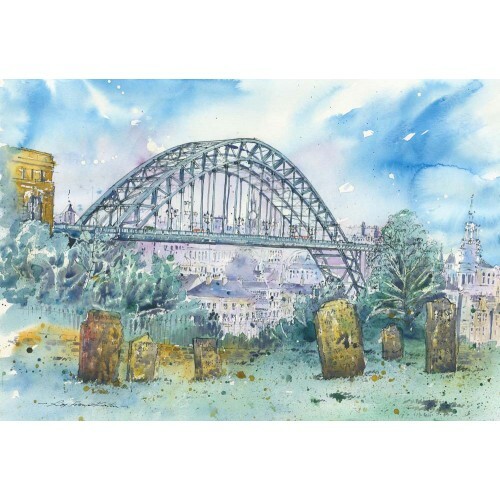 To celebrate the visit by J K Rowling to Emerson Chambers to do a book signing. 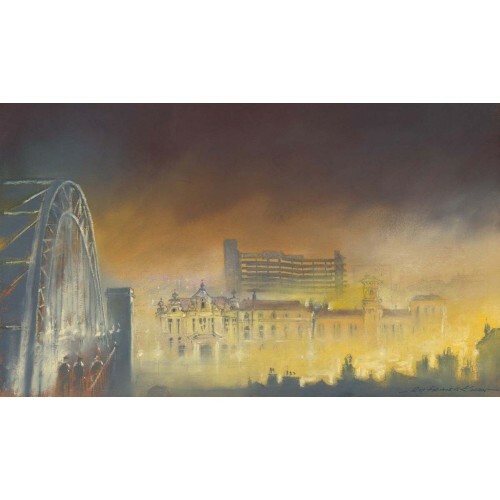 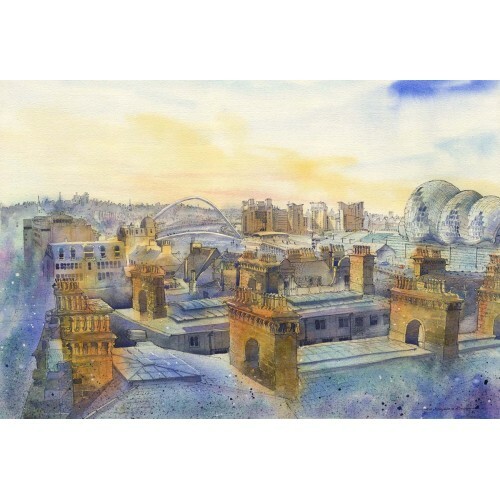 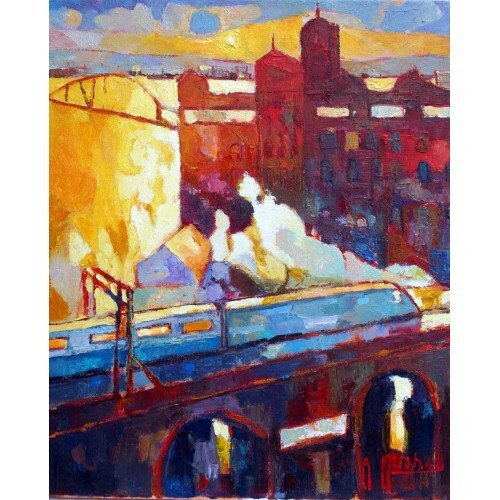 I was commissioned to paint Gateshead Town Hall and every time I crossed the Tyne Bridge I kept getting great views of the ‘Get Carter’ car park and the old Gateshead library, so I thought it would make an interesting painting. 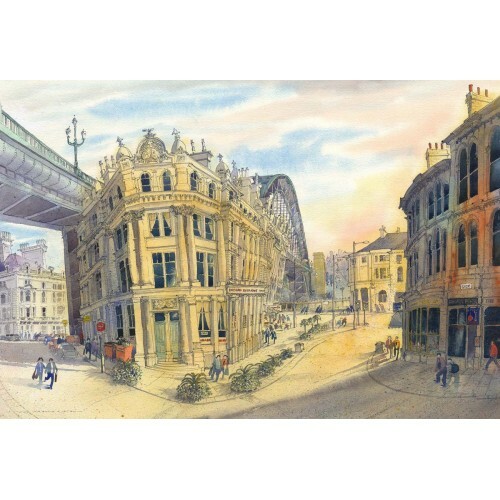 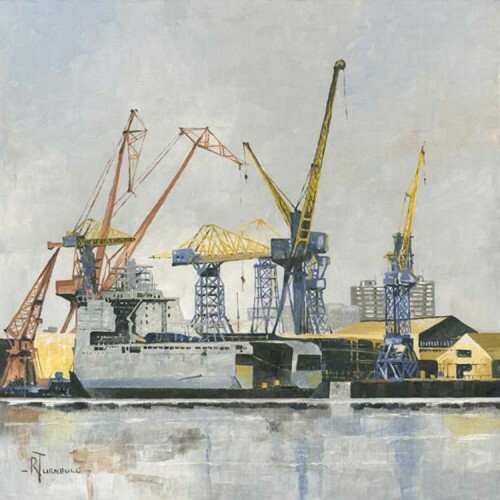 The car park was demolished in 2010 and in many respects this painting is a true record of how it was until 2010. 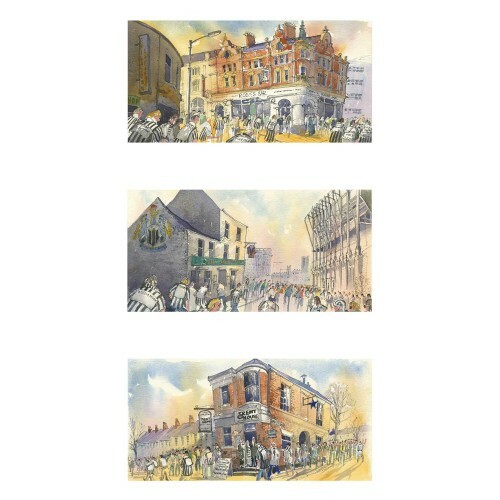 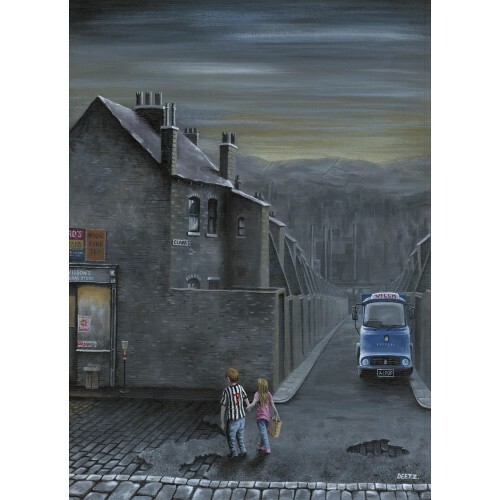 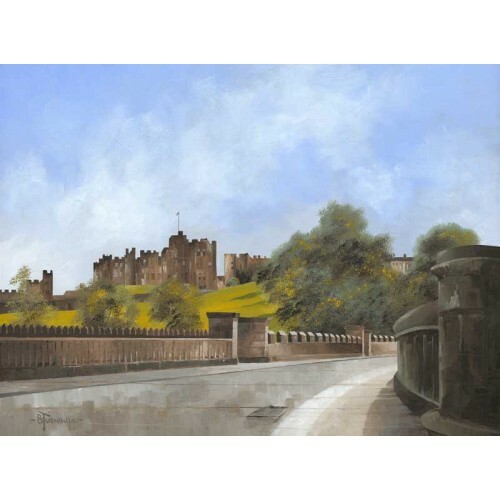 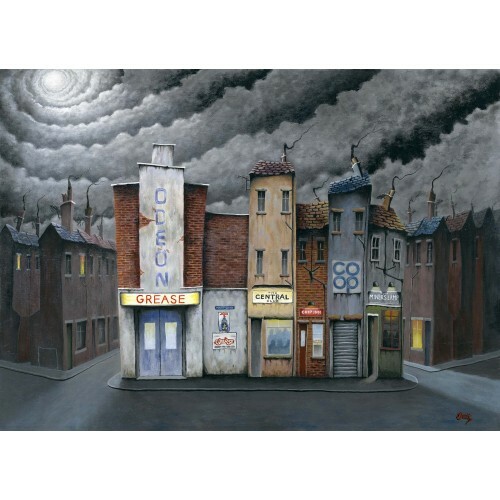 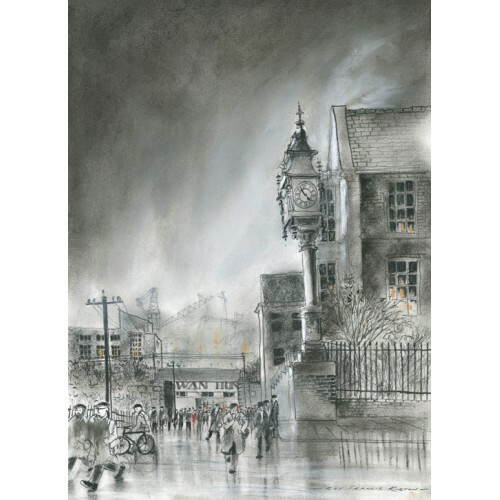 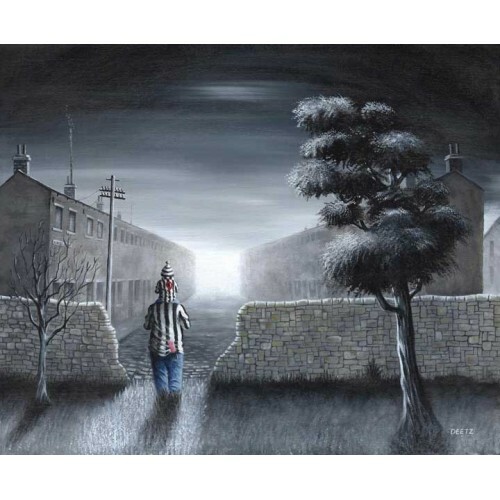 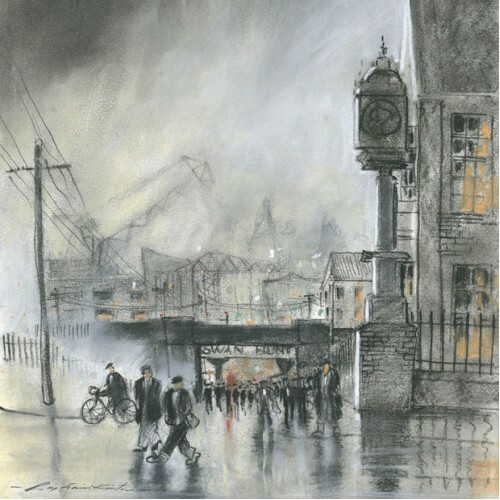 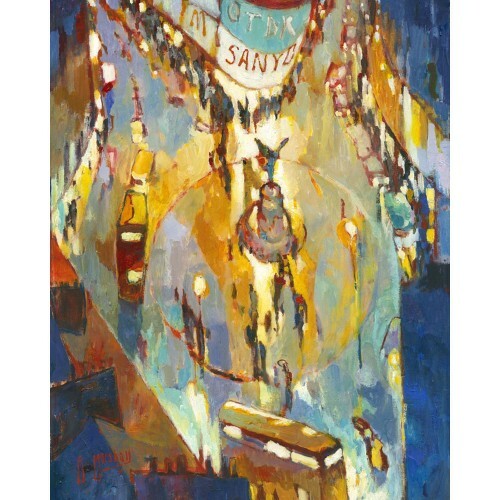 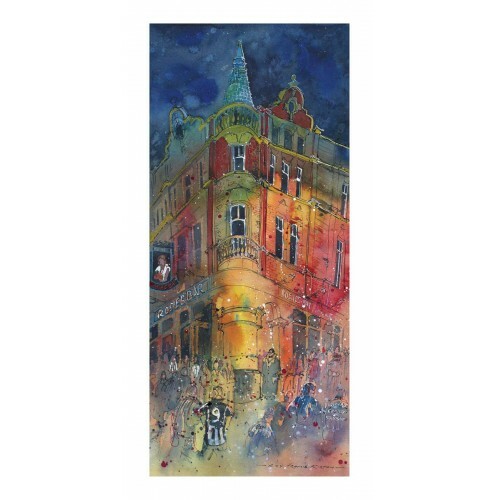 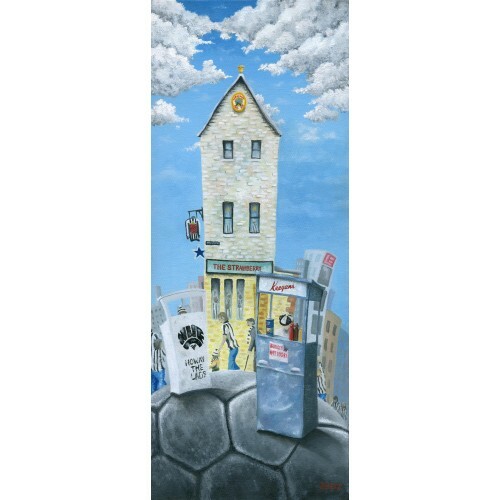 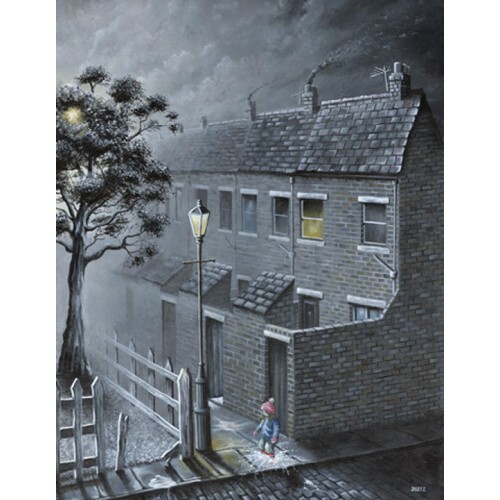 The painting depicts the crowd at Rosie’s Bar, The Strawberry and The Trent House all close to the ground and famous gathering points for Newcastle United fans.